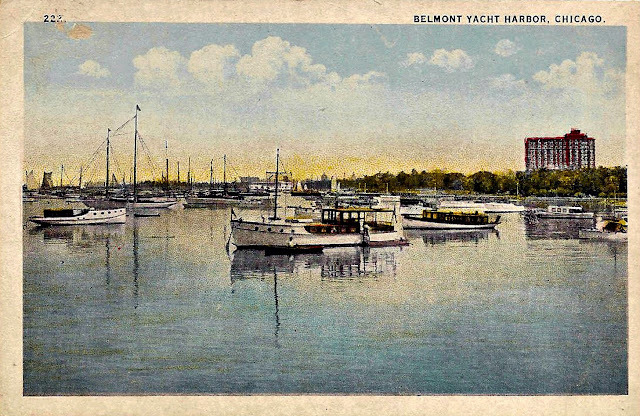 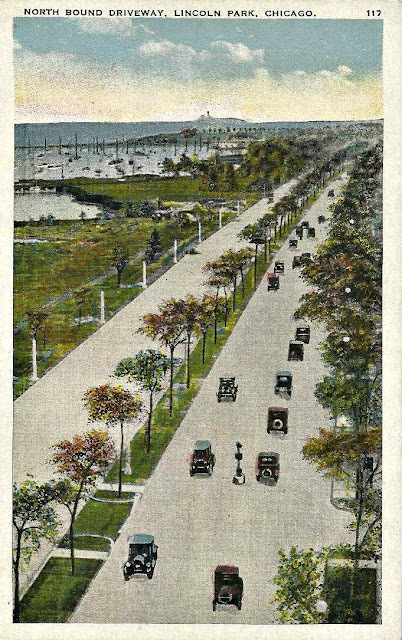 The yacht harbor at Belmont Avenue was opened to the public in 1913. 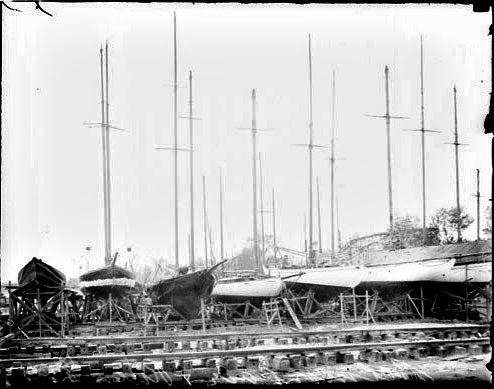 Moorings were laid out, and a lighthouse constructed. A dock 911 feet long was also built." 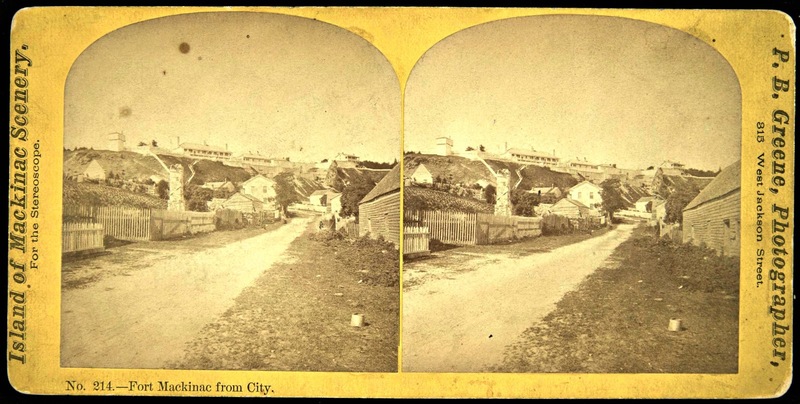 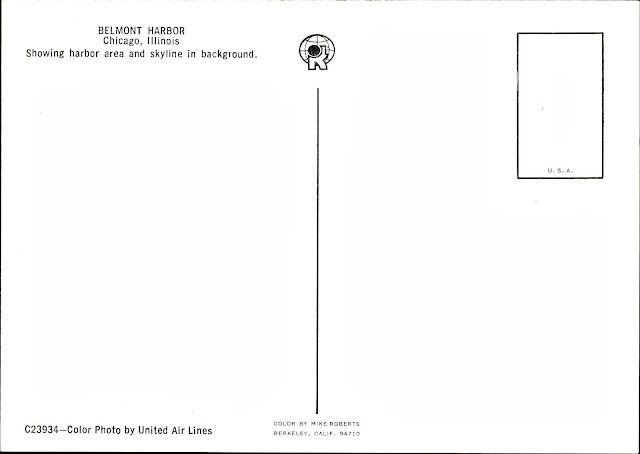 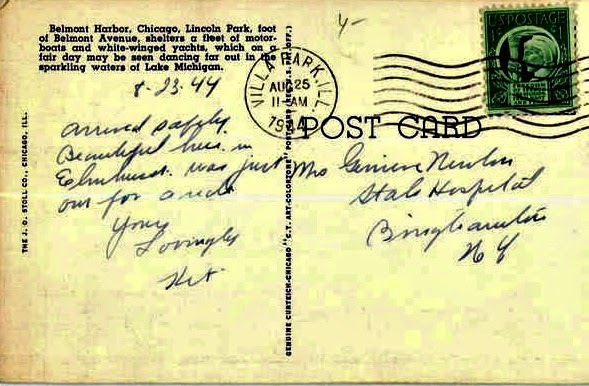 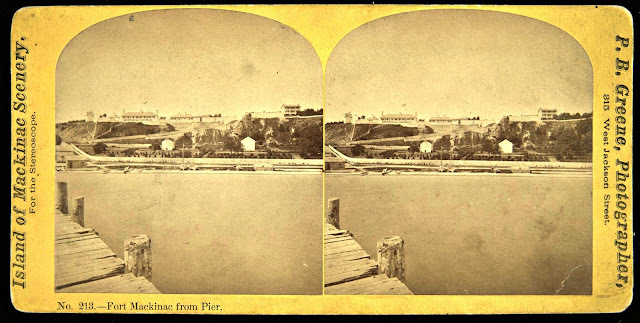 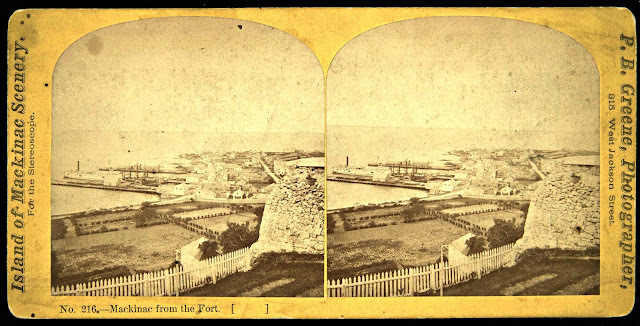 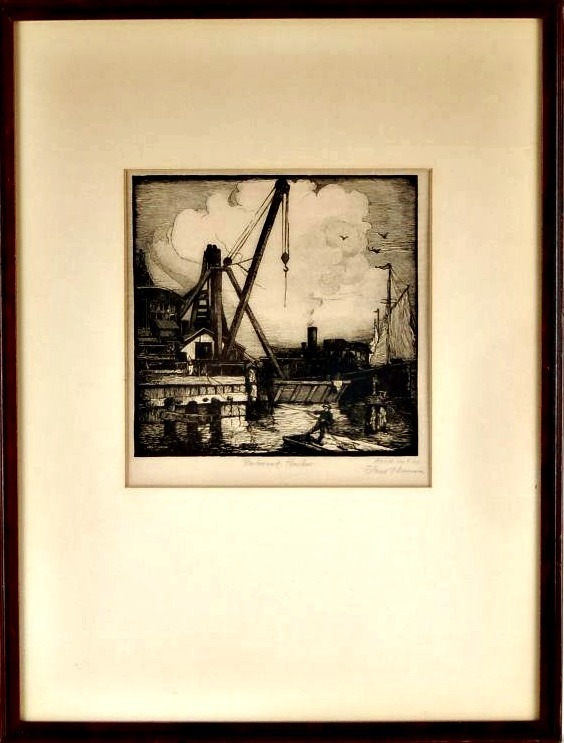 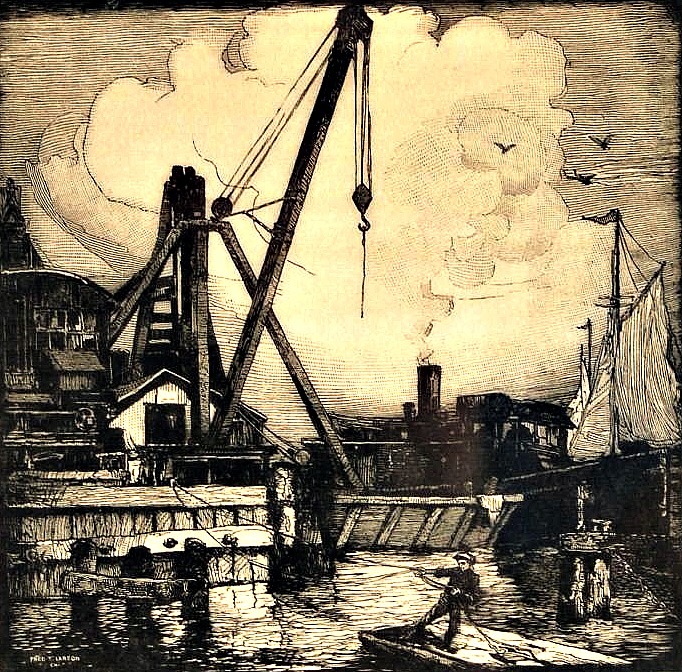 There appears that the original lay-out of the harbor had a bridge to the northern end of it per the above postcard. 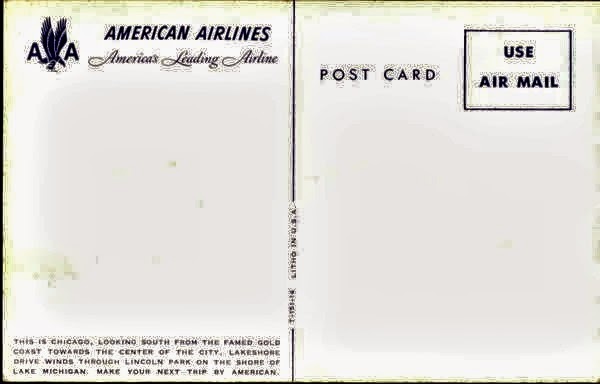 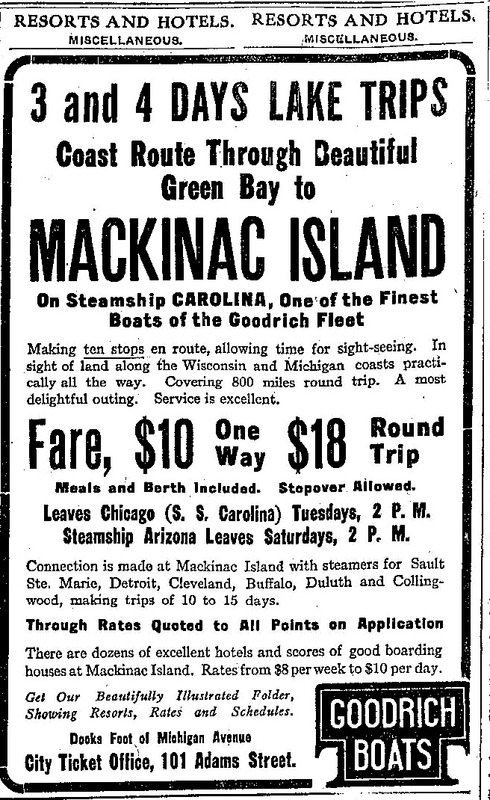 I noticed this with another image shown below that was inserted in a 1925 advertisement. 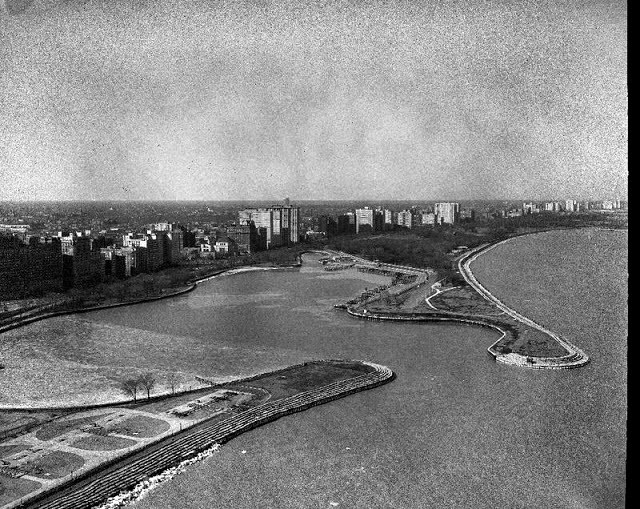 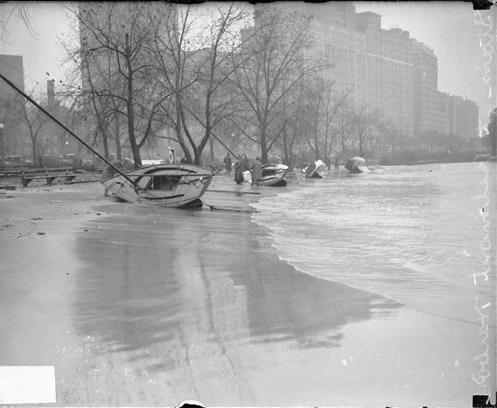 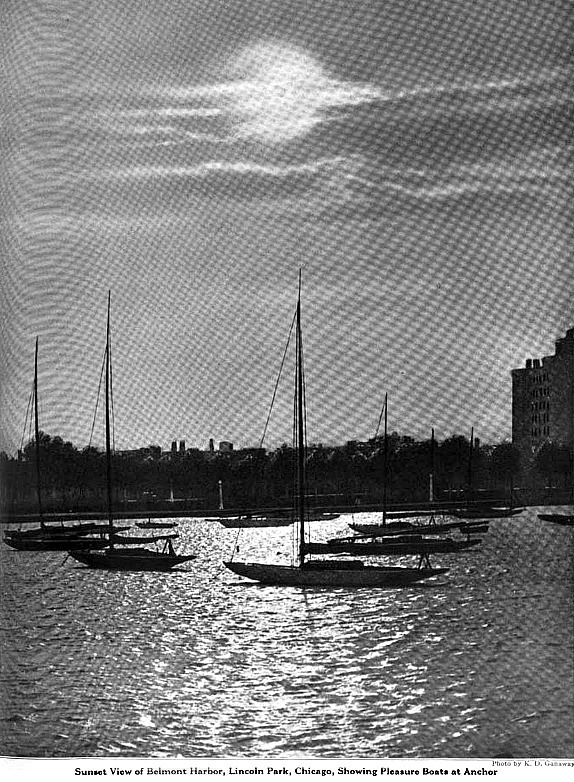 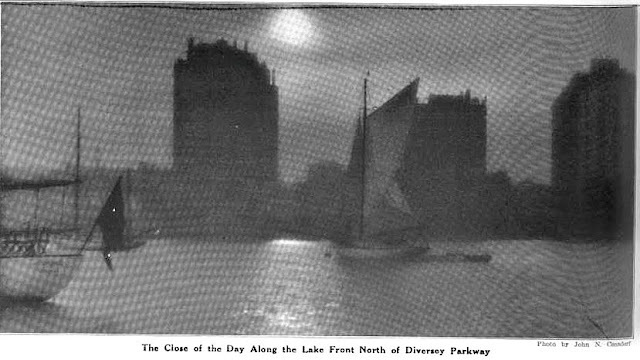 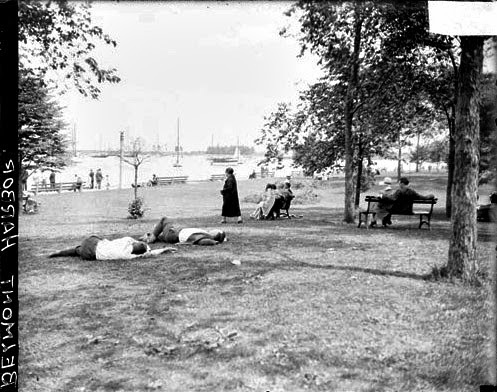 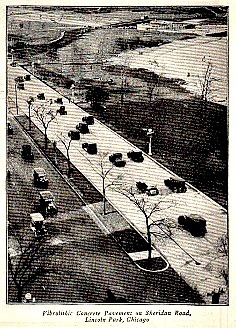 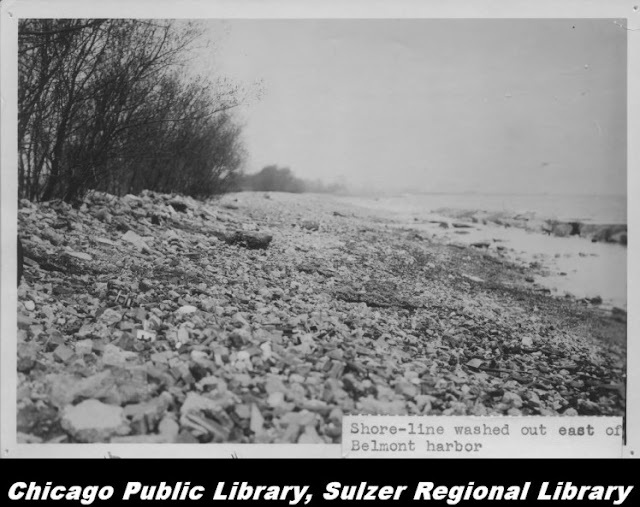 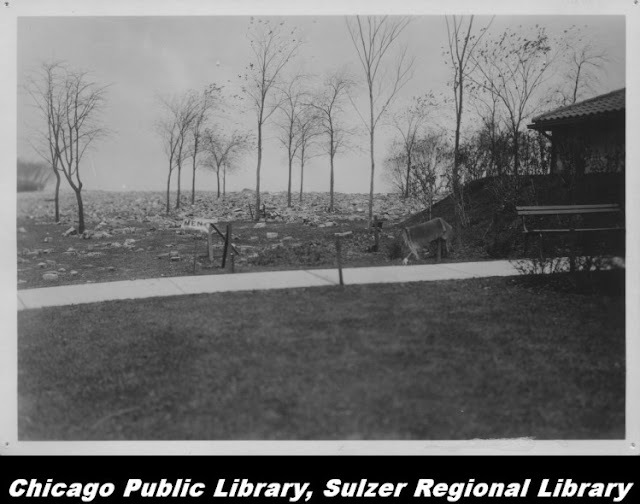 These scanned black & white photos are from a publication called 'Dearborn Magazine' published in 1922 of the scenes along the lakefront from Diversey to Belmont Harbors. 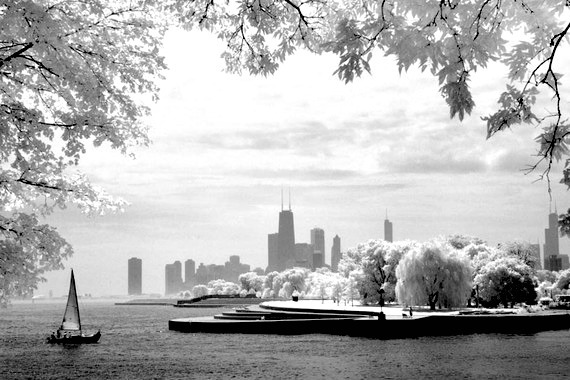 During this time period Lincoln Park was land-filled no further north than Cornelia Avenue. 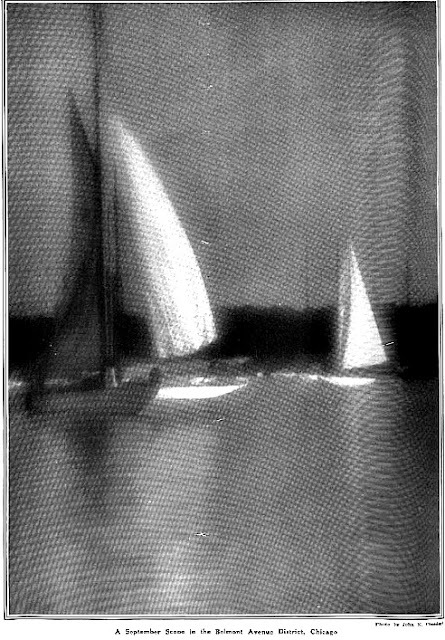 The pages of this magazine were scanned by Google making an impressionist view of each photo. 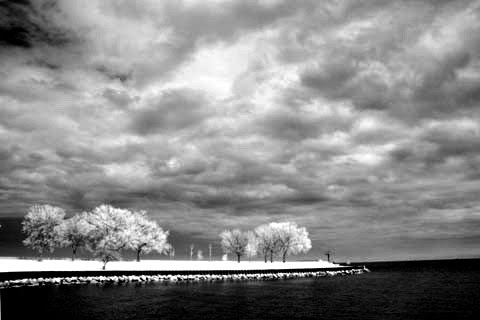 I edited the images with PicMonkey. 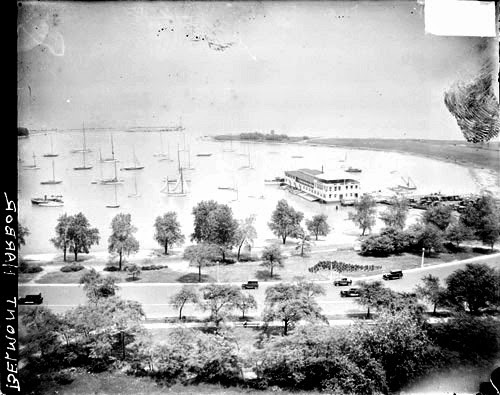 In 1920 Chicago Yacht Club and the Lincoln Park Yacht Club combined that included Diversey & Belmont Harbors to a united system. 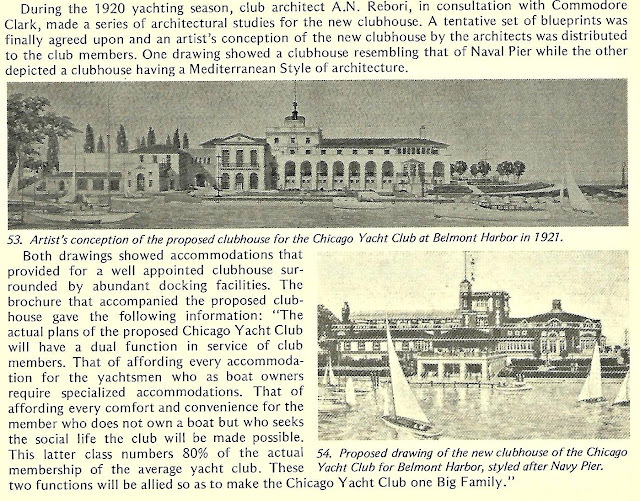 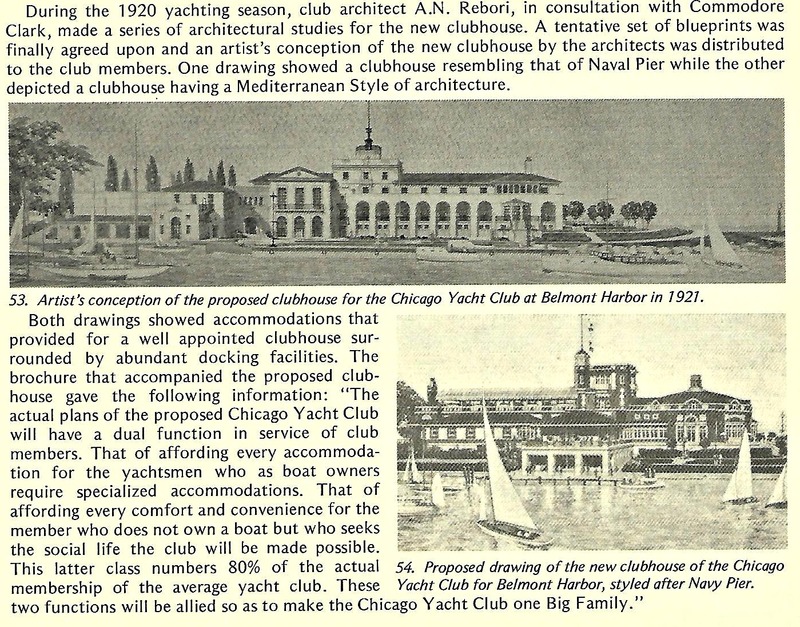 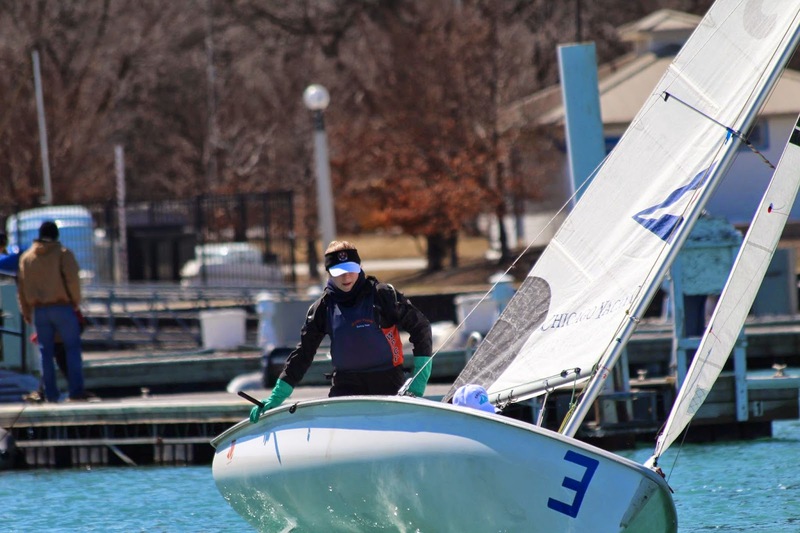 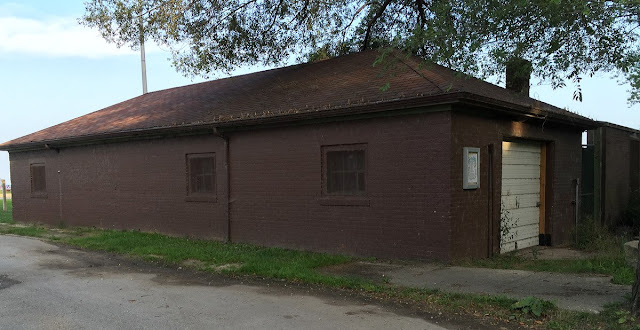 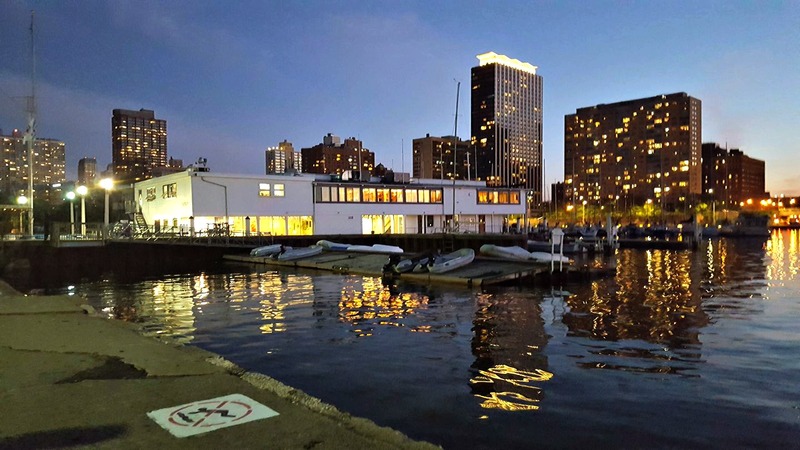 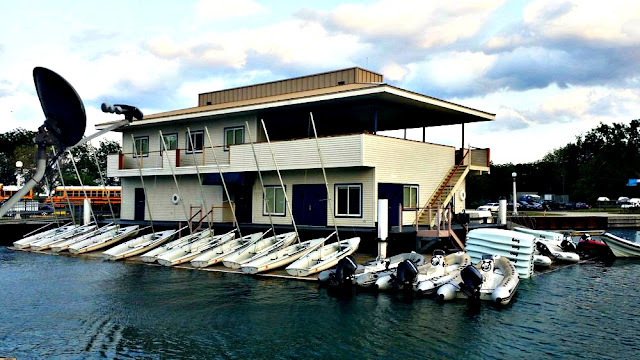 The next year a new clubhouse at Belmont Harbor replaces the lumber schooner Carrier, that had served as the Lincoln Park Yacht Club clubhouse since 1915. 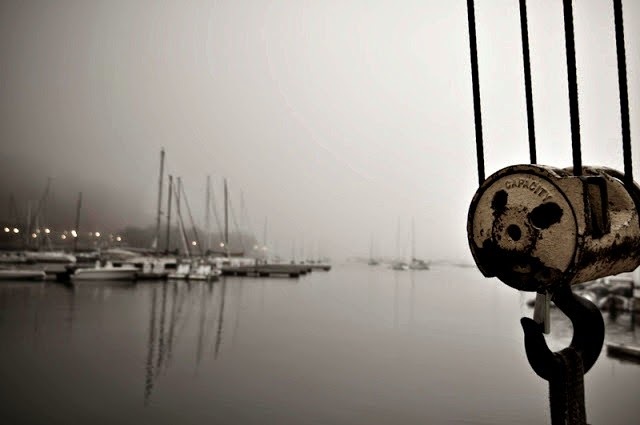 Almost every harbor has a club or boathouse to booked activities for the purpose of entertainment. 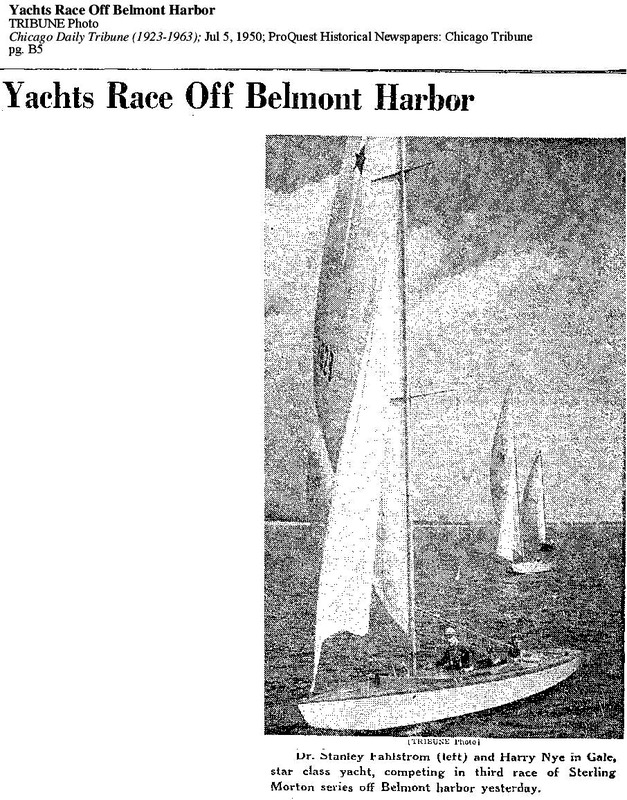 Belmont Yacht Harbor was of no exception. 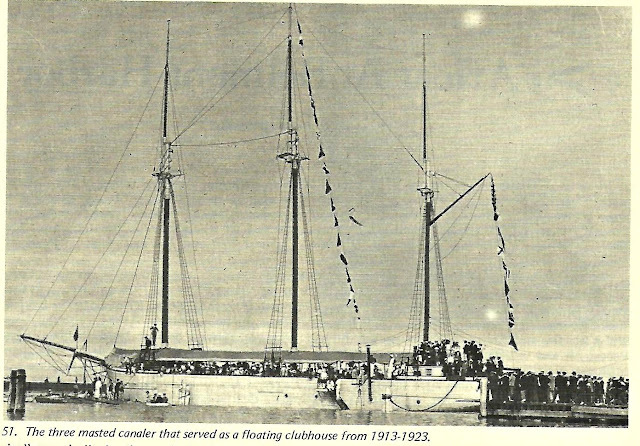 The original boathouse like the one above was mobile and sailed from its perth into the lake - view above photo of craft. 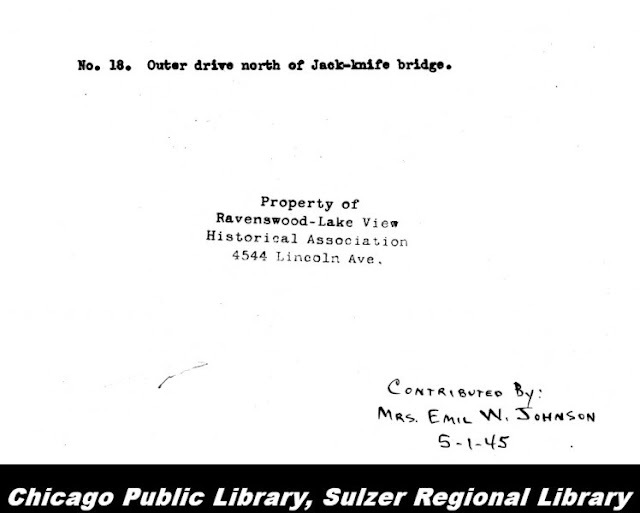 Sulzer Regional Library can not confirm nor deny that this is the original boathouse but only indicated that this is the type of craft that would have been used at the time. 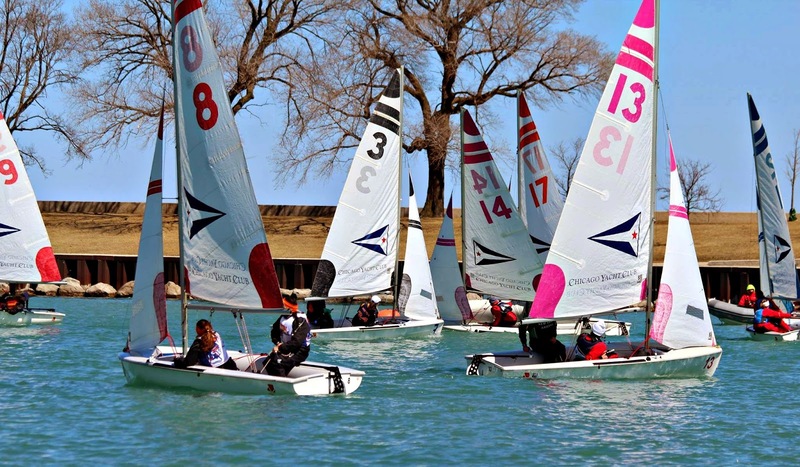 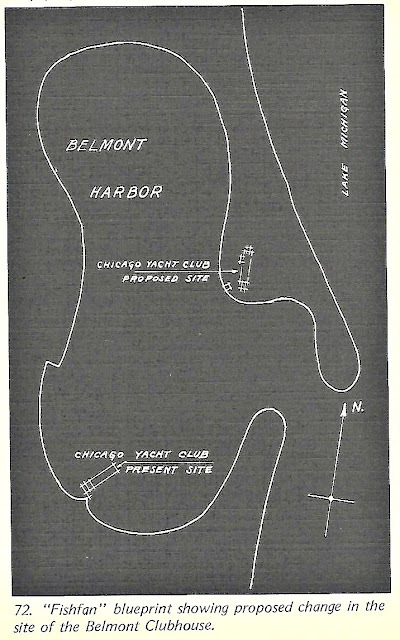 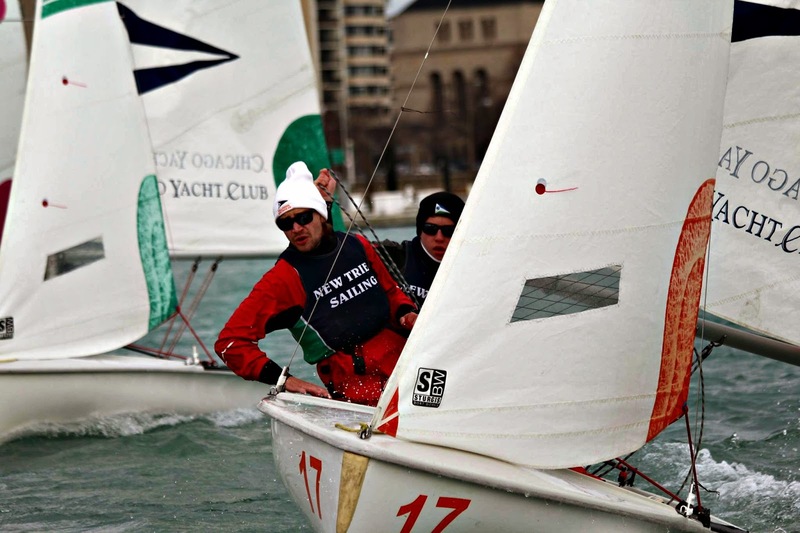 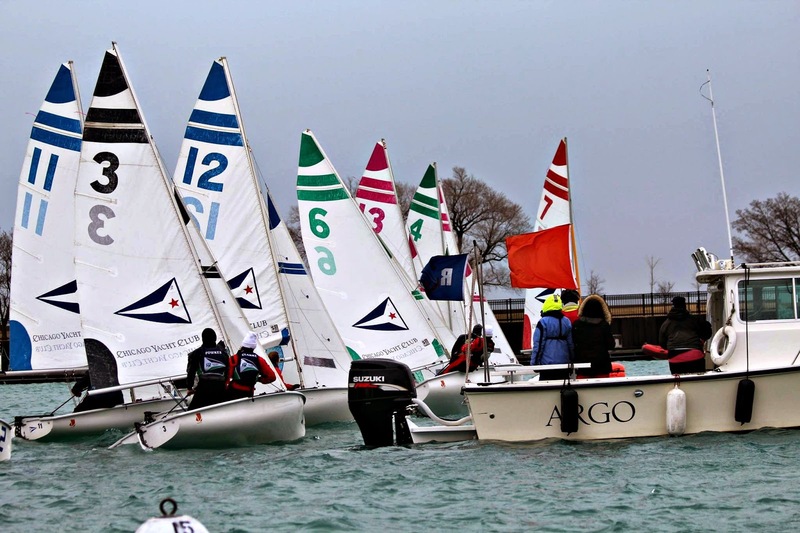 The Chicago Yacht Club has two location. 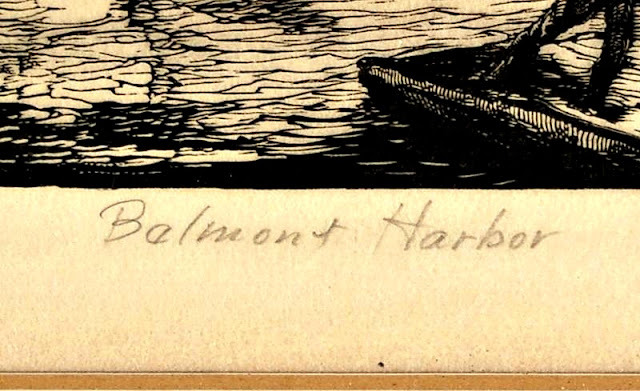 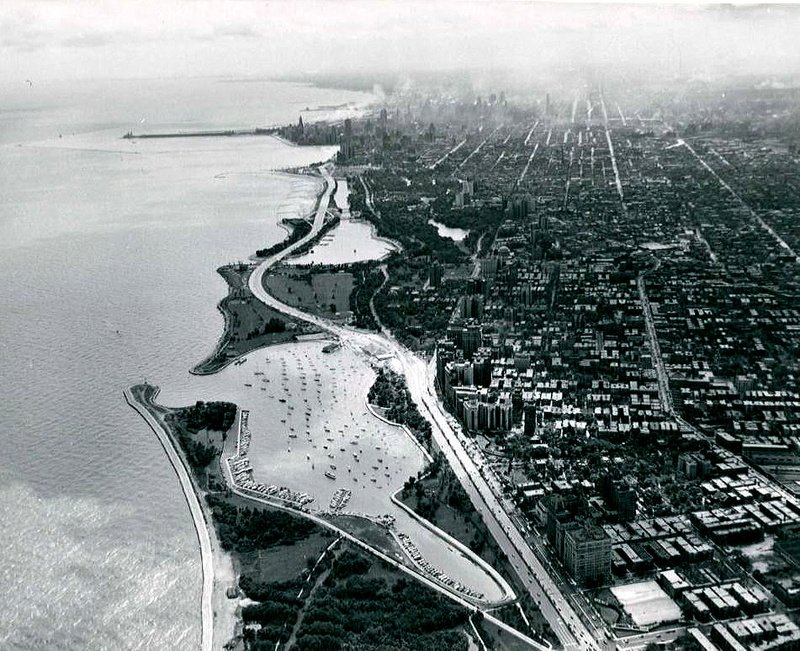 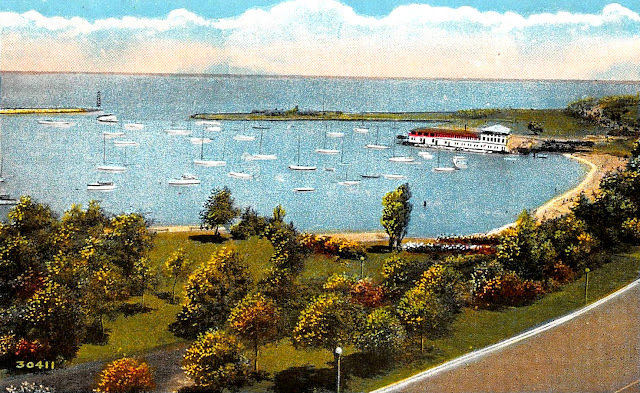 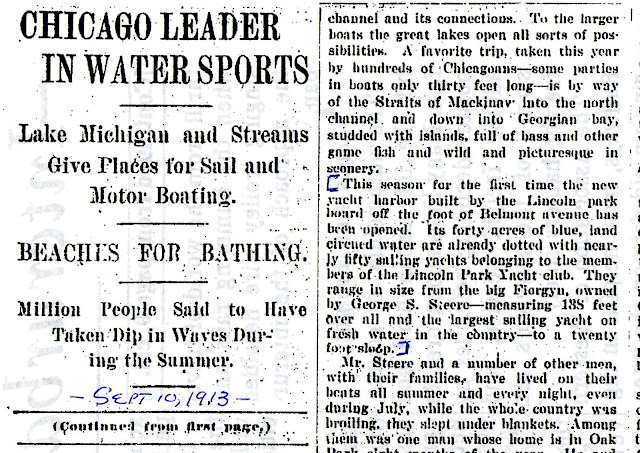 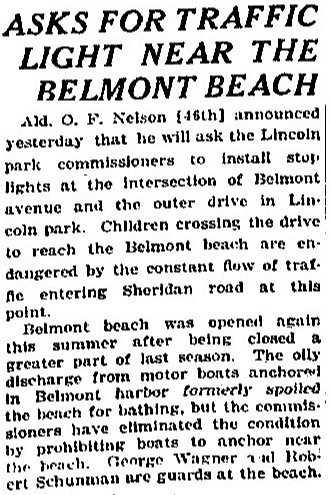 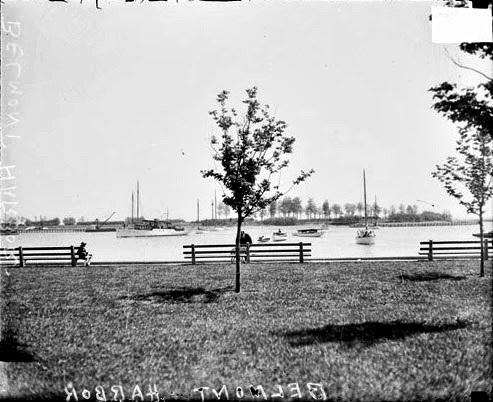 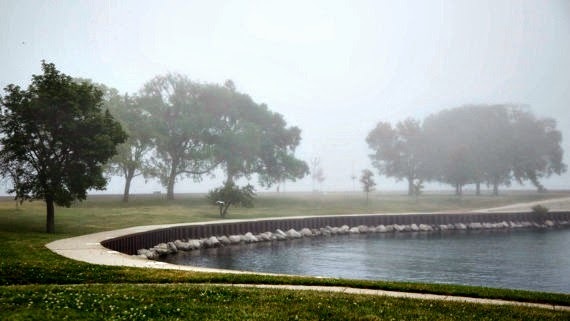 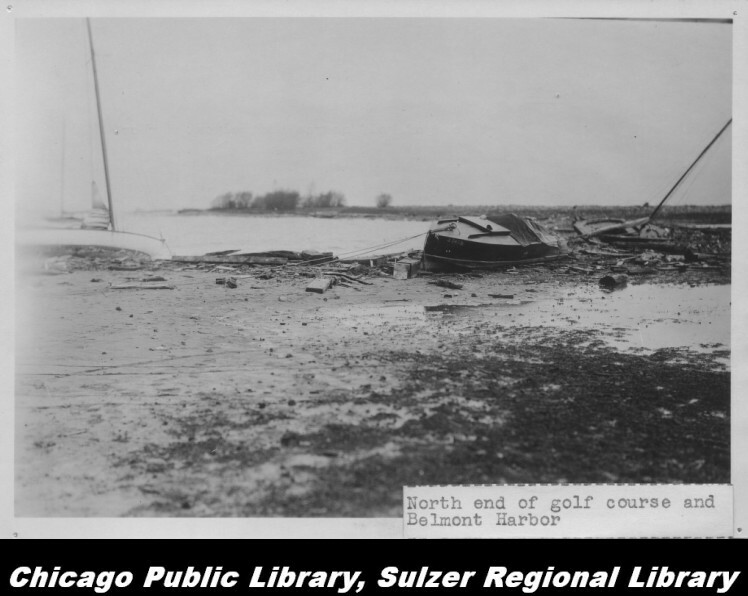 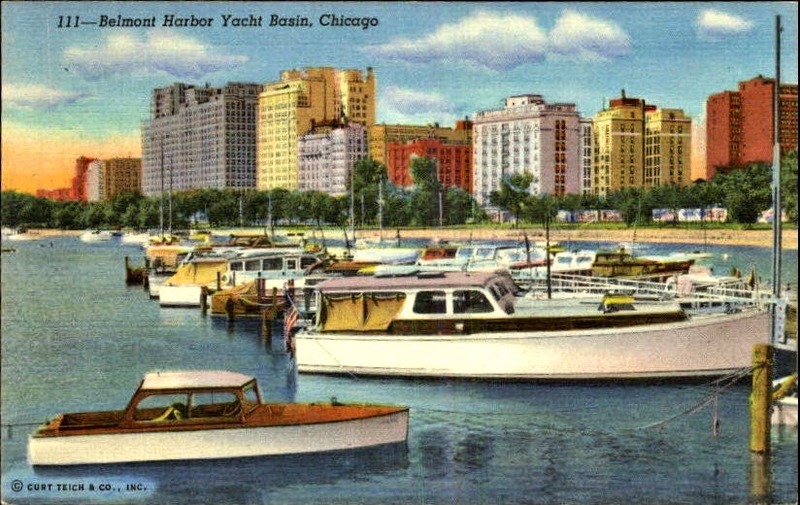 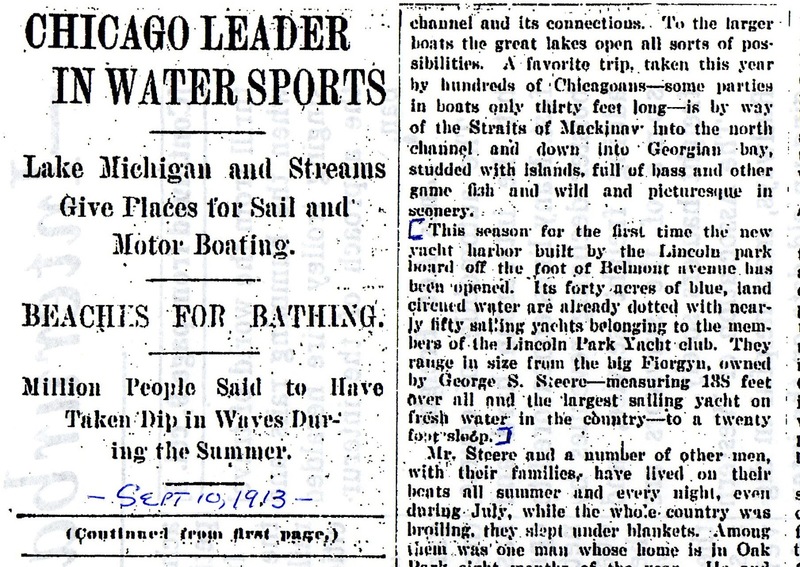 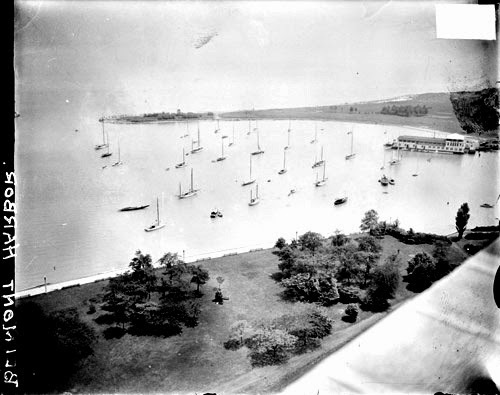 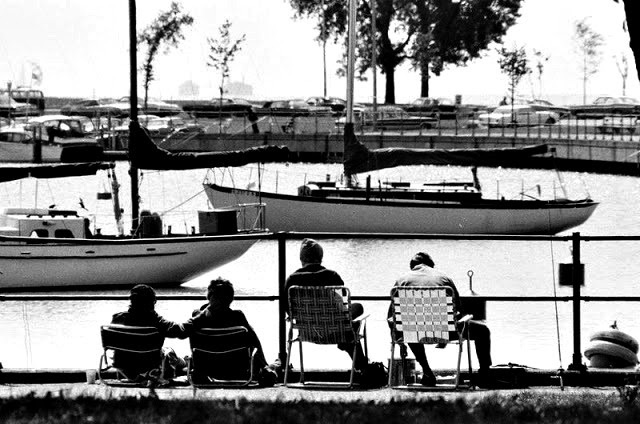 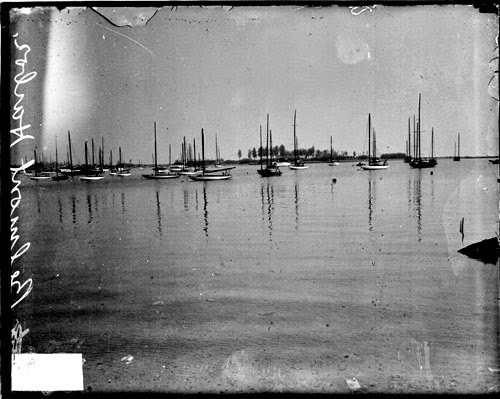 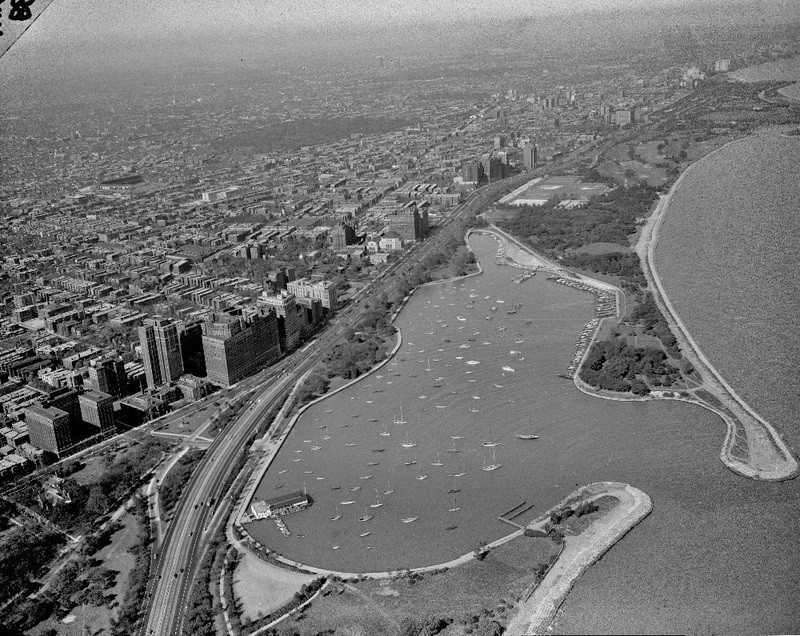 Belmont Harbor was open to the public in 1913 and part of the Lincoln Park Yacht Club. 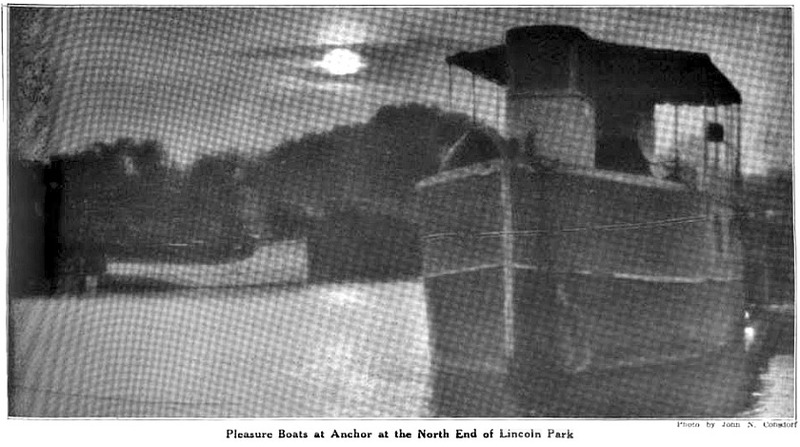 By 1920 the Monroe Yacht Club and Lincoln merged. 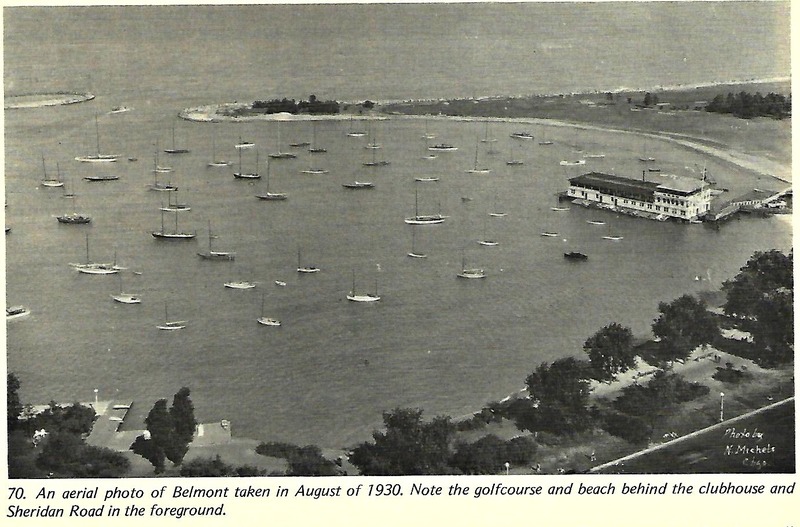 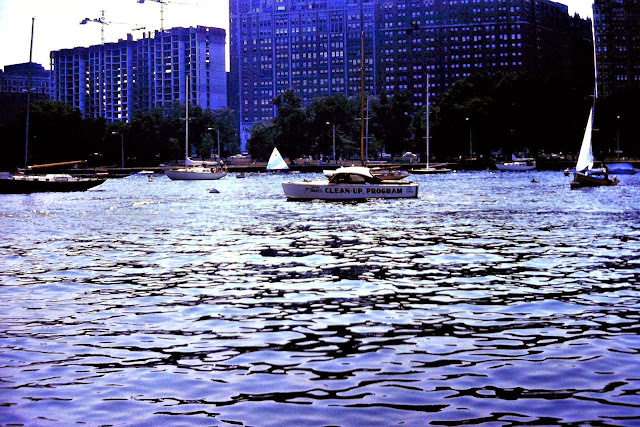 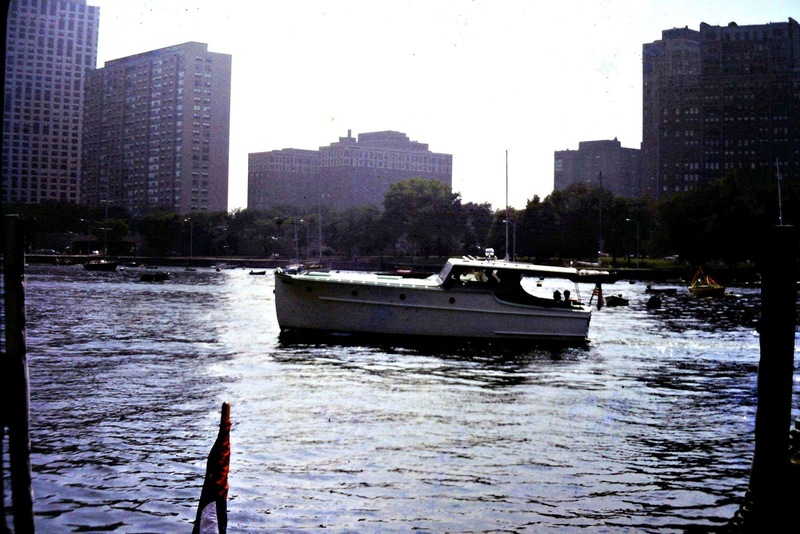 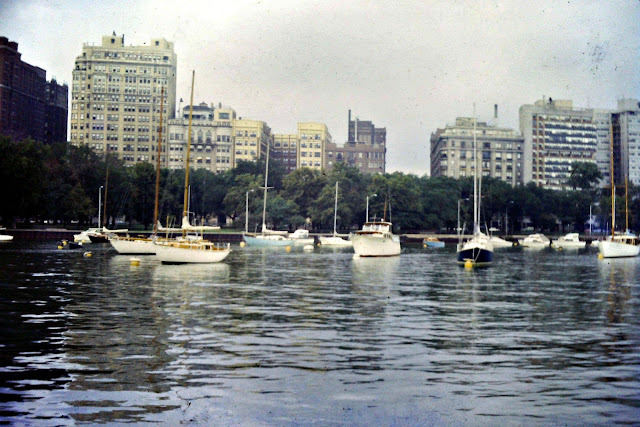 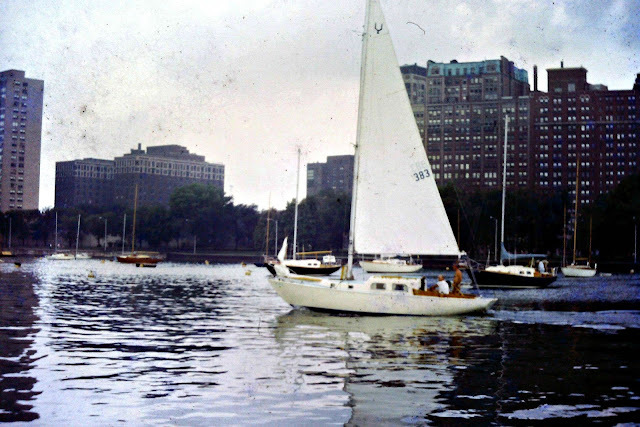 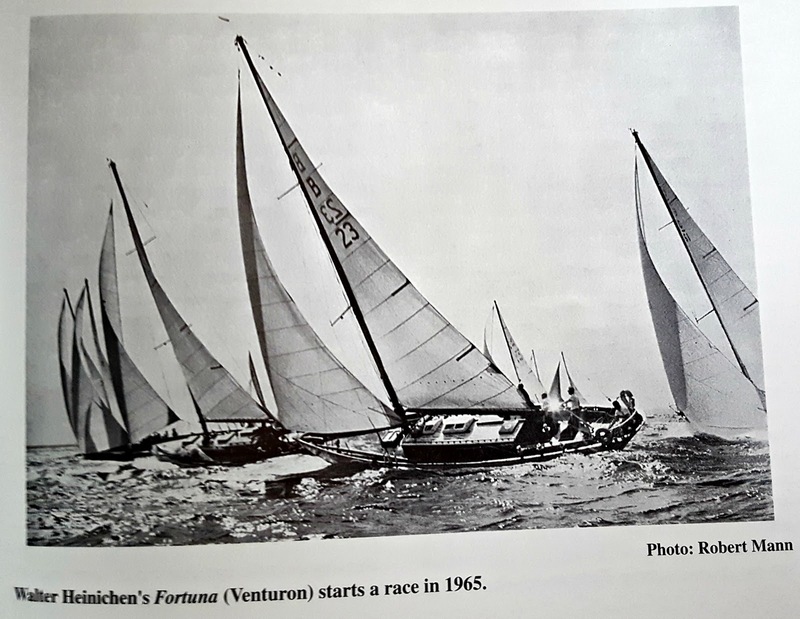 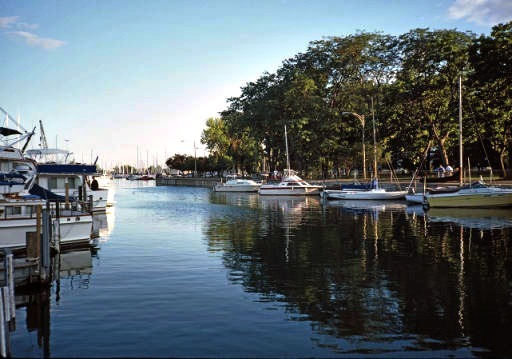 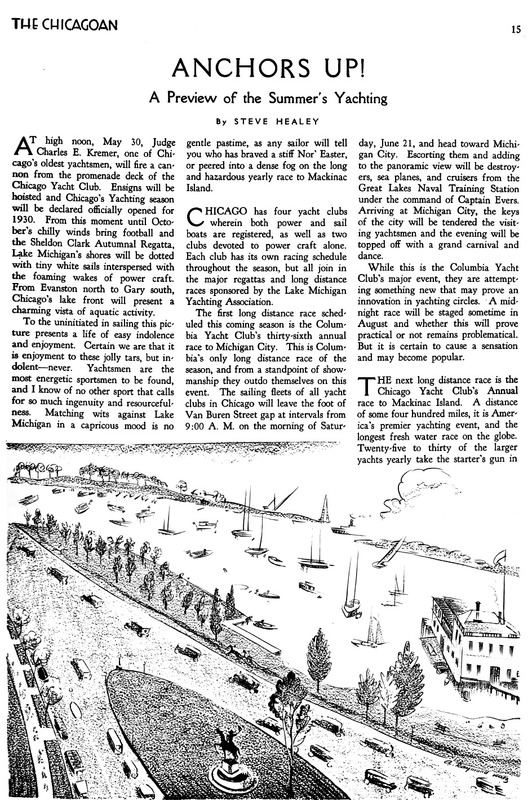 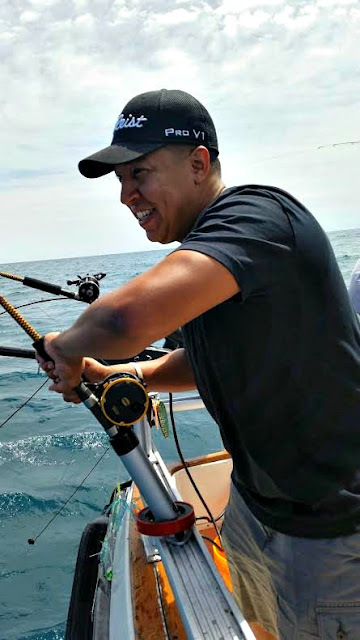 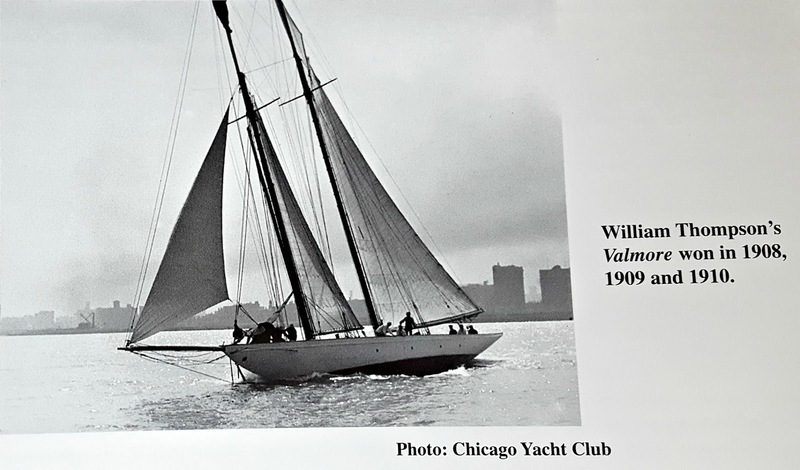 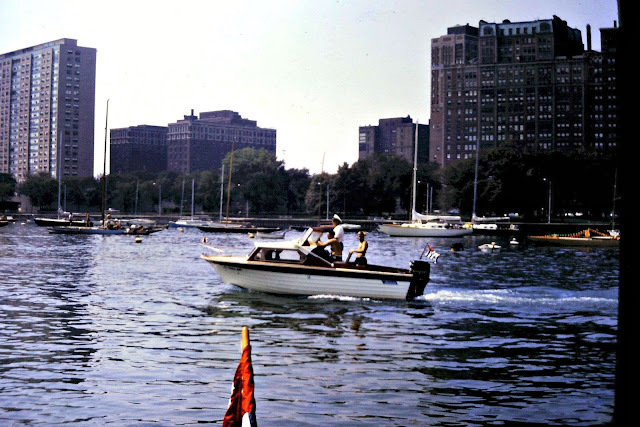 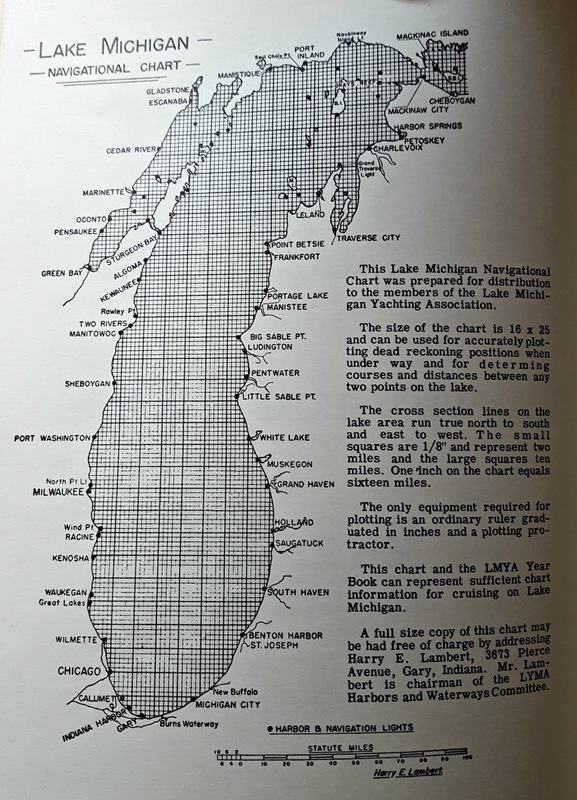 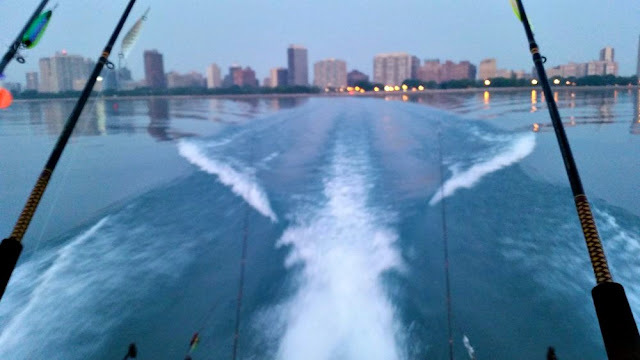 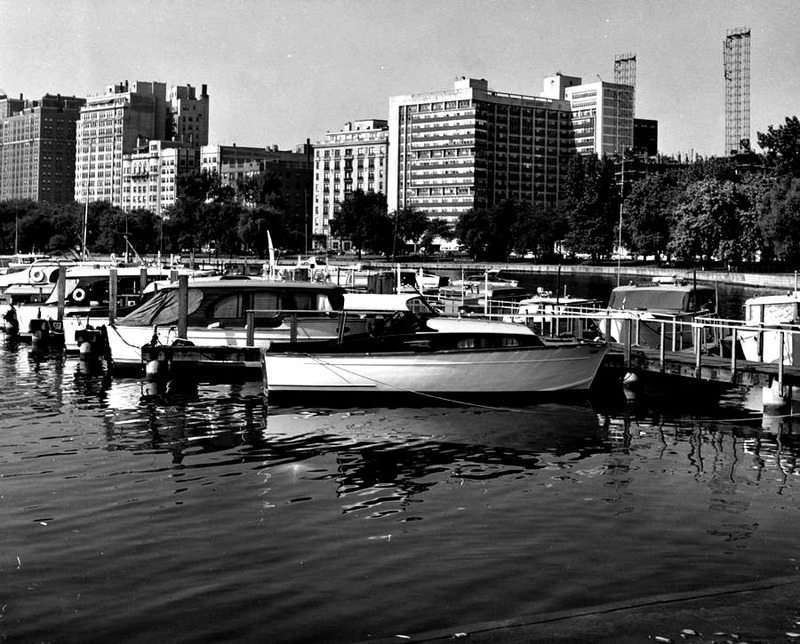 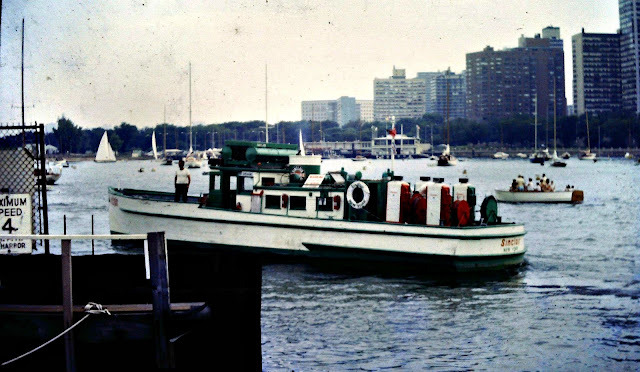 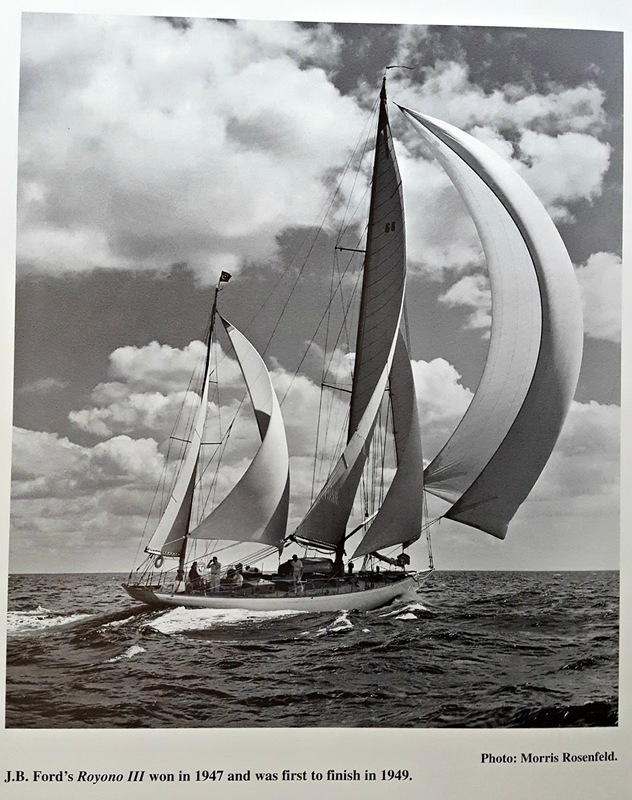 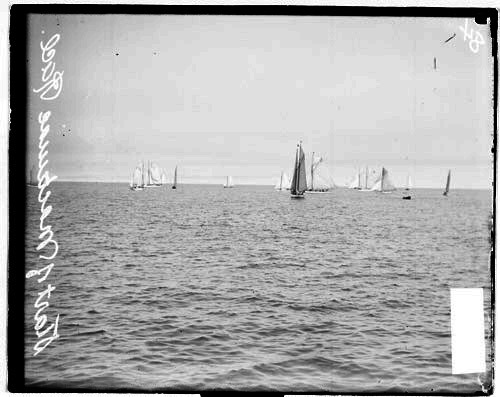 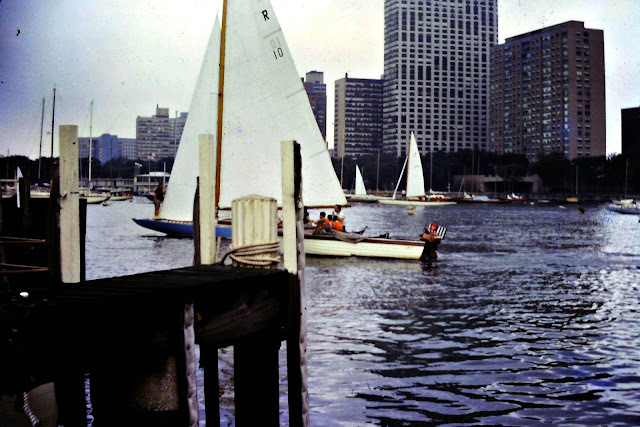 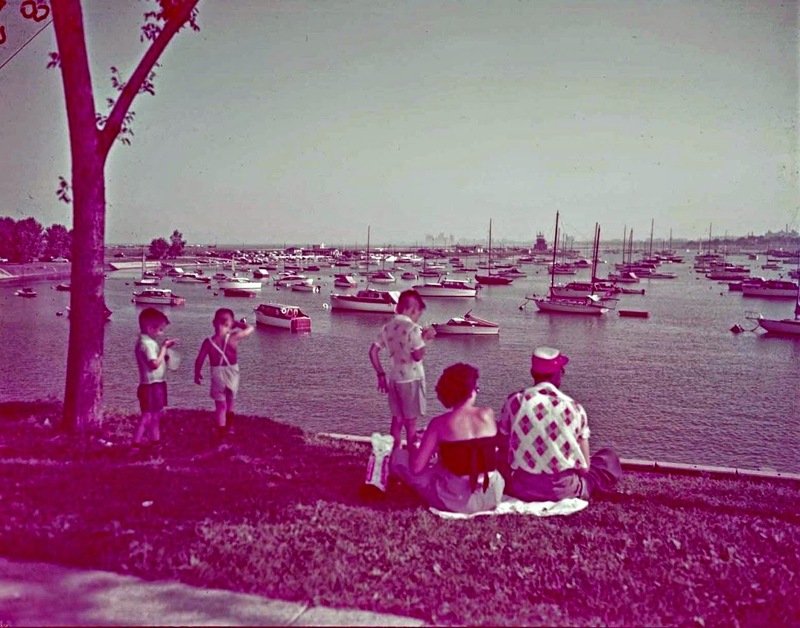 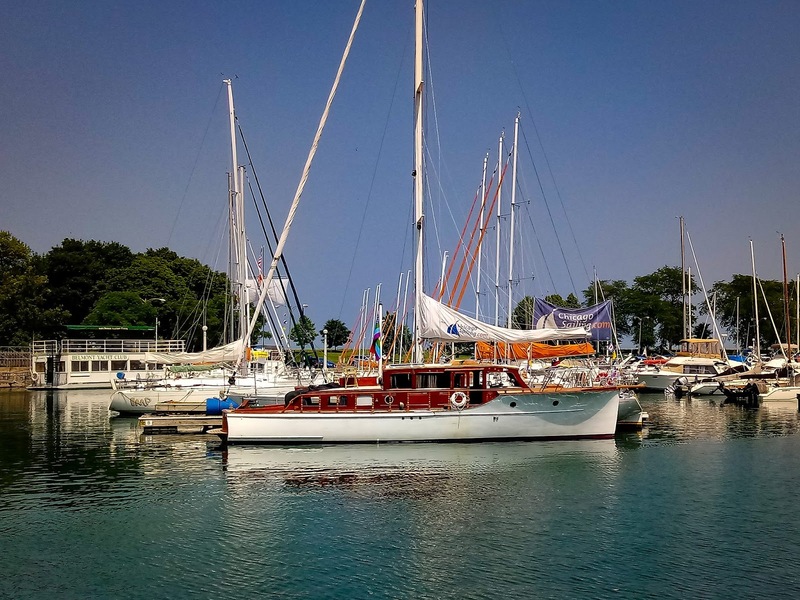 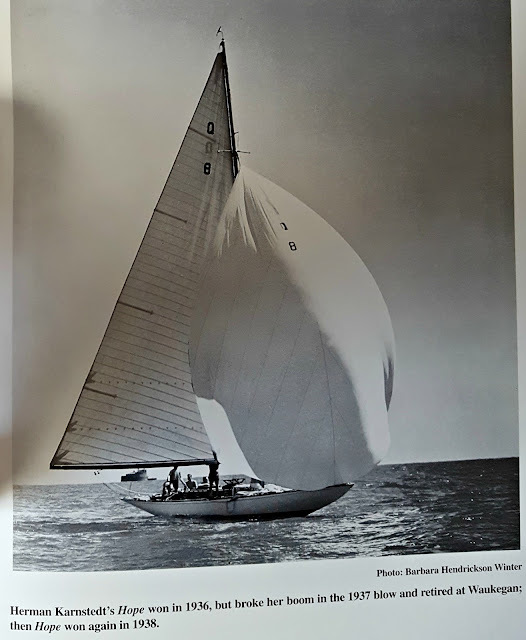 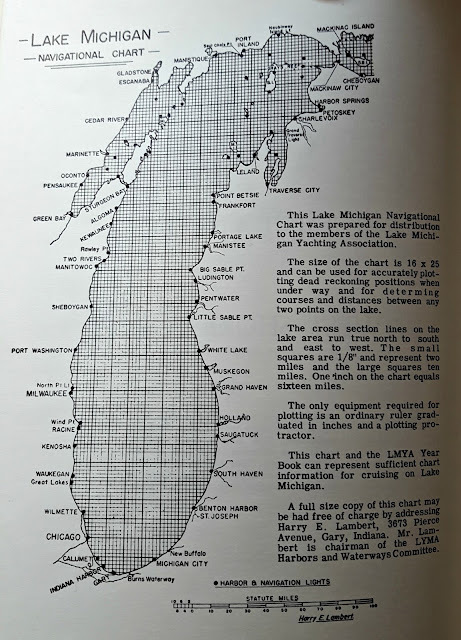 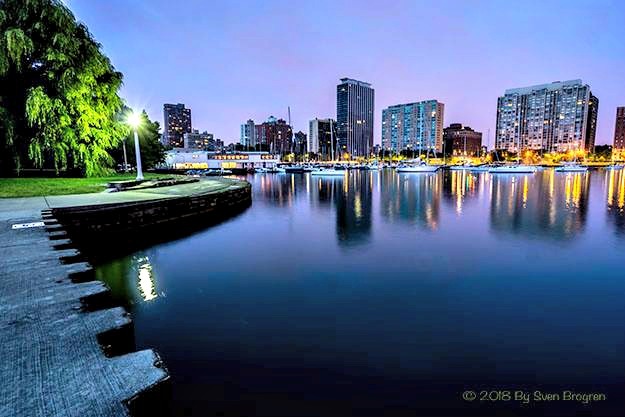 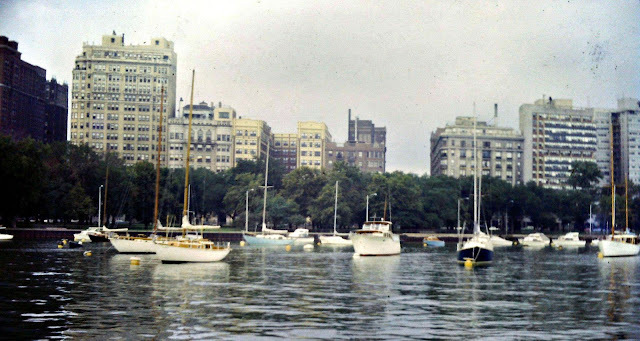 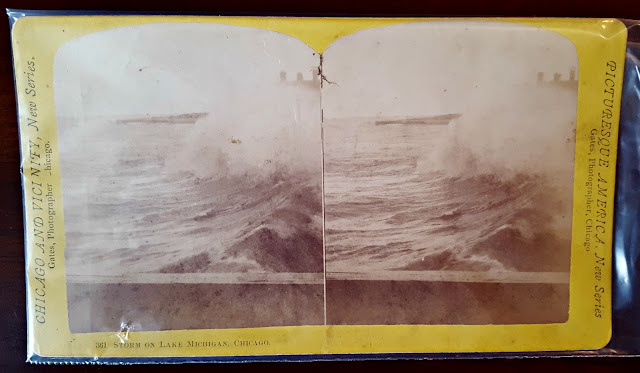 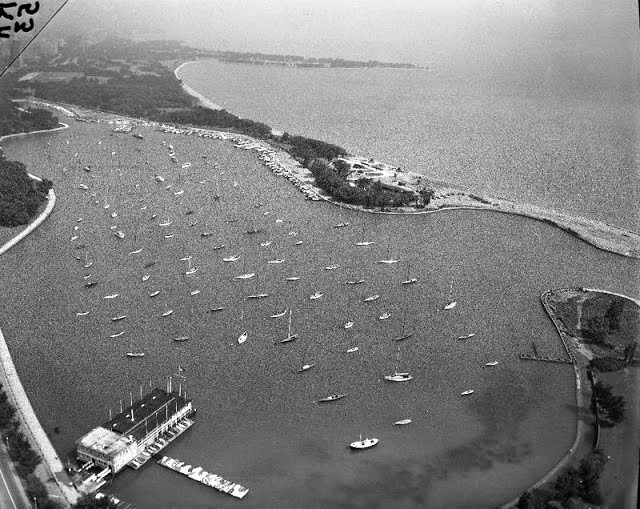 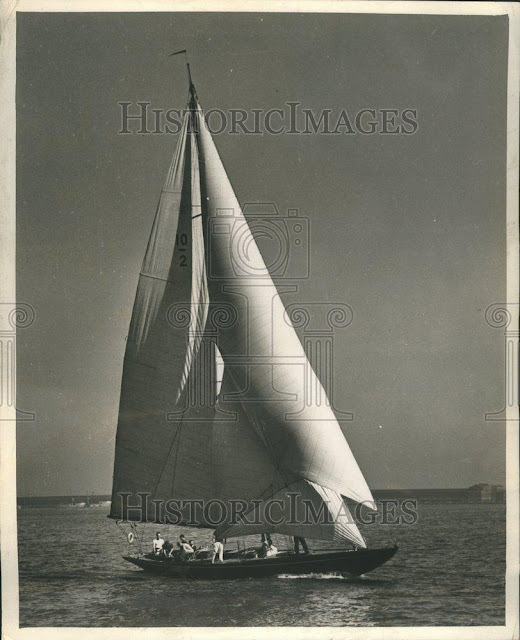 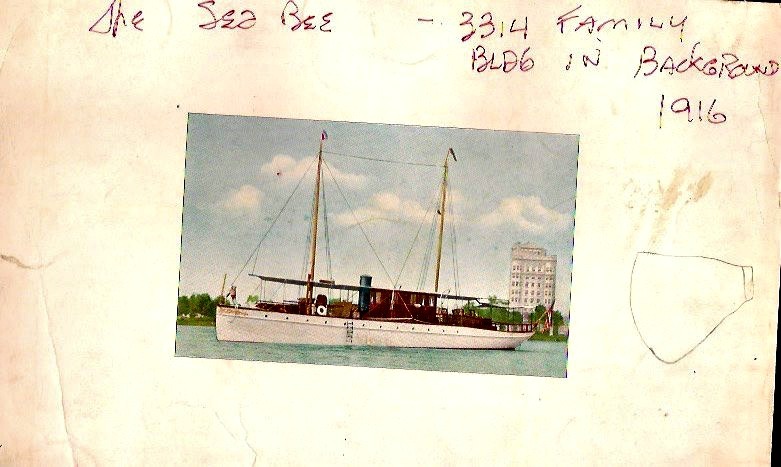 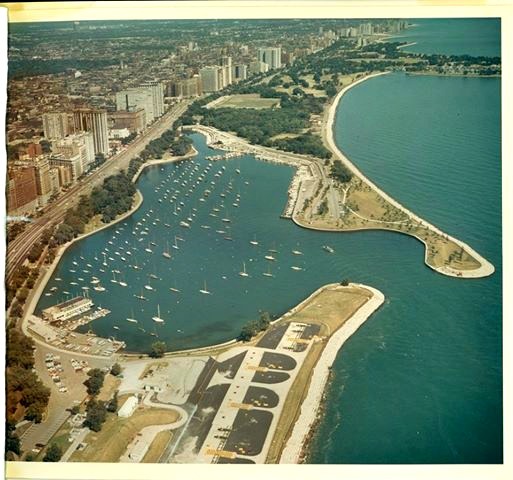 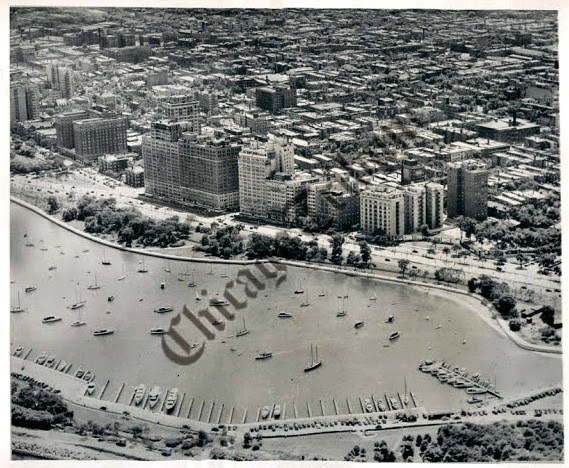 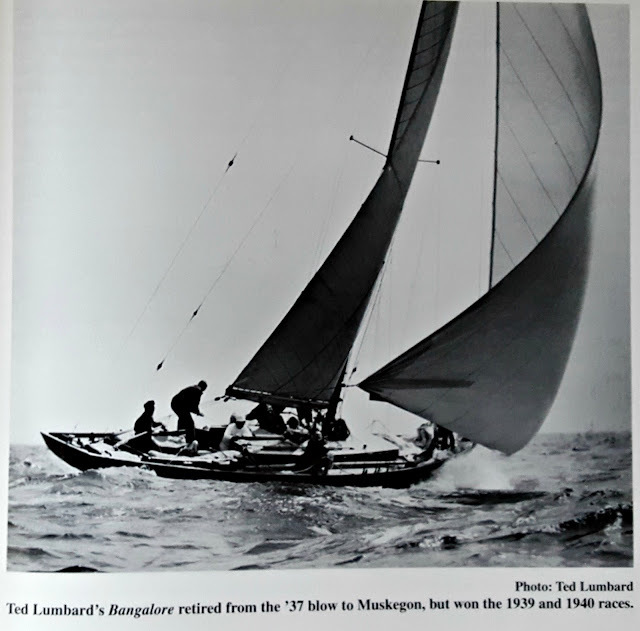 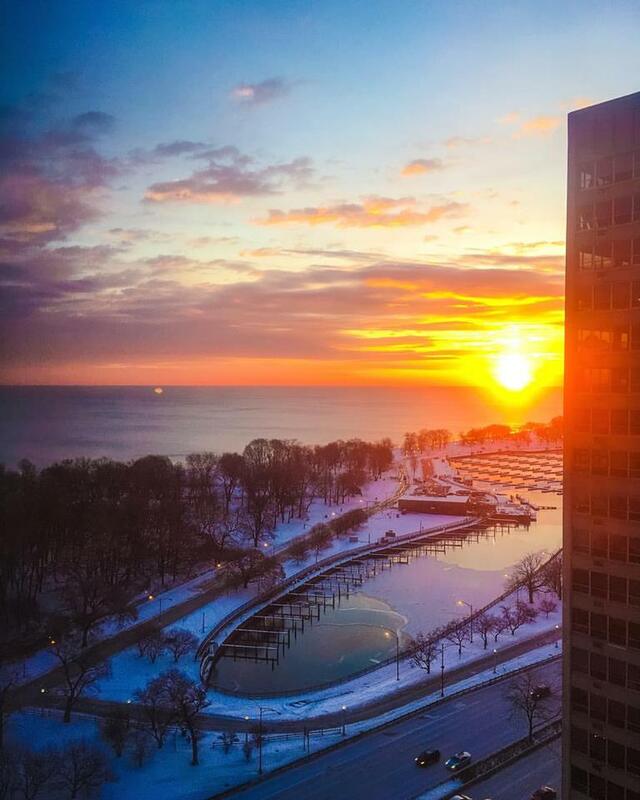 According to the author Vincent V. Glaviano of the book called The First Hundred Years 1875-1975: Afloat at Belmont Harbor the merger blended the history and experience of Monroe yacht membership with the ever increase youthful membership of Lincoln Park. 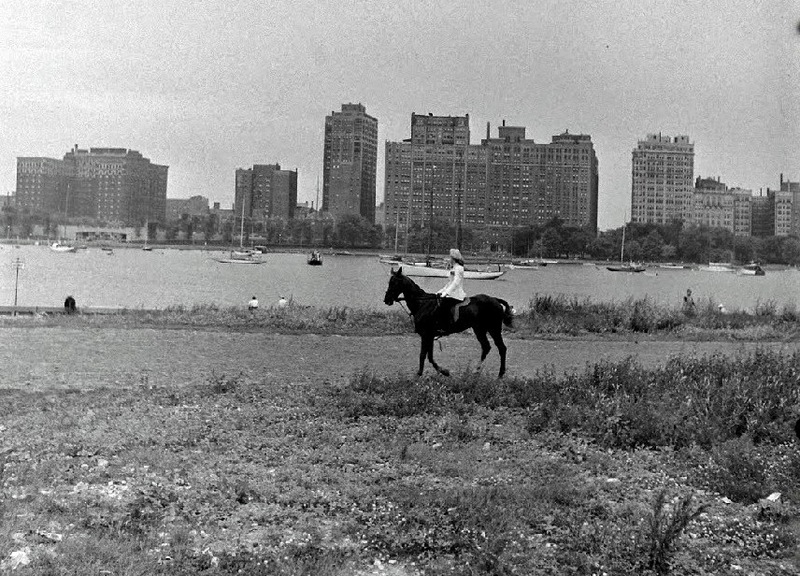 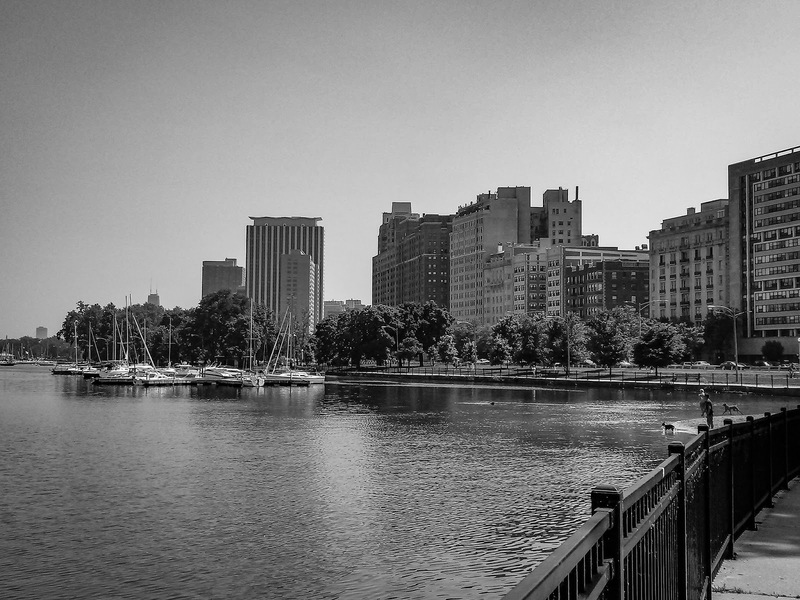 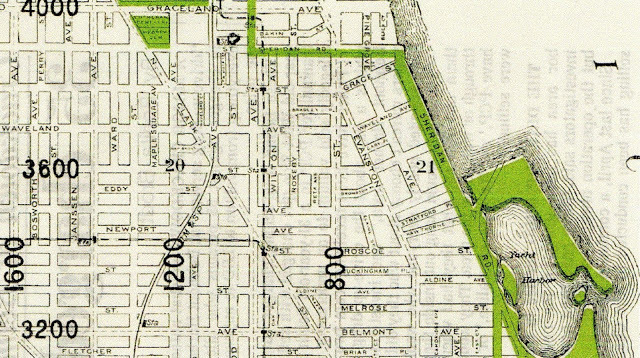 During the time of the merger Lincoln Park, the park was land-filled only to Cornelia Street. 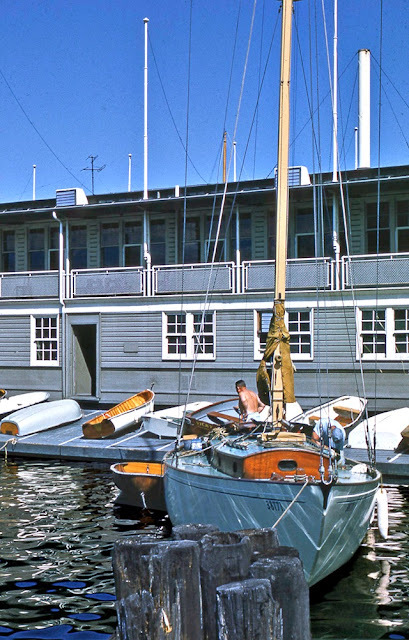 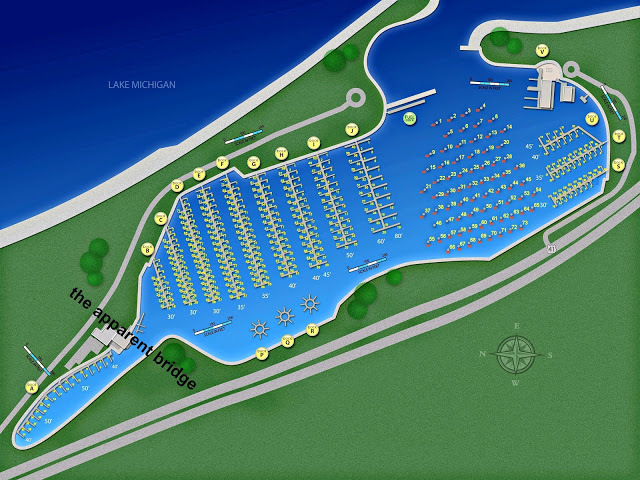 Both harbors would have their own boathouses including all the facilities that warrant one. 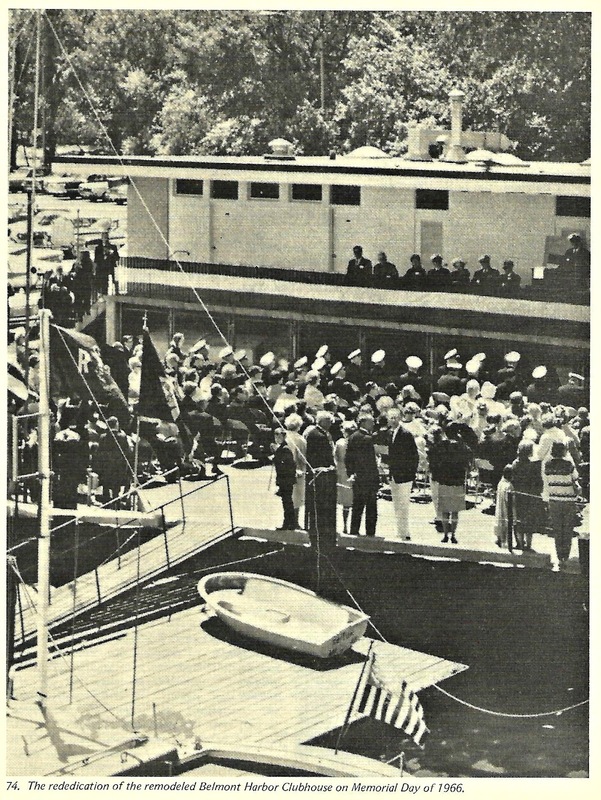 The first boathouse was actually a once proud fairing vessel called the Carrier I that was purchased in 1915 tow years after the public opening of the harbor. At the time of the purchase the 177 ton vessel was 50 years old. 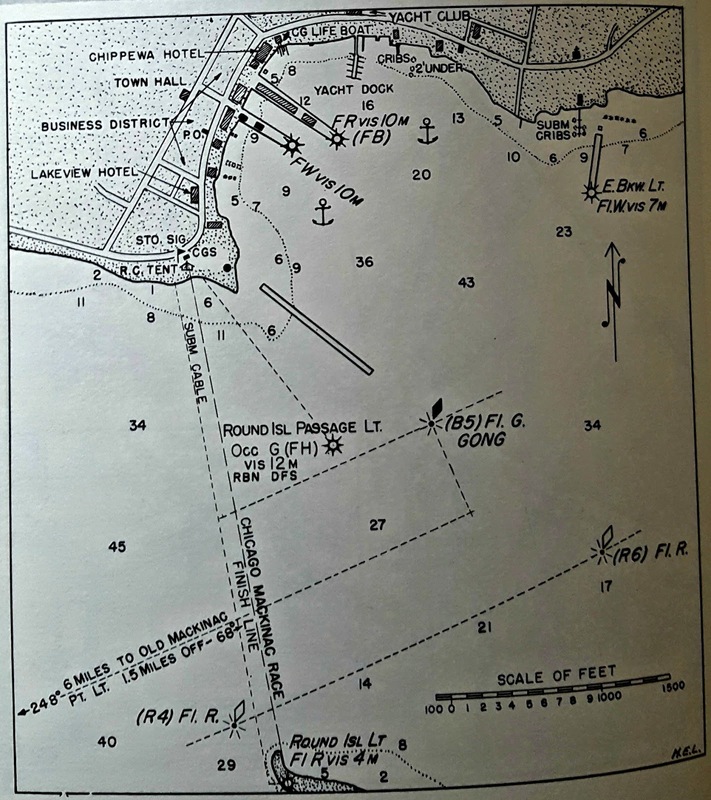 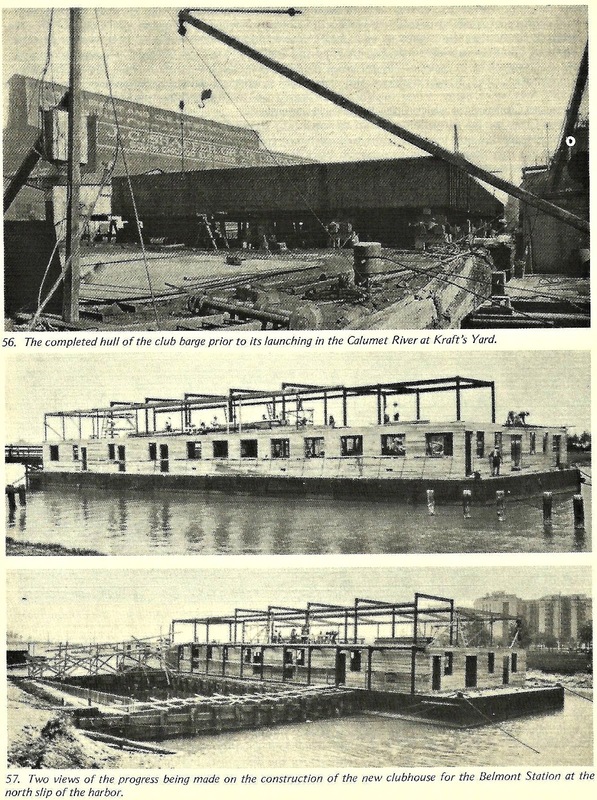 There were plans by 1920 to move the boathouse on dry land - see image above. The Lincoln Park of Commissioners, an entity that governed the park and the roadways along the park vetoed the plan for a private building on public land. 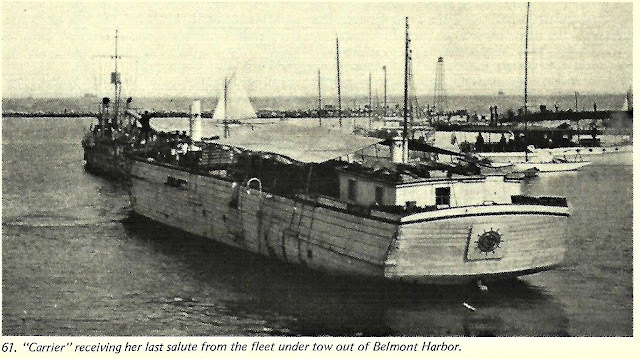 The Carrier I got a full salute to its new location. 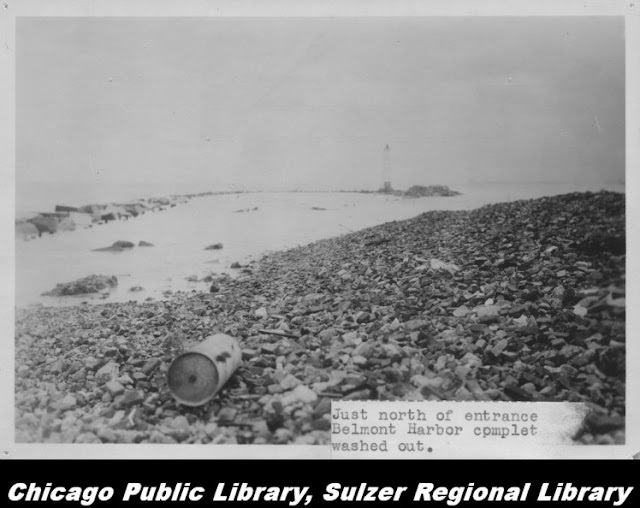 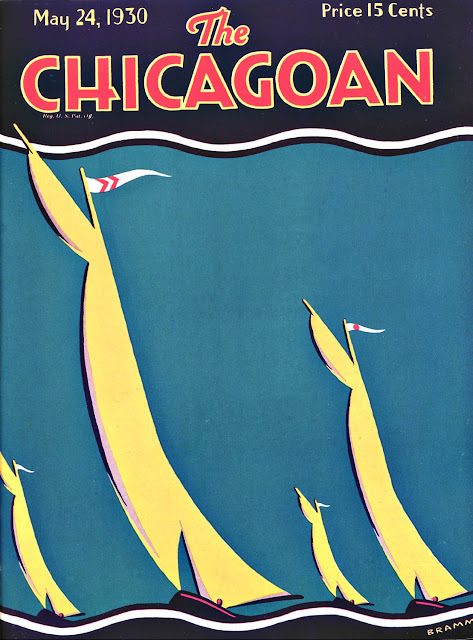 It sank near Evanston Township. 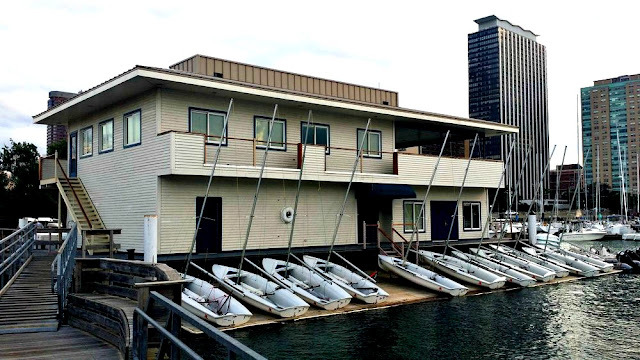 The evolution of the new boathouse. 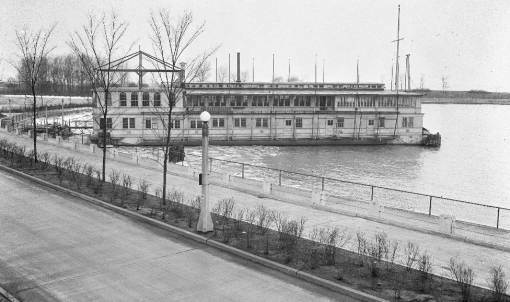 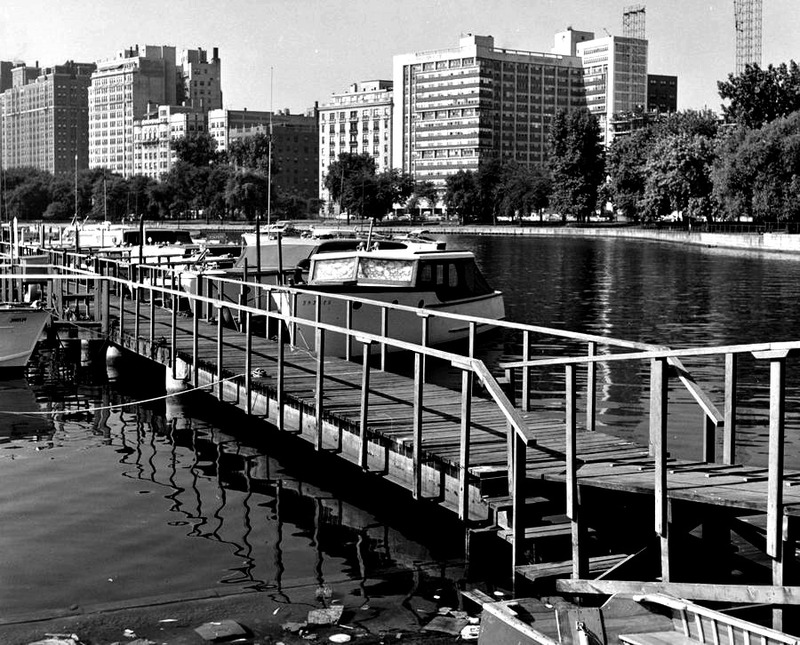 The floating barge was completed in 1923 and dedicated on Thanksgiving Eve. 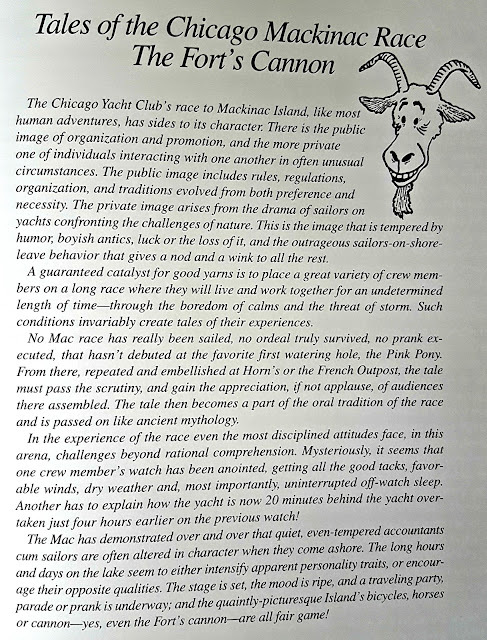 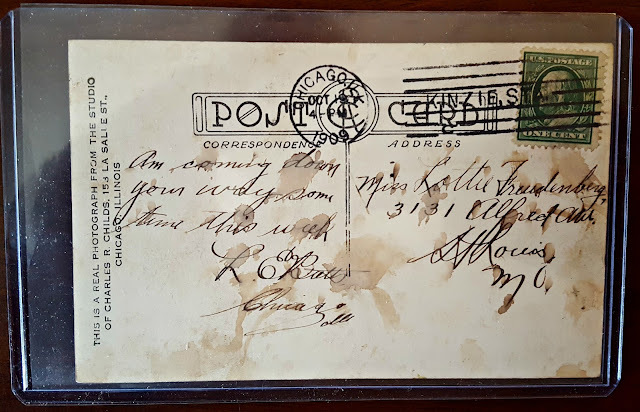 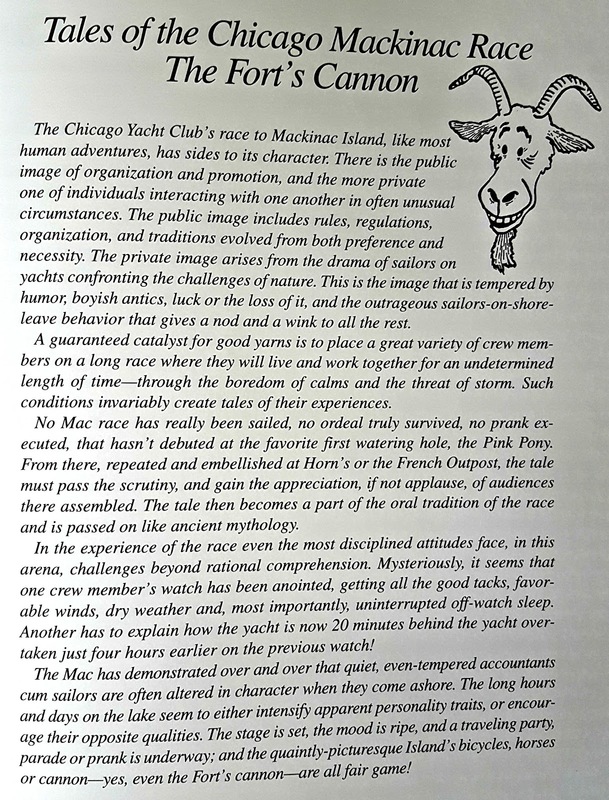 Captain MacMillan was one of the original members of the Lincoln Park Yacht Club and on that day messaged in from the Arctic Circle Expedition to his fiends in Chicago. 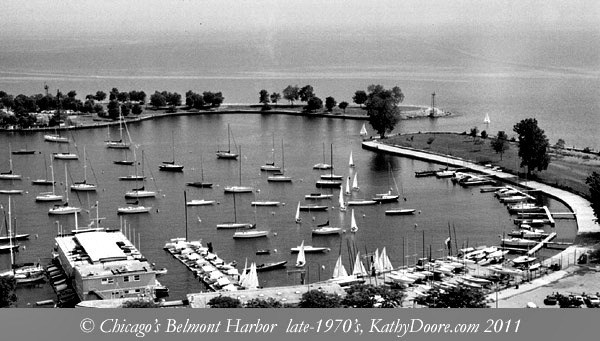 Construction was underway for another harbor north of Belmont Yacht Harbor at Montrose Avenue. 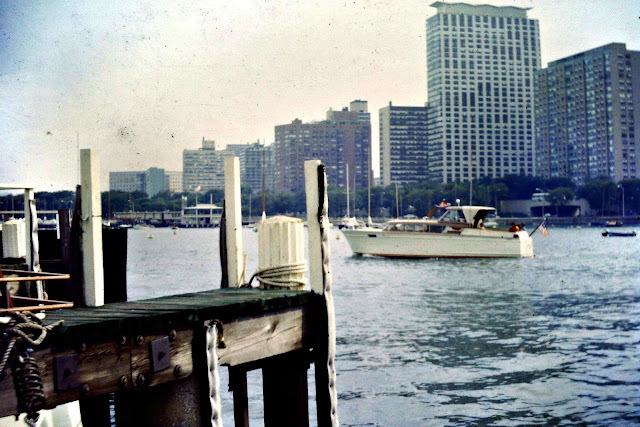 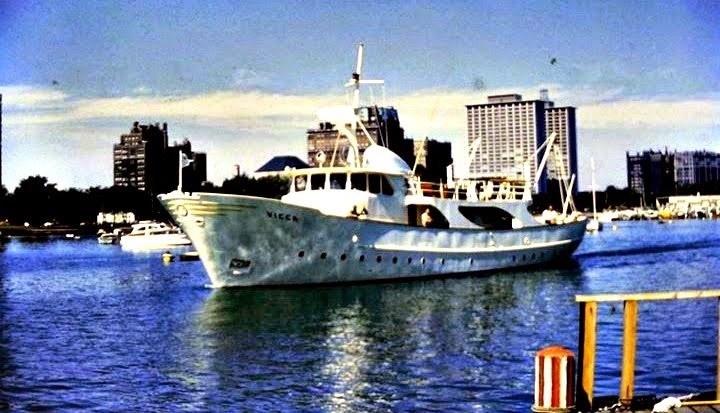 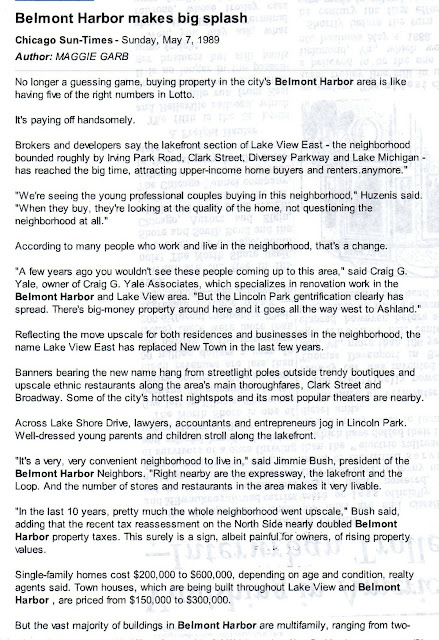 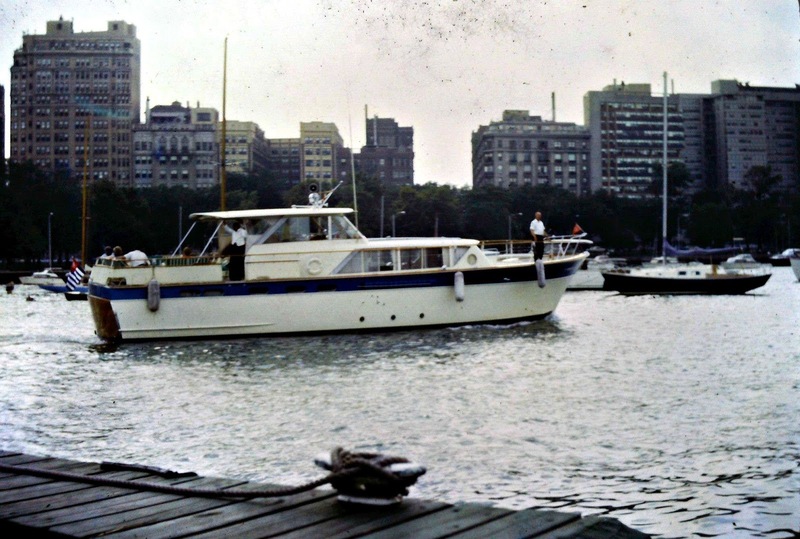 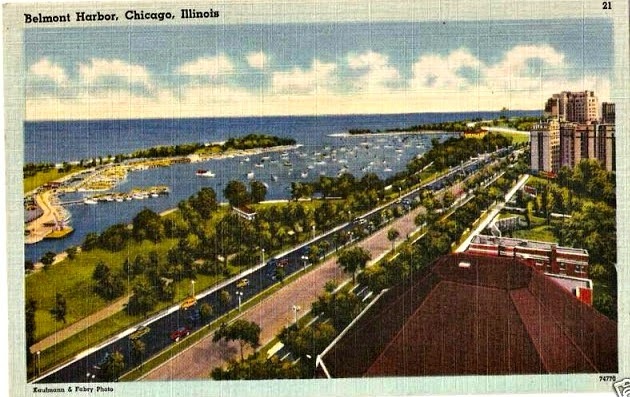 Mayor Big Bill Thompson had a yacht in Belmont Yacht Harbor and lived on the northwest corner of Belmont Avenue and Sheridan Road - currently inner LSD. 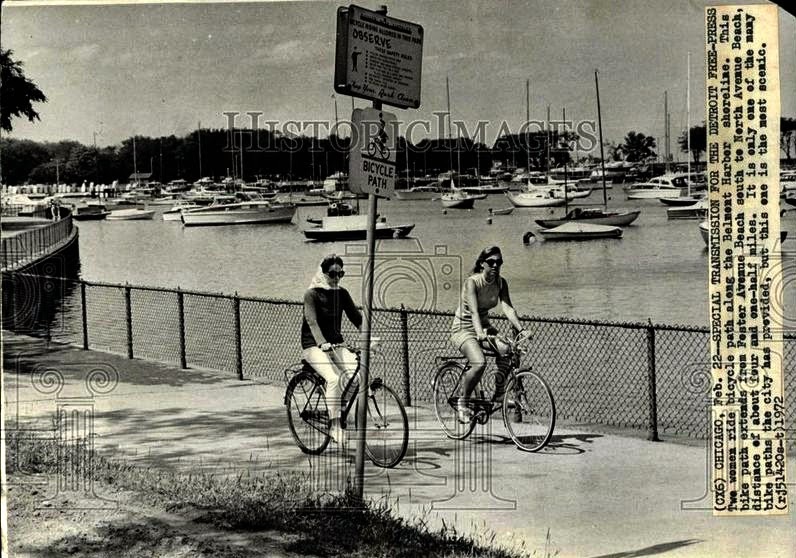 This three termed mayor and his wife lived at 3202 Sheridan Road at Belmont Avenue in the former elegant 32 apartment complex called Lochby Court Apartments. 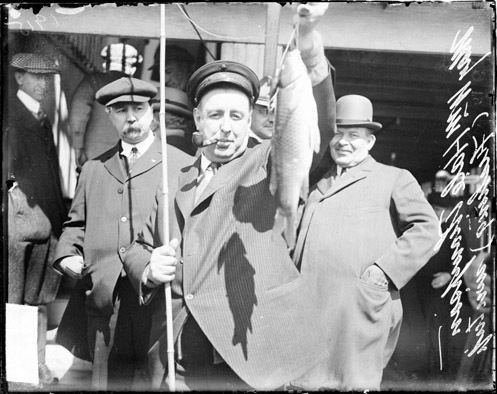 The mayor was known as 'turning a blind eye' on the activities of Al Capone. He a outspoken mayor who understood the politics of the city and his neighborhood. According the publication Hidden History of Ravenswood & Lake View by Patrick Butler, during his tenure as mayor and before WWI would publicly refer the emperor of Germany as 'Kaiser Bill'. 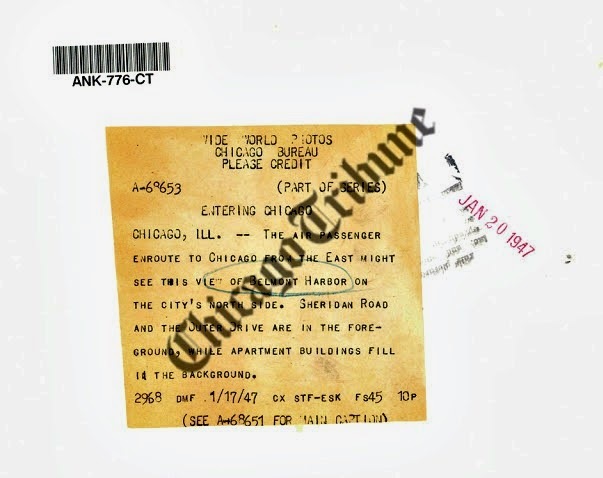 Big Bill " clashed with (then) Illinois governor Frank Lowden over a permit the mayor had issued for an anti-war rally" in his city. 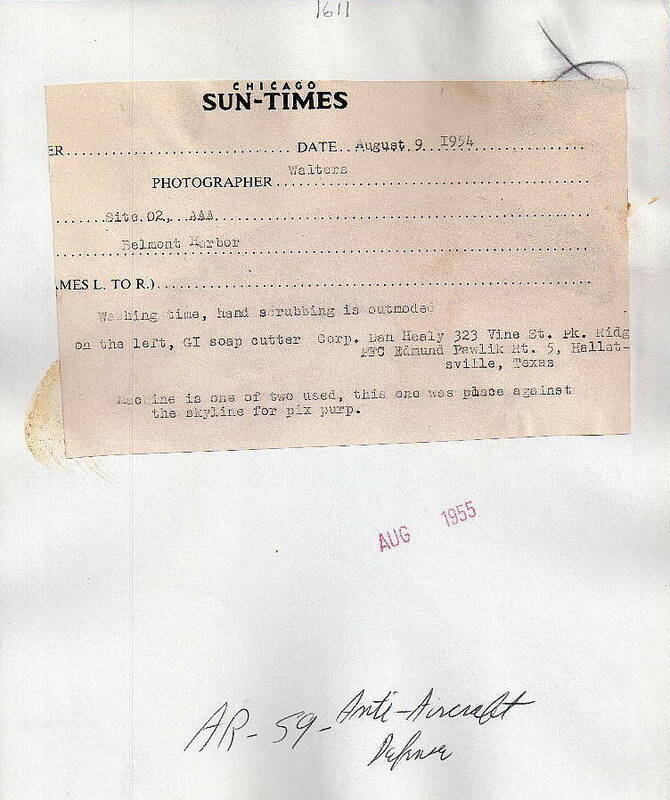 "Lowden had threatened to call out the National Guard to break up the protest, and Thompson vowed to use Chicago cops to resist if necessary." Military nor civil action was not ever taken. Big Bill Thompson docked his schooner Valmore @ Belmont Yacht Harbor. 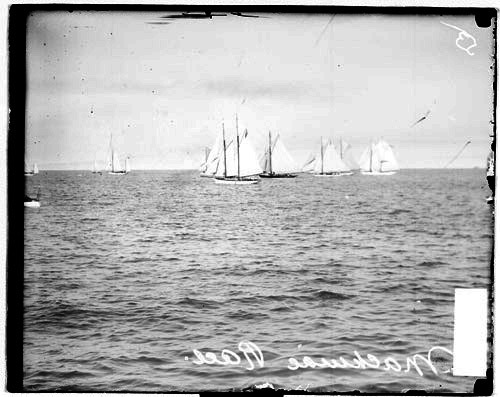 The schooner was the first in its class to participated in the Race to Mackinac from the harbor in 1908. 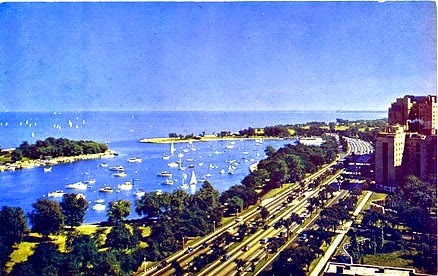 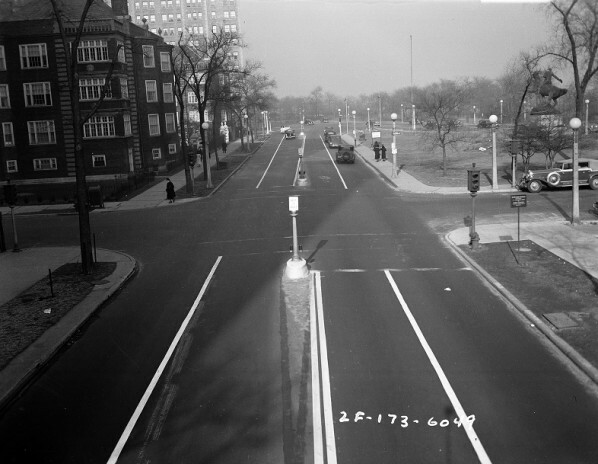 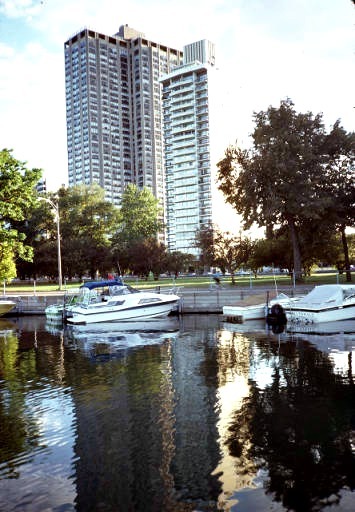 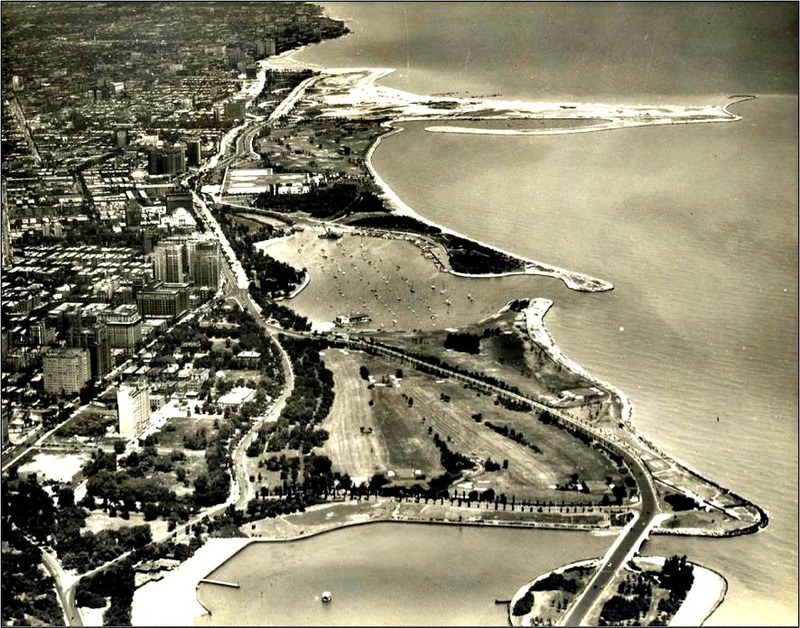 I residence was on the northeast corner of Sheridan Road, now called inner Lake Shore Drive and Belmont Avenue. 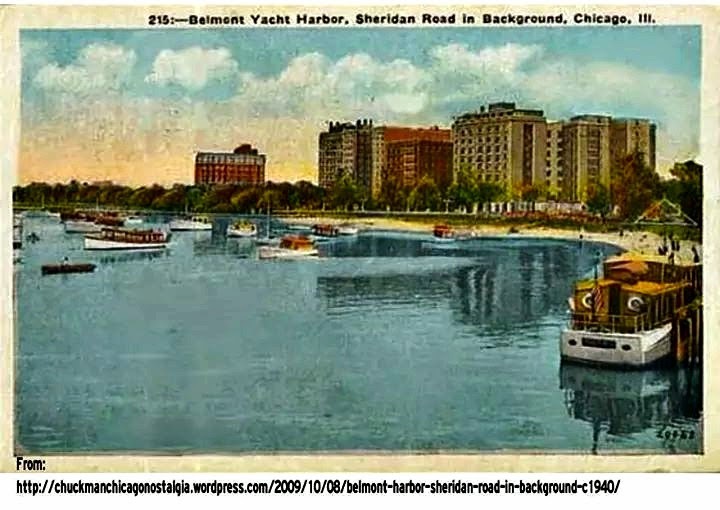 The other according to a book called 'Chicago in Seven Days' was at the Barry Apartments at 3100 Sheridan Road. 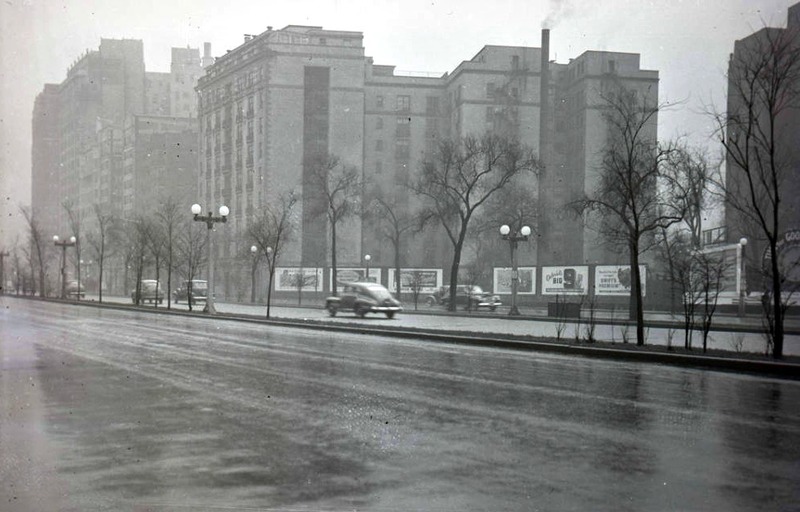 The three-story building had 32 apartments with butler's pantries and large living rooms with wood-burning fireplaces. Mayor Bill Thompson is credited in the creation of a 1915 commission that lead to the current Chicago flag. 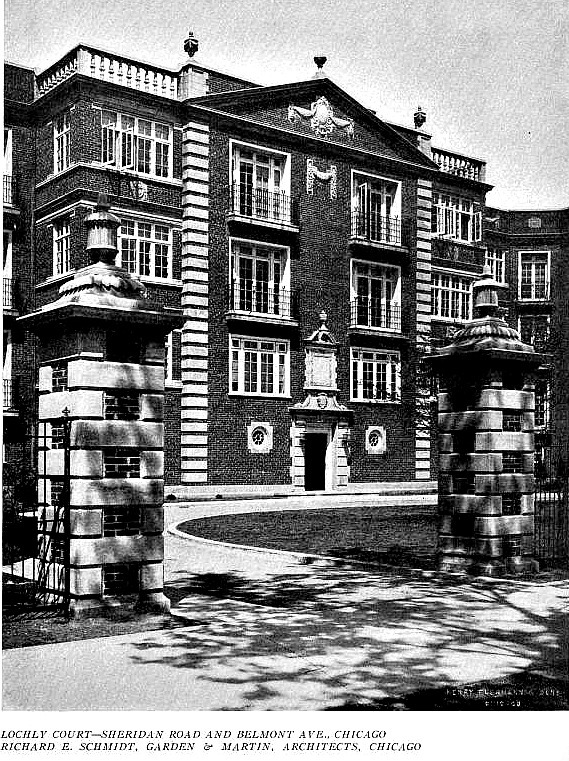 Several views of the Lochby Court Apartments built in 1911. 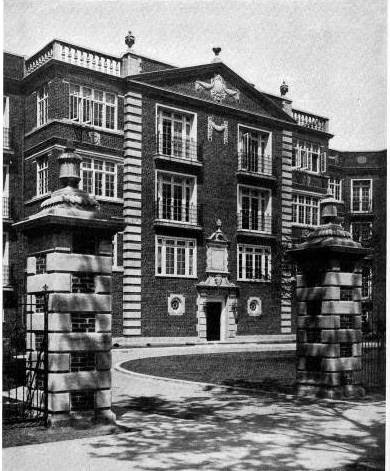 The building won a gold medal from the American Institute of Architects in 1912 as "best designed building of the year." and nothing was too good for Big Bill. Mayor Big Bill Thompson. 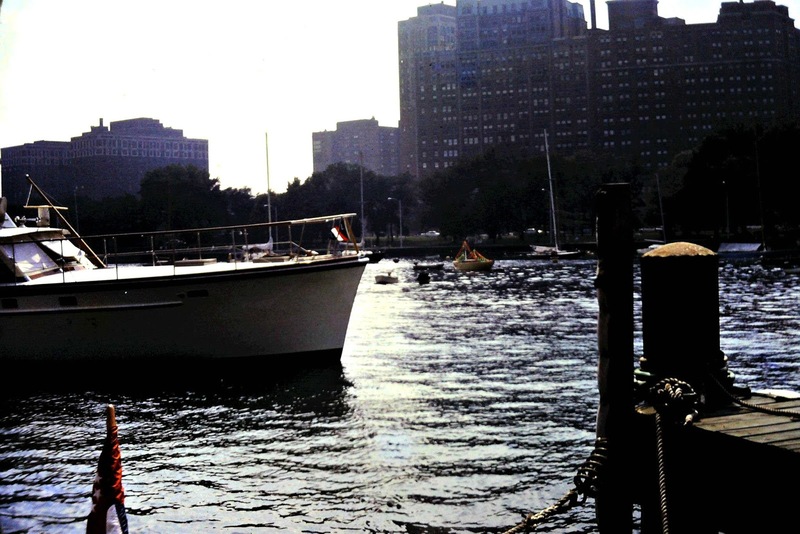 The mayor had is racing craft docked in the harbor. 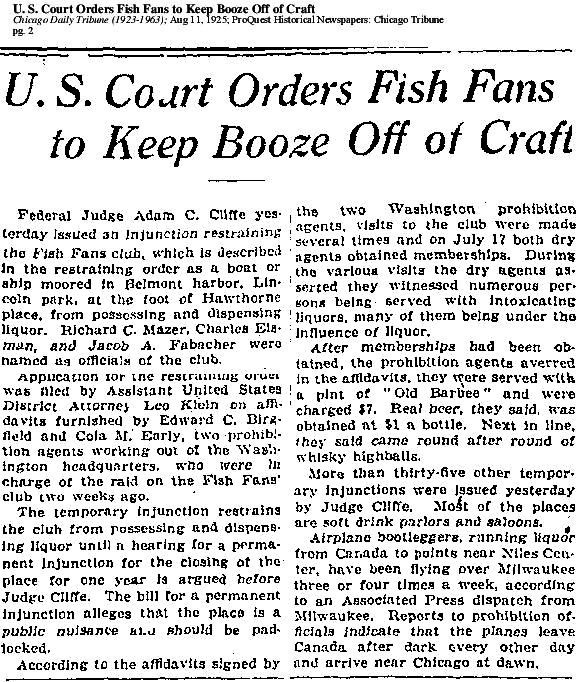 This establishment was referred as a membership only speakeasy during the 'dry years' of Prohibition. 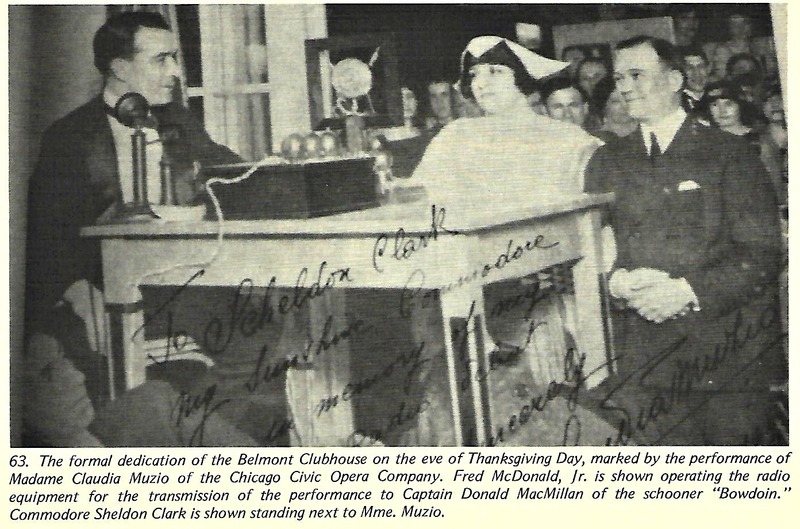 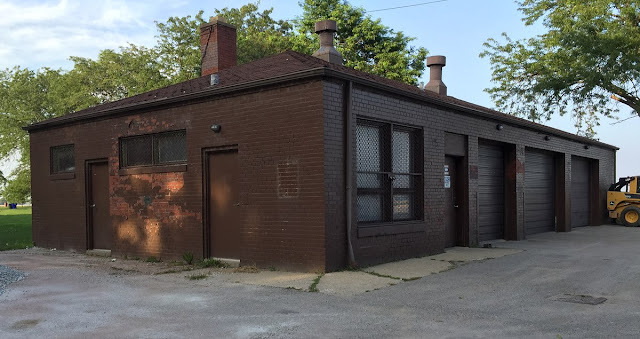 According the publication Hidden History of Ravenswood & Lake View by Patrick Butler, Big Bill established the club in 1922 under using Illinois state law. 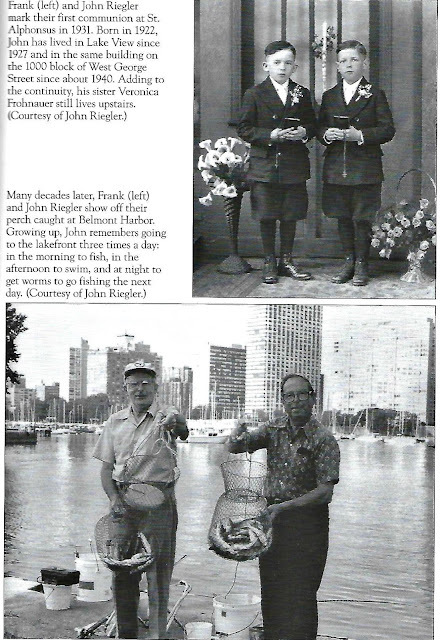 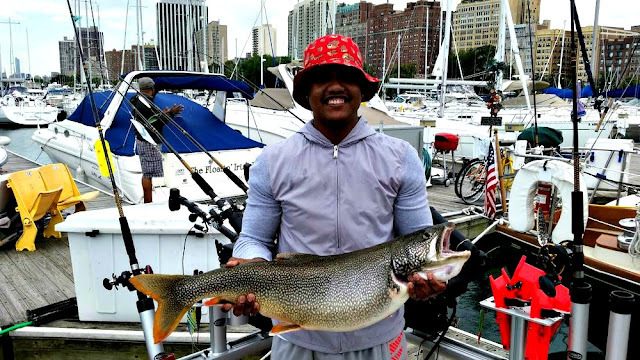 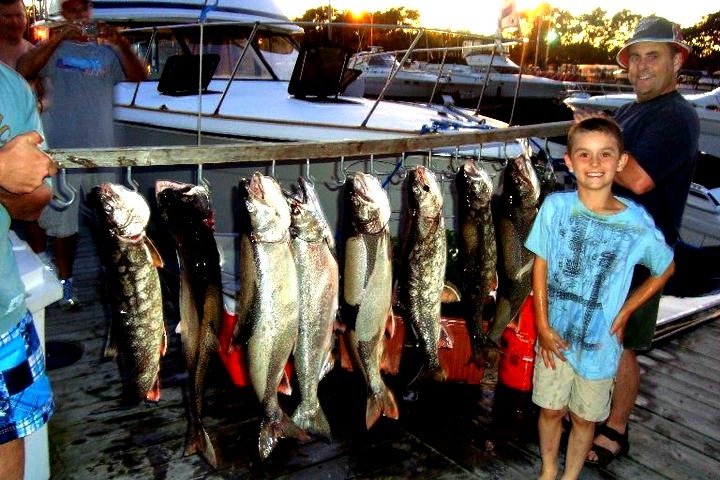 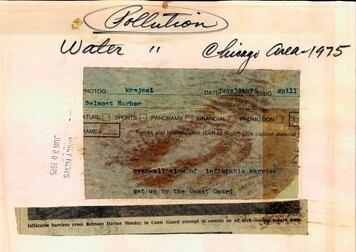 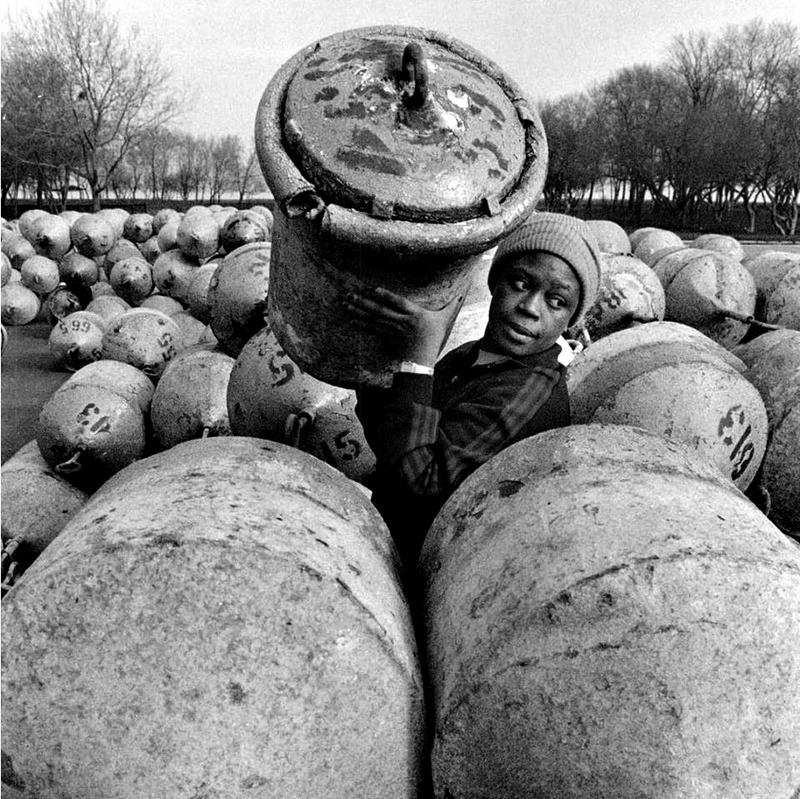 The State was promoting the "propagation of fish in Illinois waterways to help feed poor children". 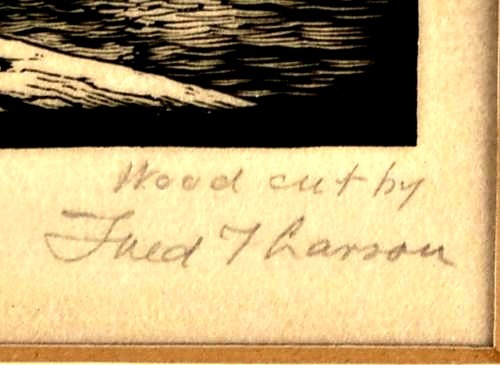 Thompson and his friends had other ideas in mind. 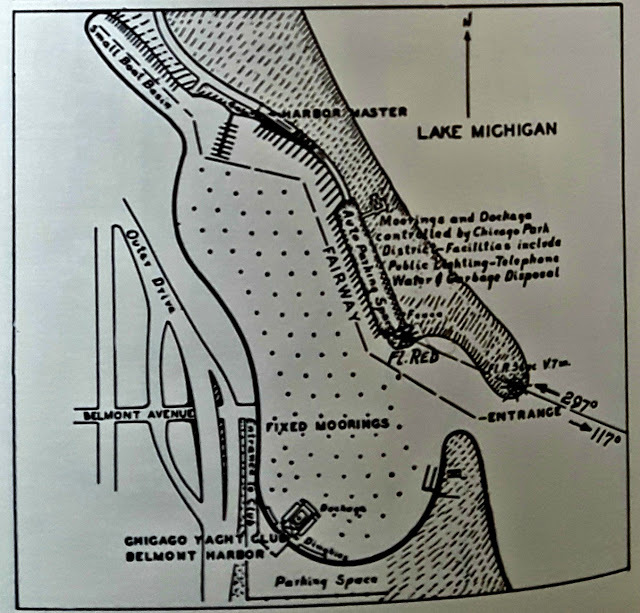 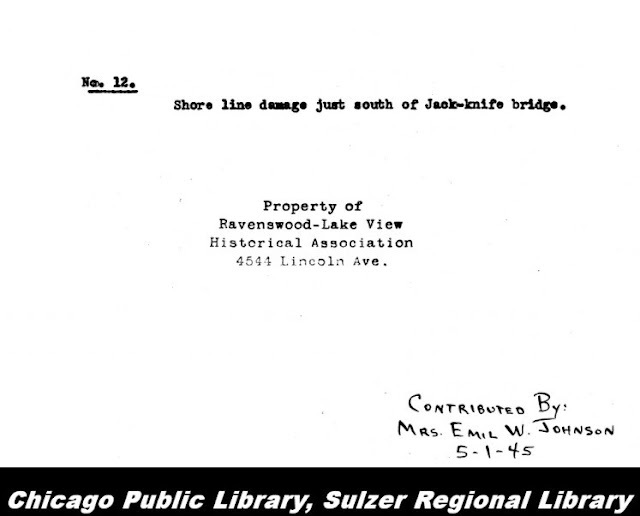 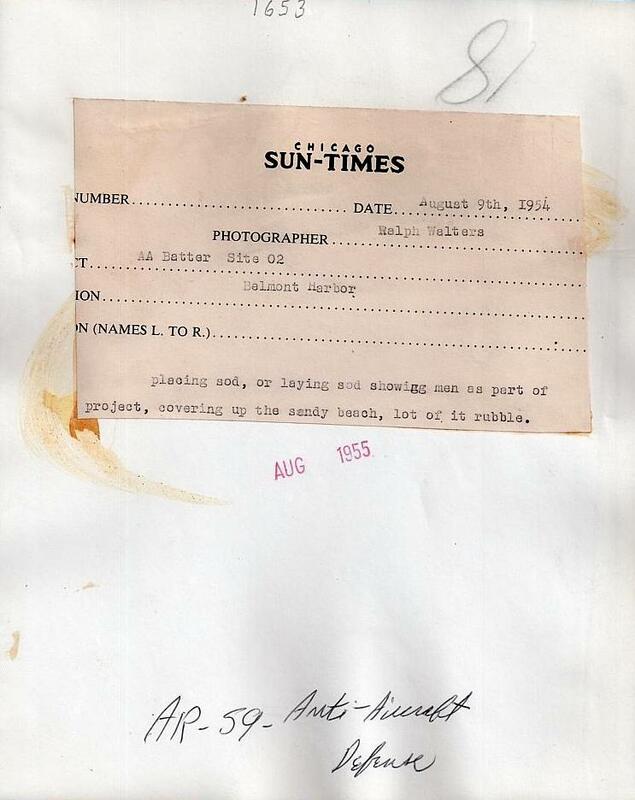 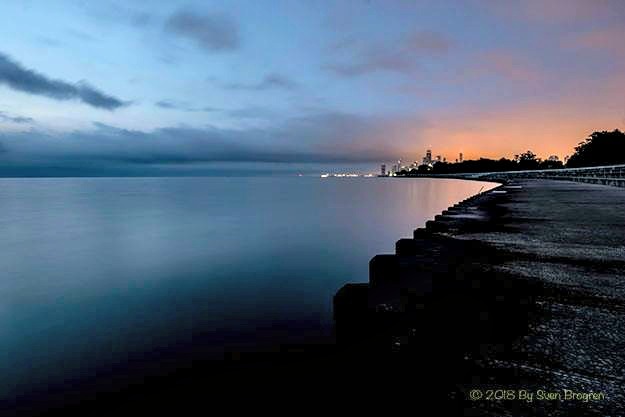 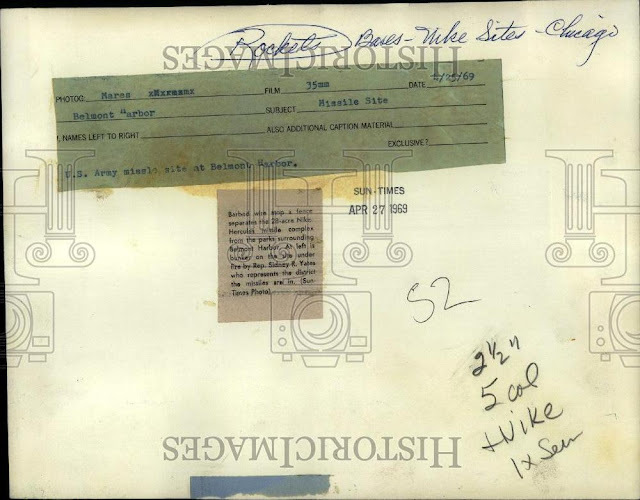 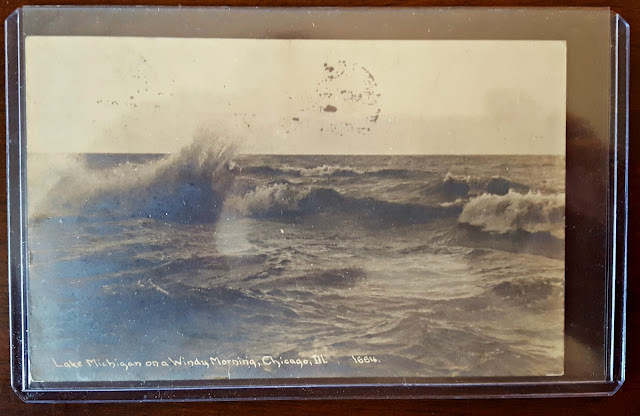 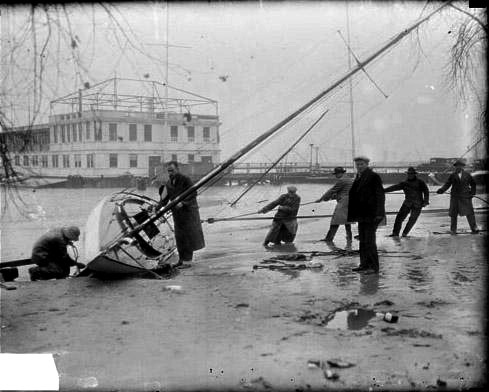 According the publication Hidden History of Ravenswood & Lake View by Patrick Butler, the club members some how failed to pay their bills and in 1928 during Prohibition creditors impounded the craft and "scuttled in the middle of Lake Michigan". 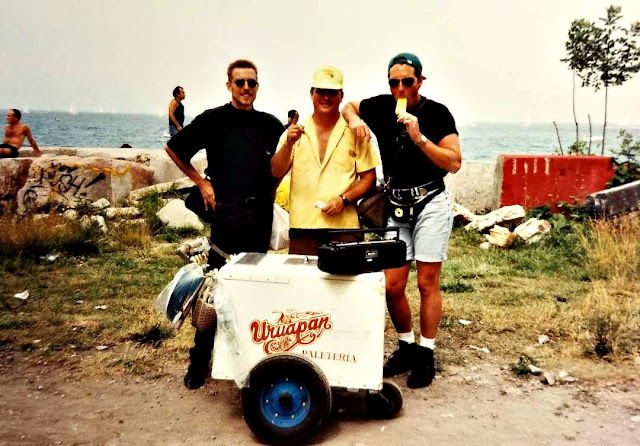 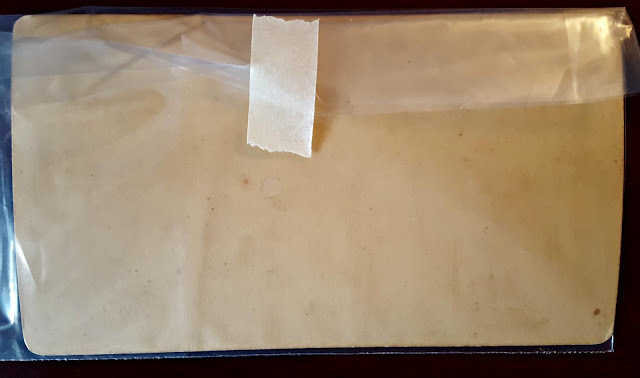 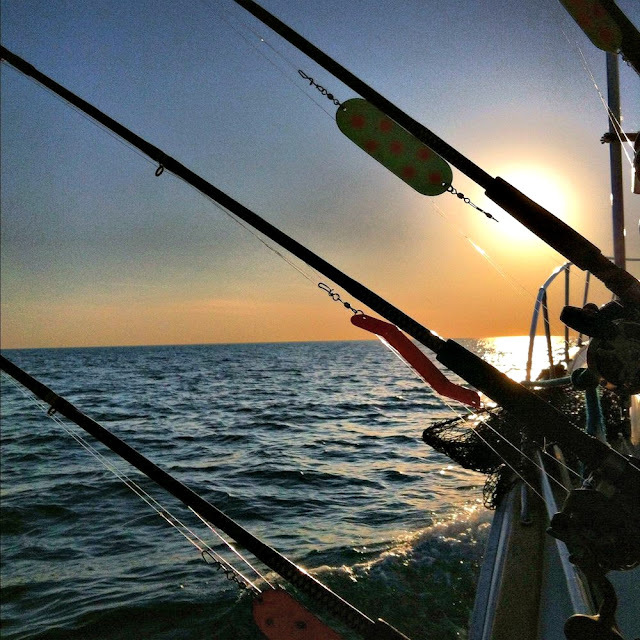 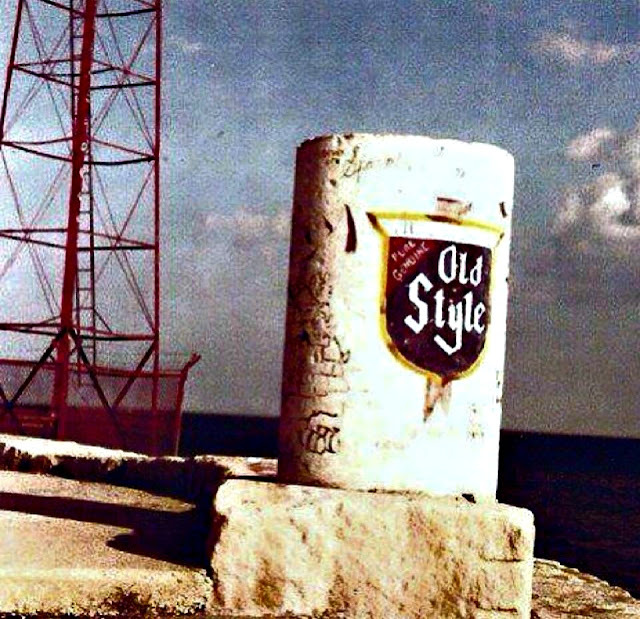 During this time period there was a court battle pending about property offshore and the jurisdiction of city ordinances regarding gambling and drink on any offshore property even if it was connected by a bridge. 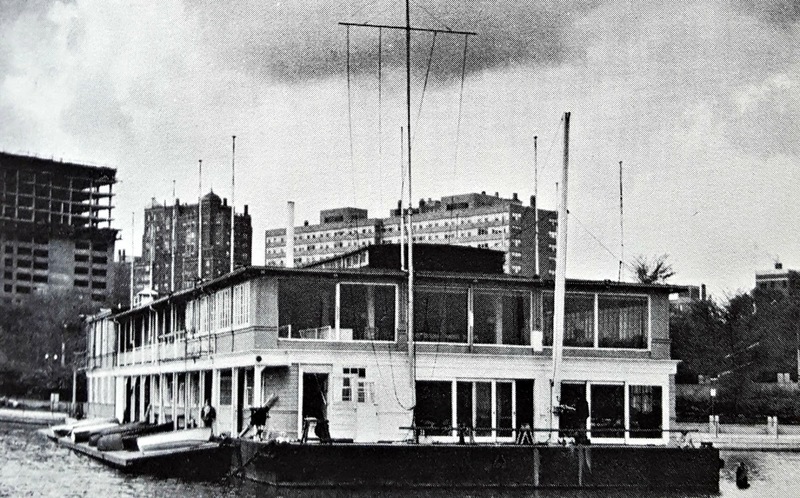 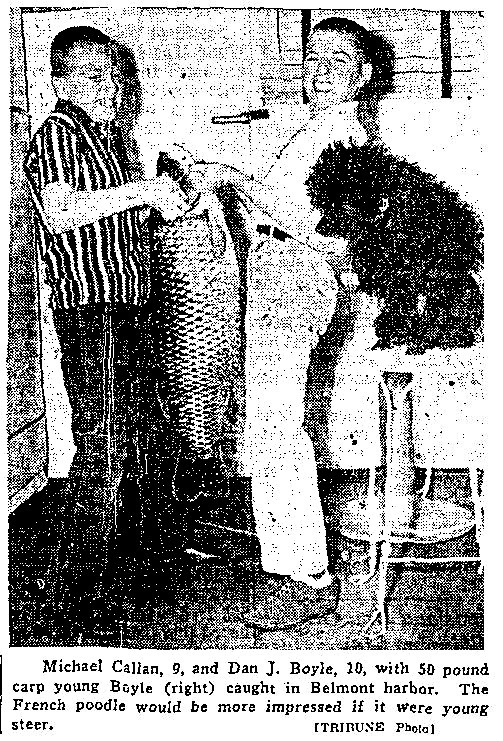 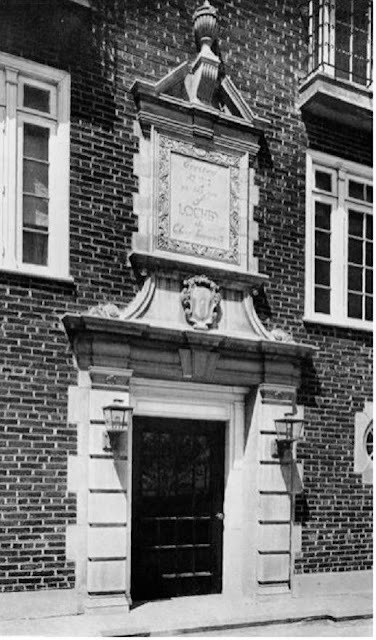 The Fish Club was regarded offshore and a 'Streeterville-like' problem. 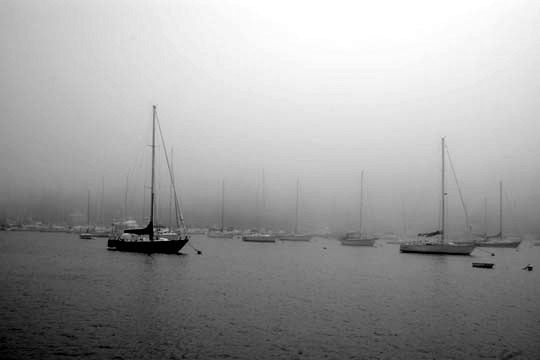 one in April and the other in October. 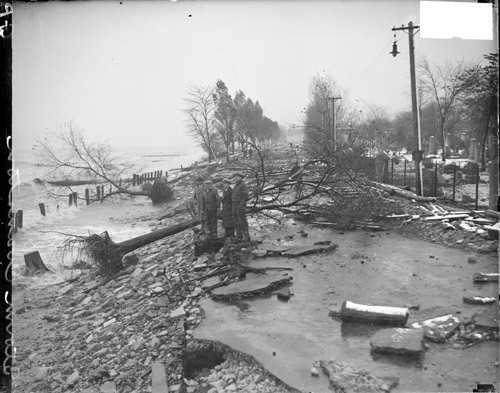 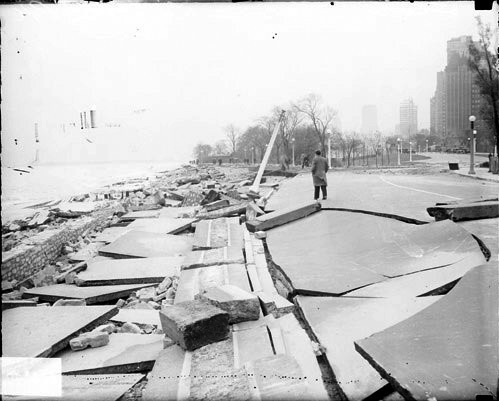 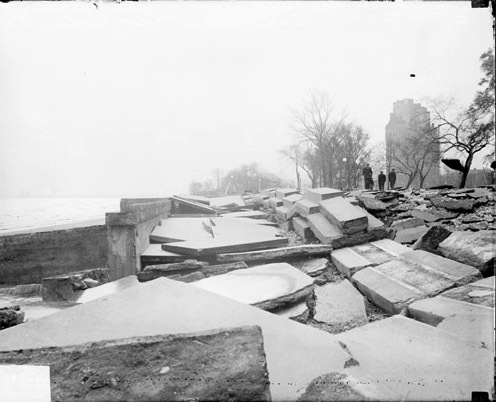 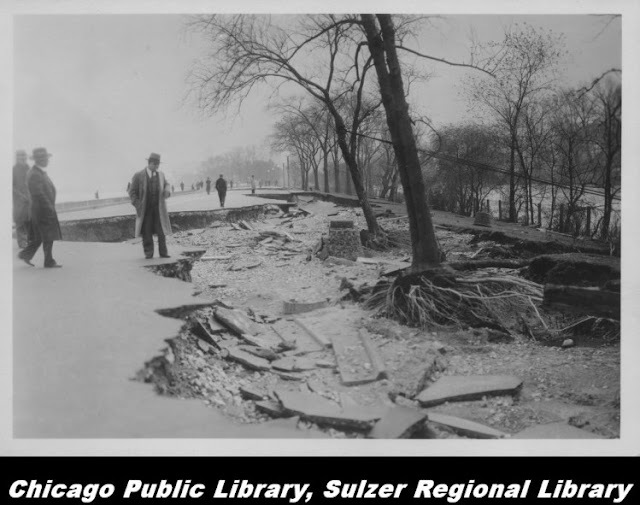 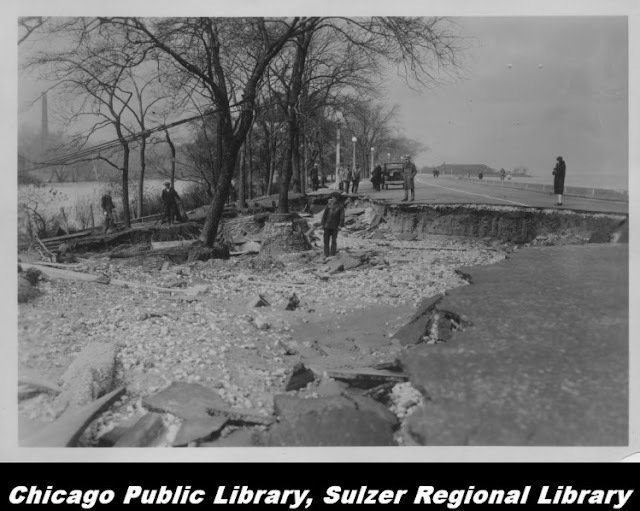 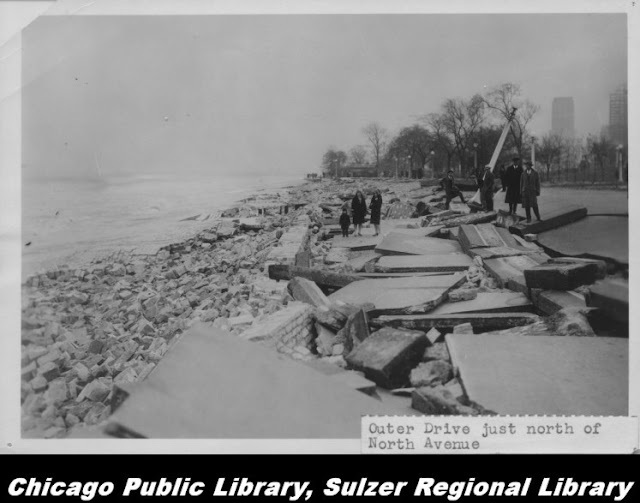 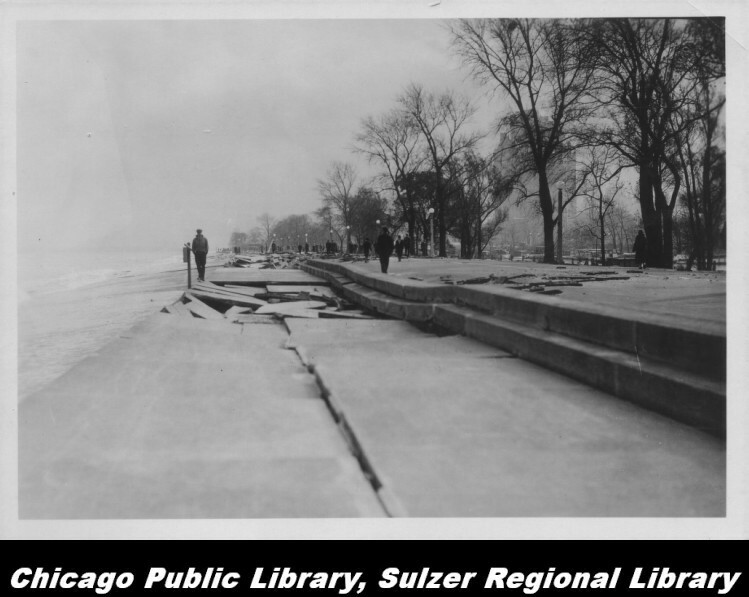 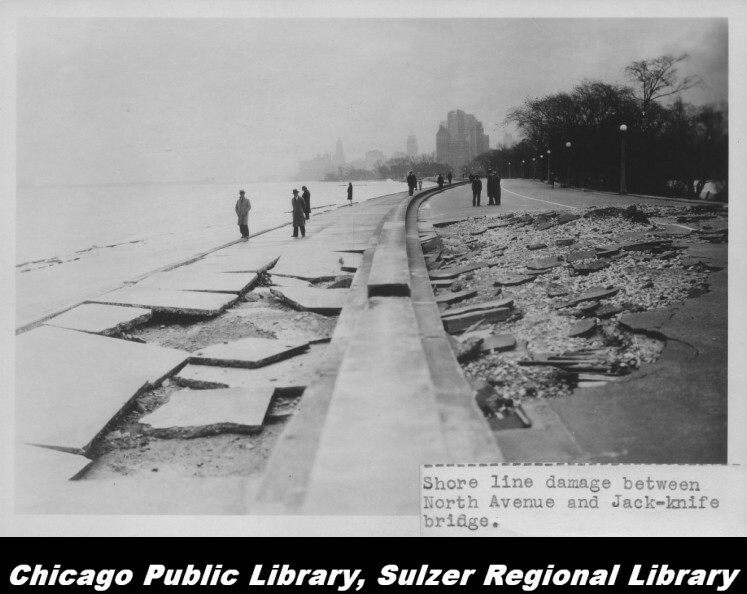 This April storm and another October storm coupled with the Great Depression of October 1929 paused the expansion or extension of Lincoln Park northward until 1937 beyond Montrose Avenue. 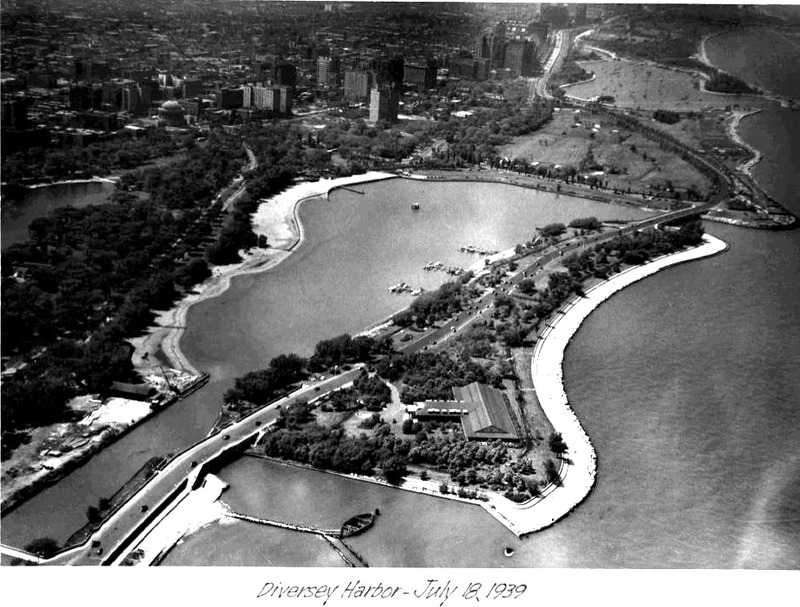 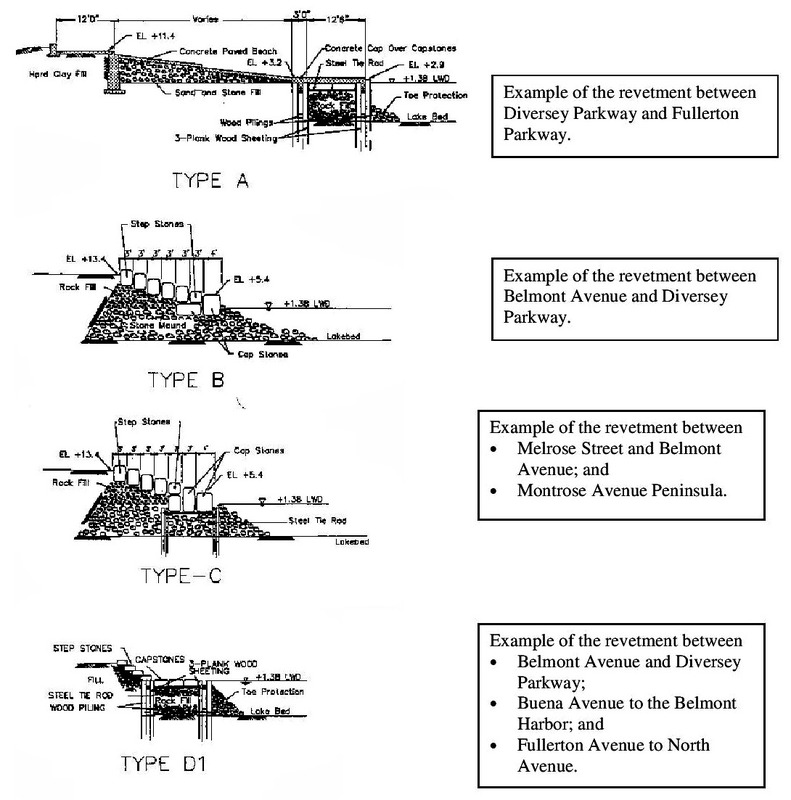 The city was granted federal monies to redevelop, extended the drive to Foster Avenue 1937- 1942. 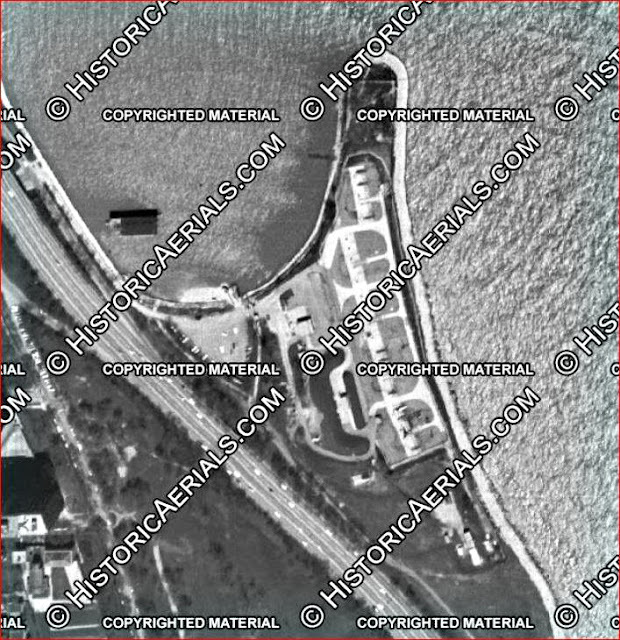 The missile launch site was located at Belmont Harbor with radar control towers for it near Montrose Harbor. 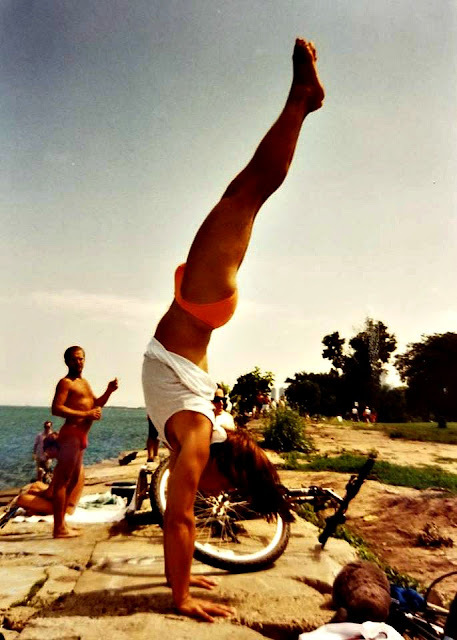 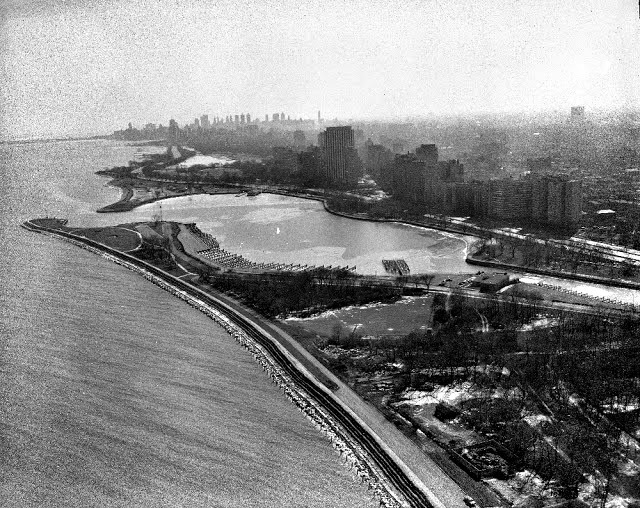 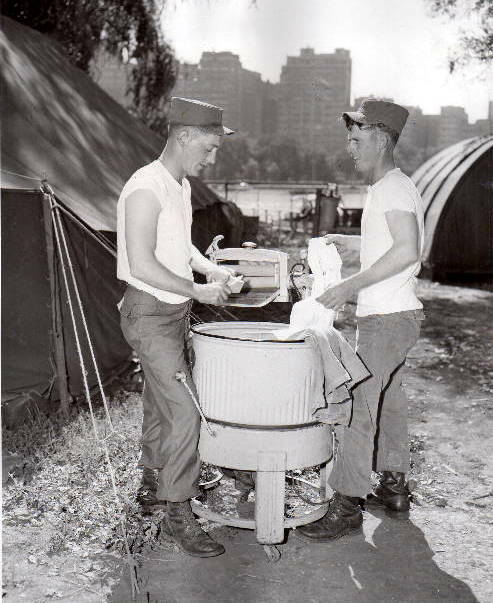 Another site was at Burnham Park with radar towers at 37th Street, and the third was at Jackson Park with its radar towers at Promontory Point. 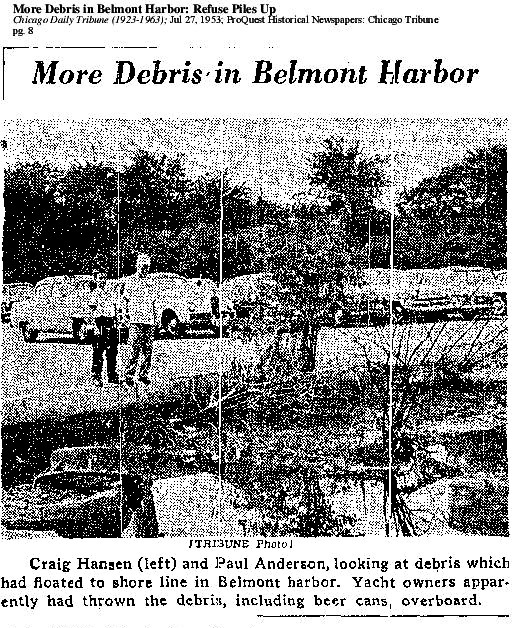 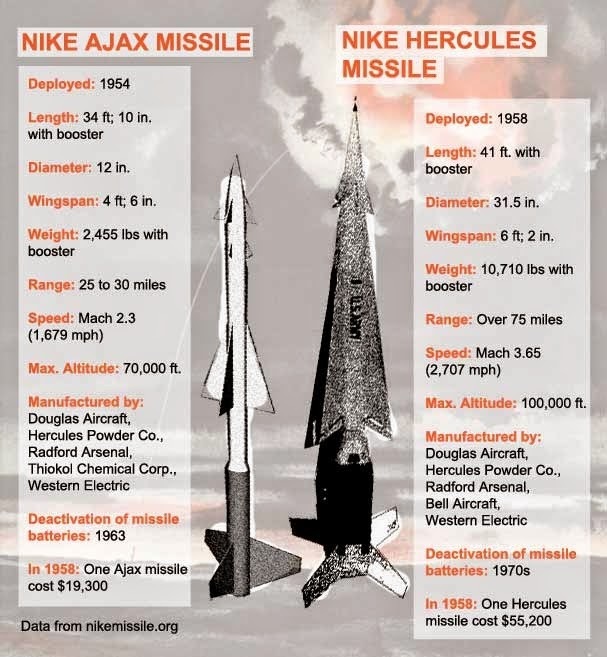 According to a Chicago Tribune article from Aug. 30, 1958, the Belmont location was the first local site to receive the Hercules missiles upgrades. 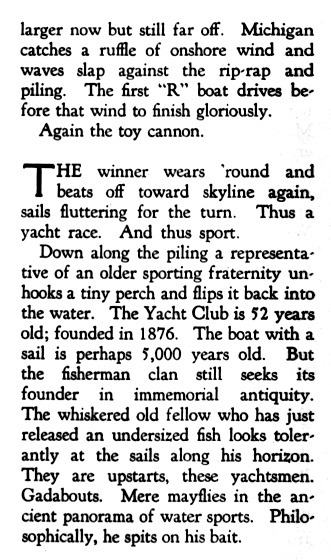 ... along with this article. 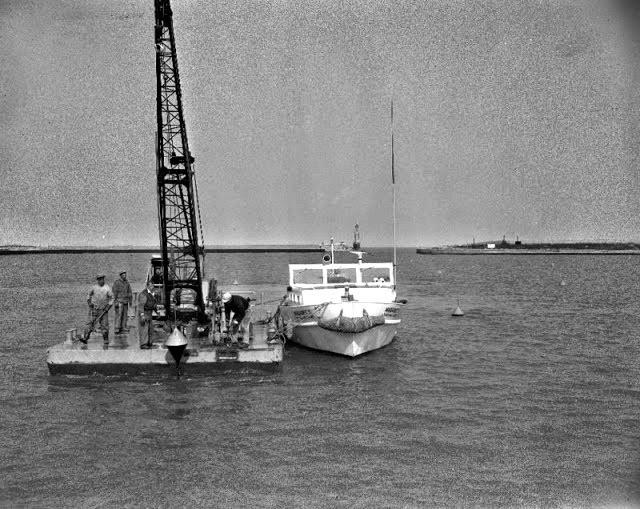 and the pilot swimming to shore. 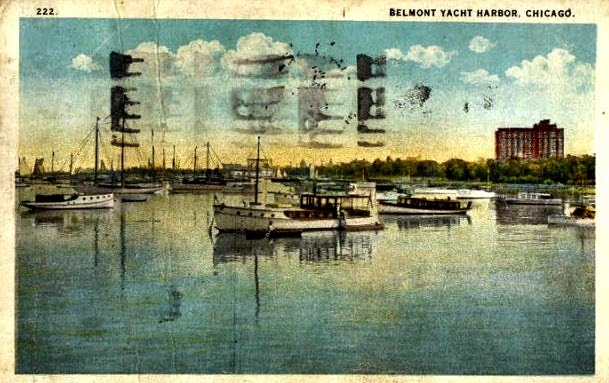 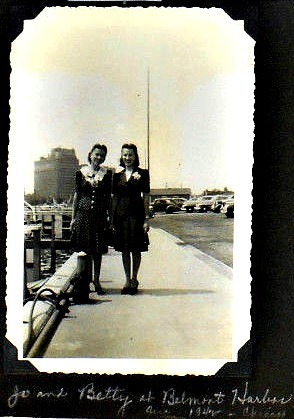 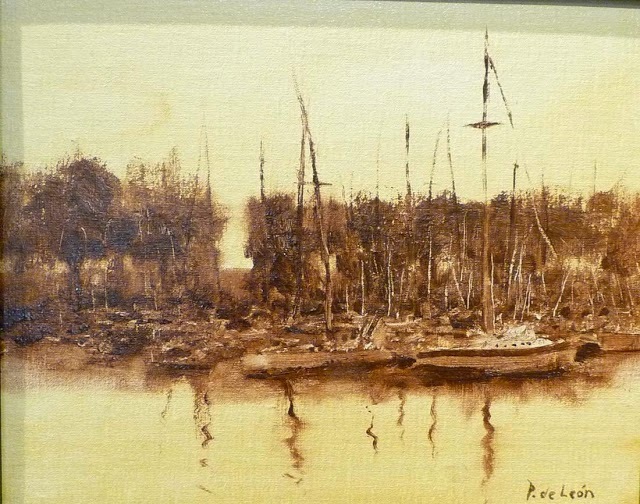 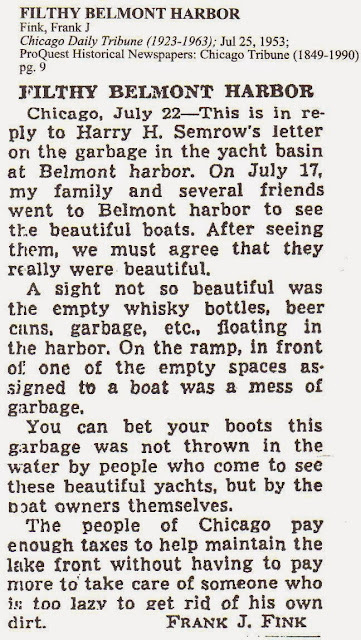 "My grandfather had his boat at Belmont Harbor in the 50's and 60's. The skyline has certainly changed over the years since then. Here's a group of 35mm slides taken in 1960's from the back of 'The Rogal' at its' slip in the harbor." 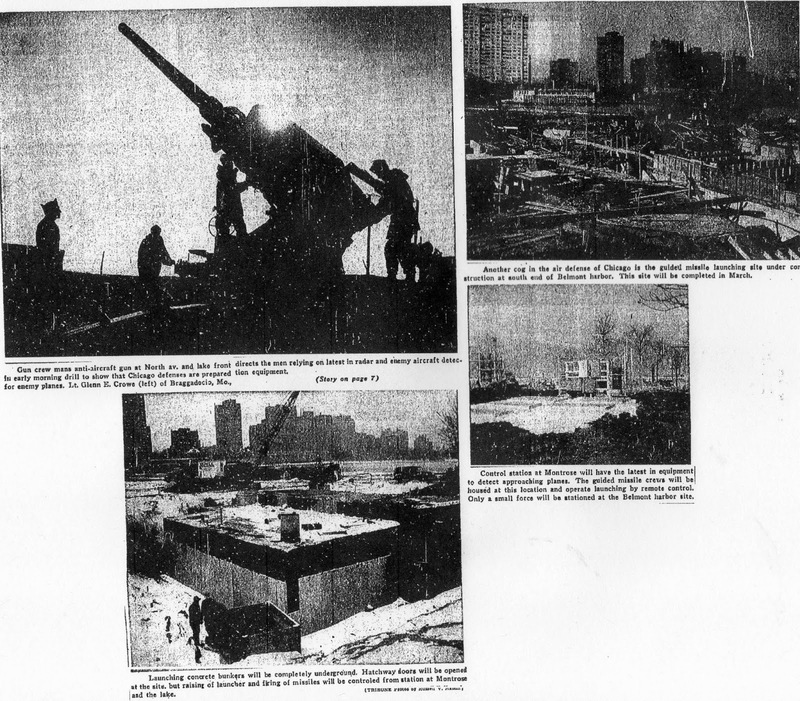 Fifty Native American protesters fled the abandoned Nike - Hercules missile site near Belmont Harbor after a police intervention. 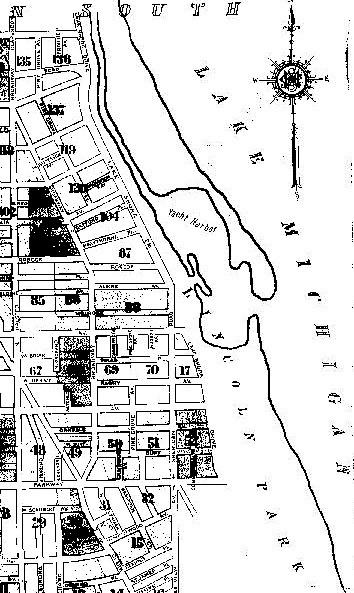 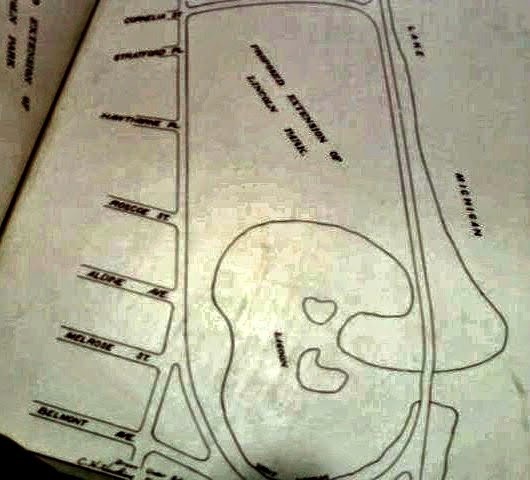 The Lake View/Uptown area had a large Native American population. 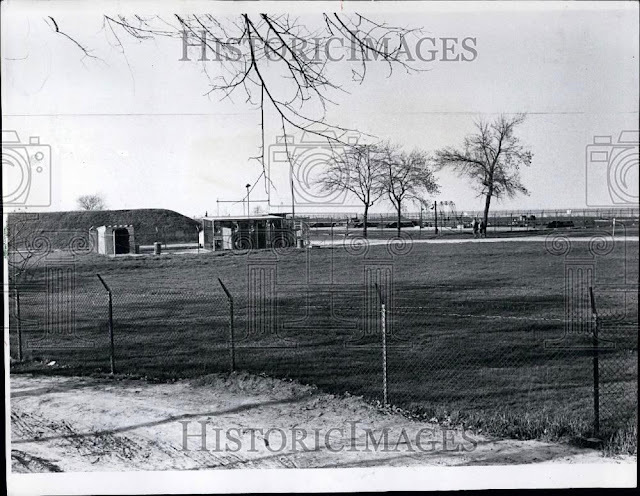 This military area at the harbor area was called the C-03 Launch Area located between Montrose and Belmont Harbors from October 1955 - June 1965. 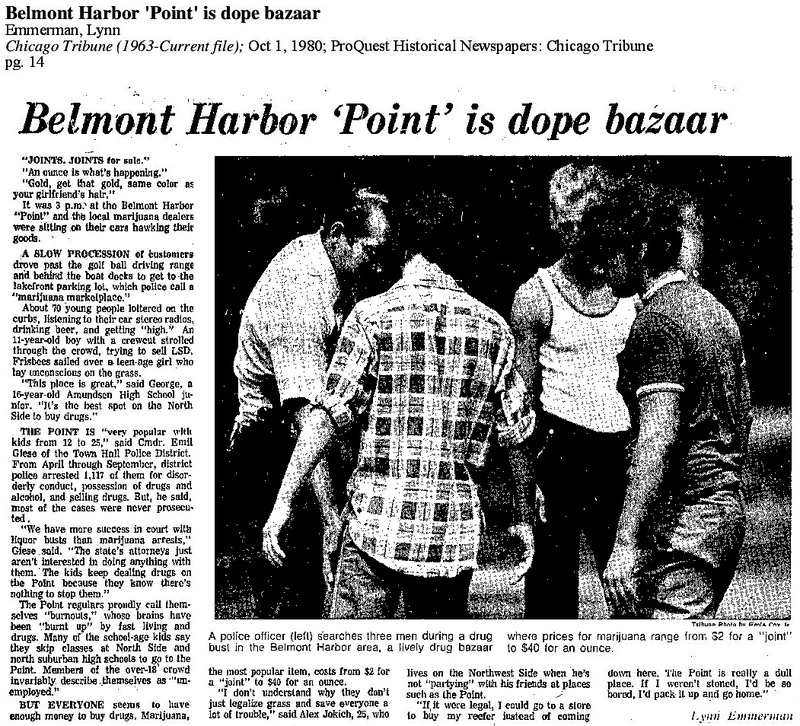 The 1970's was the time of liberation groups who lacked voice in their own communities. These articles tell a tale of protest and recognition. 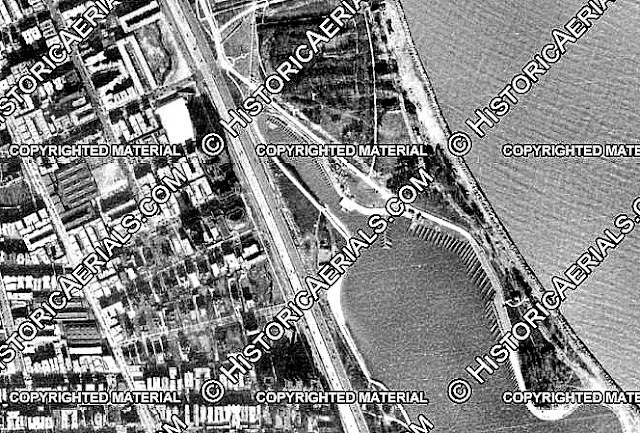 The protest and occupation of the missile site began as a simple protest at Wrigley Field and then migrated to the harbor. 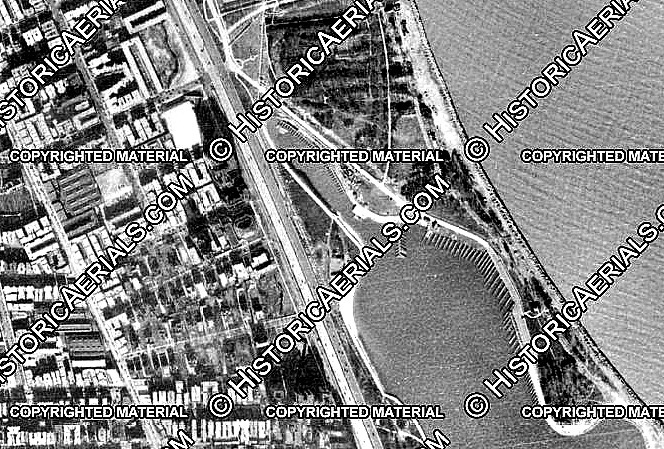 View the video (begin at 7 minutes 30 seconds) on the movement that lead to the occupation of that military site. 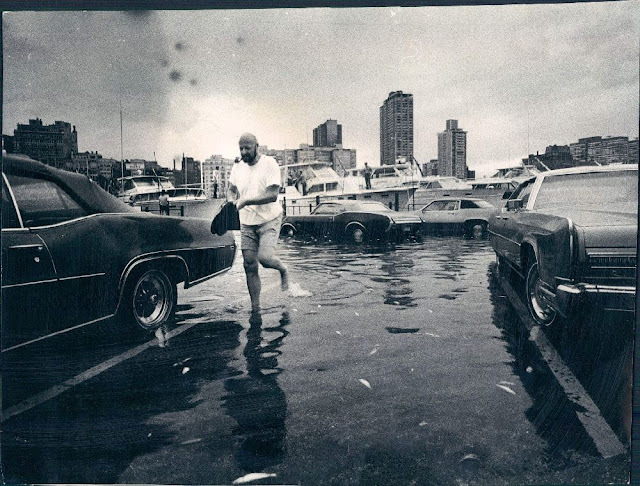 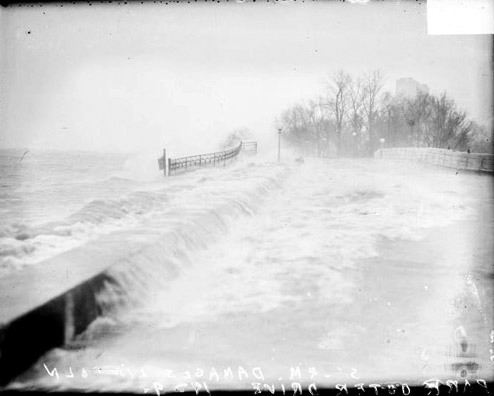 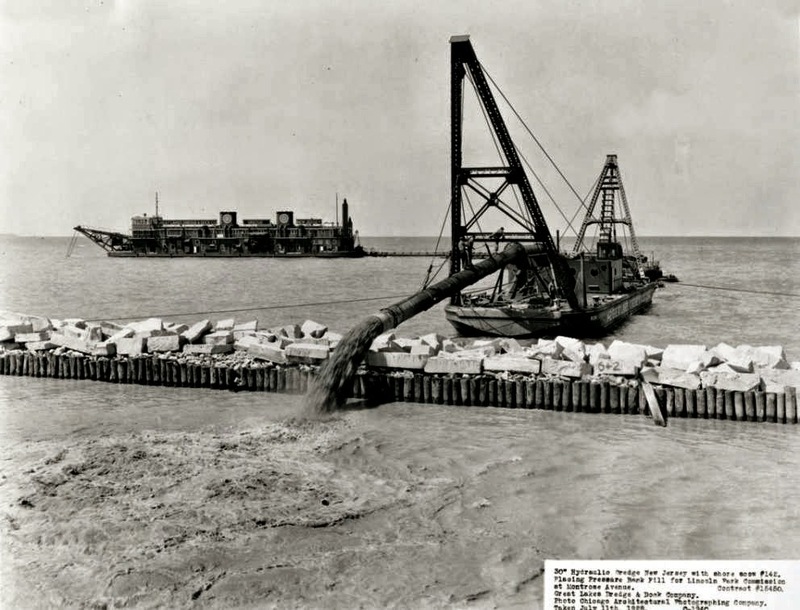 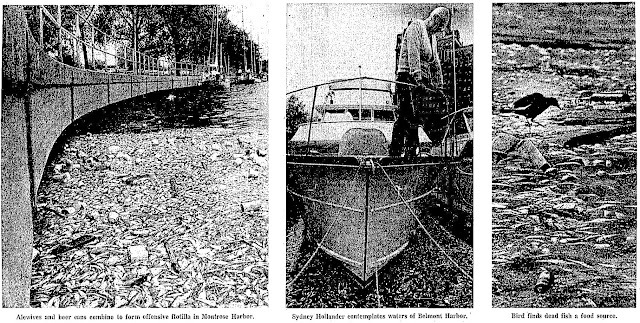 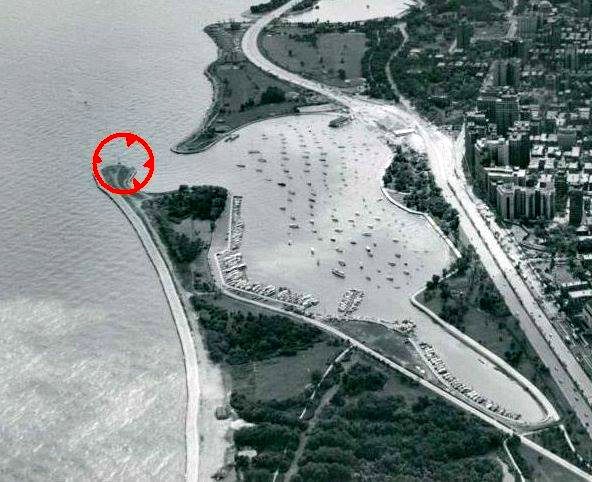 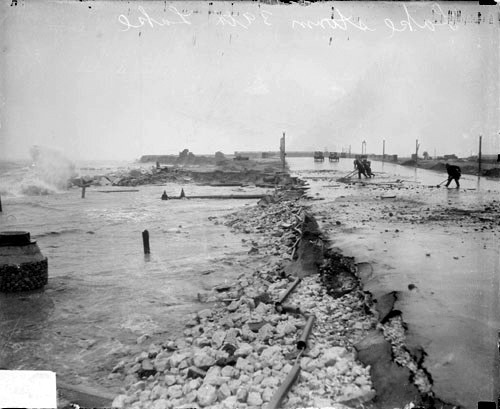 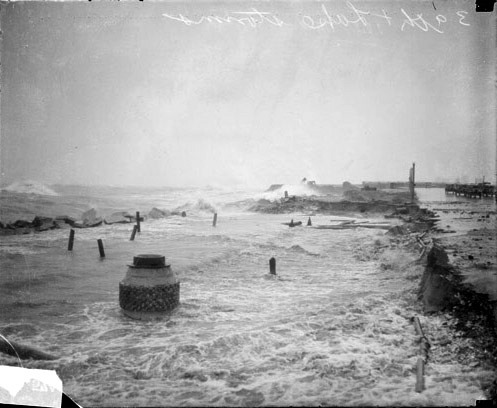 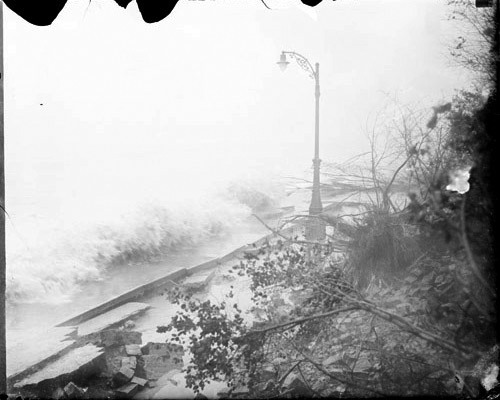 The most costly seiche occurred in 1954 with the most loss of life at North Avenue Beach when a 10 foot wave washed fisherman into the lake ... and then again in 1962. 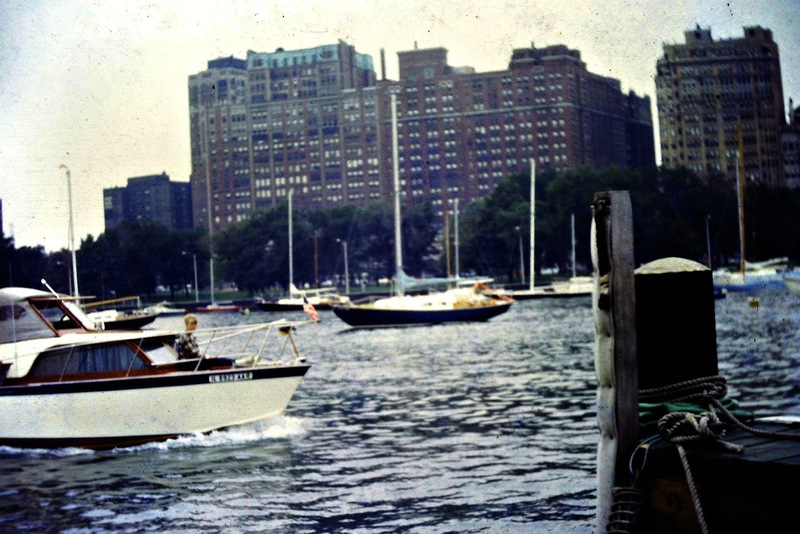 Follow the conversation on Facebook on this one! 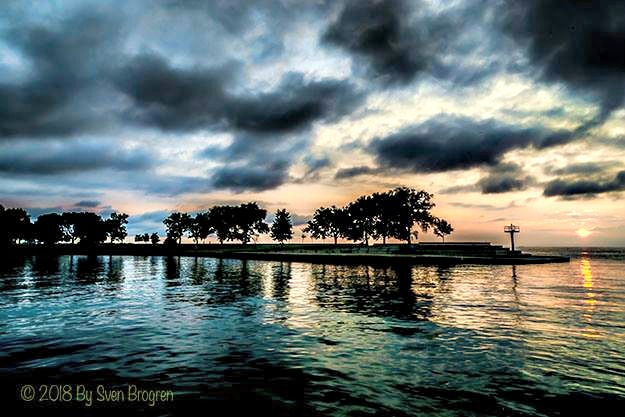 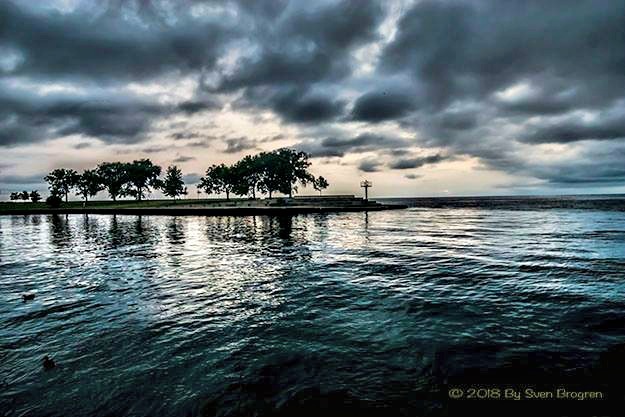 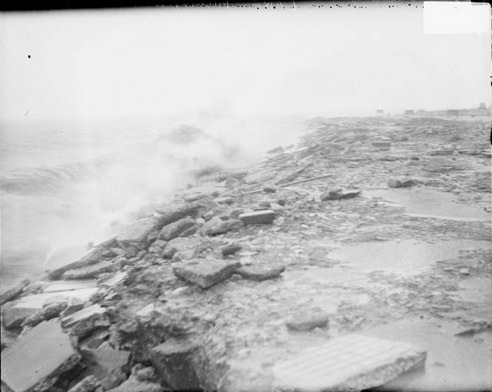 There was a section of the 'rocks' - the shoreline made of limestone boulders that was to protect the storm episodes of the lake from the land - that were patronized by LBGTQ residents and friendly visitors of the area during the late 1970's until the anti-erosion project of the 2000's. 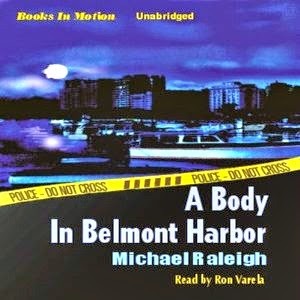 The Belmont Harbor area of the rocks was a place to be safe from the anti-homophobia of that time. 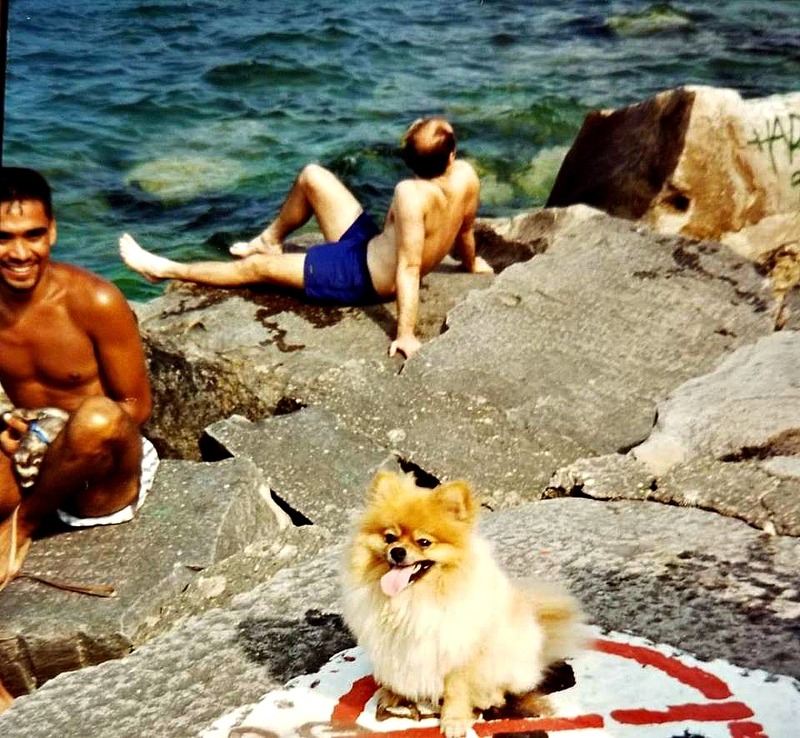 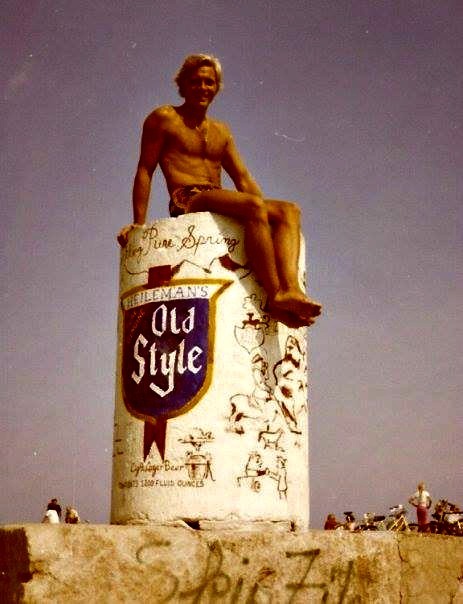 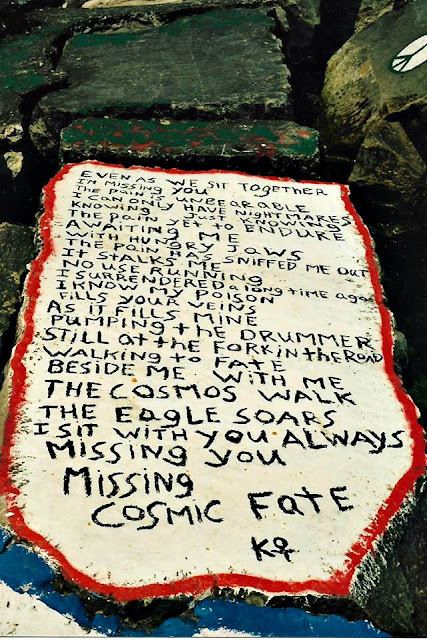 Patrons of the rocks would not only gather in a safe place to sunbath and express themselves freely but would create art on the limestone, now long removed but luckily the photo evidence remains to see. 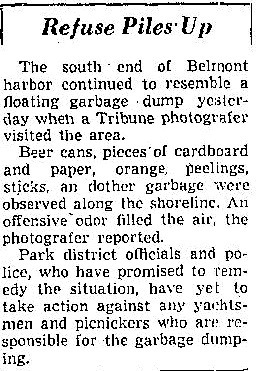 And again in 1975, a slick of 1000 gallons of oil meanders towards Belmont Harbor from a freighter. 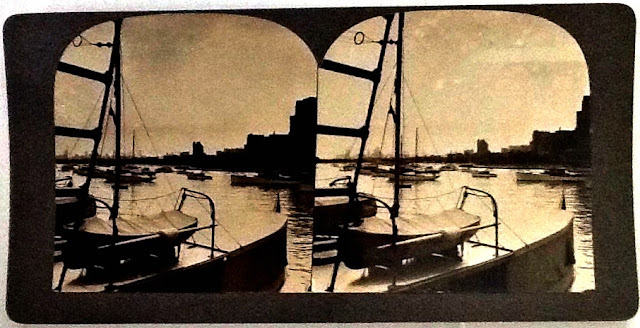 View the two images below. 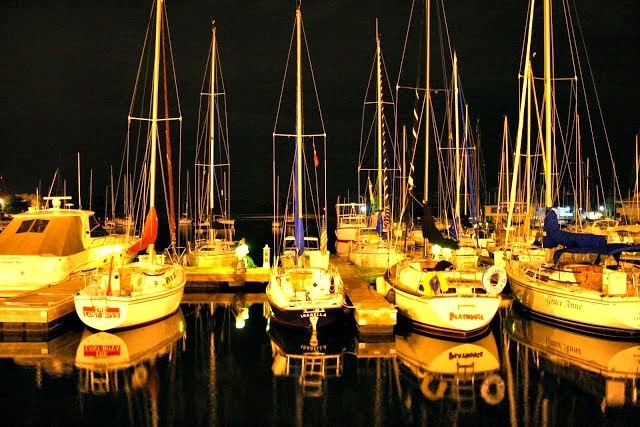 held at the harbor for the first time. The following are comments from social media site called Everyblock about the unofficial yet professionally done firework display north of the harbor. Comment 1 - It was a group of renegade citizens concerned about the city failing 2 truly entertain us with their lame fireworks shows...these young robin hoods will keep bangin it out @ belmont every year 2 make sure everyone in the city gets a proper fireworks show 2 escape the dreary economic realities of city life. 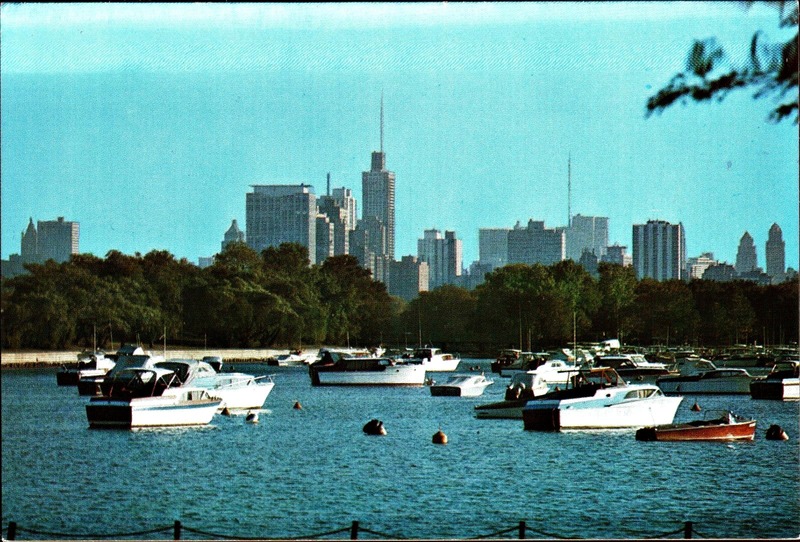 Comment 2 - I want to be a renegade robin hood!! 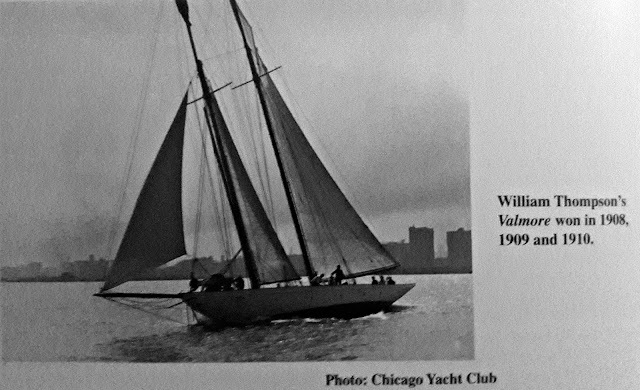 Let me know if there is a way to help out next year or if there are other fun projects planned at other times of the year. 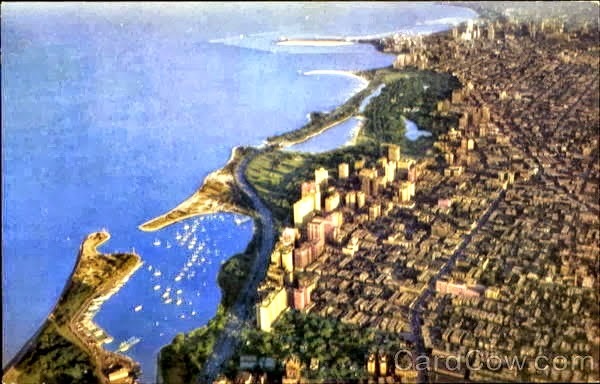 Comment 3 - My friends plan on doing it every year for as long as possible...we keep it safe & super impressive since the city decided not 2 entertain us anymore...hopefully, other folks will get inspired 2 fight back & take everything into our own hands ... we'll just start building our own solar panels & wind mills block by block until we destroy the system. 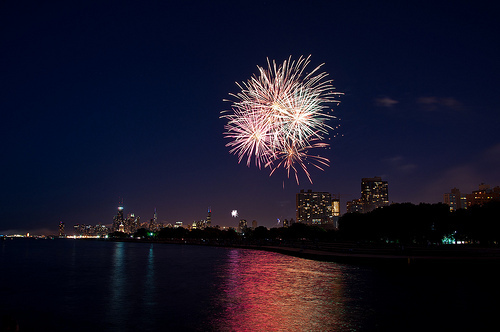 This annual event occurs during the first days of Spring. 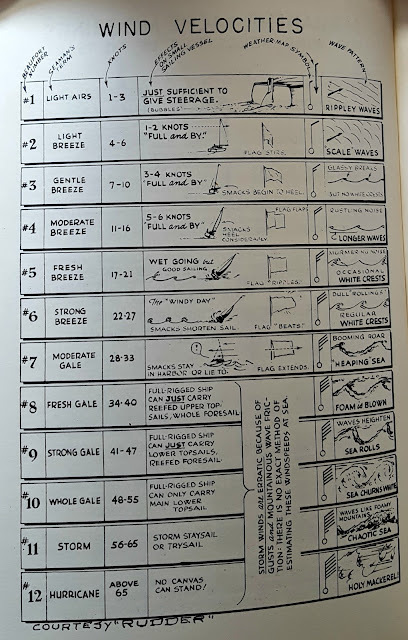 web page under the section Power Fleet. 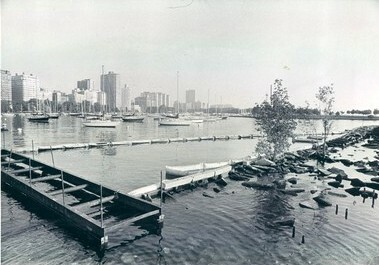 In 2011 they opened an outdoor location just south of Belmont Harbor in Chicago Park District's Lincoln Park. 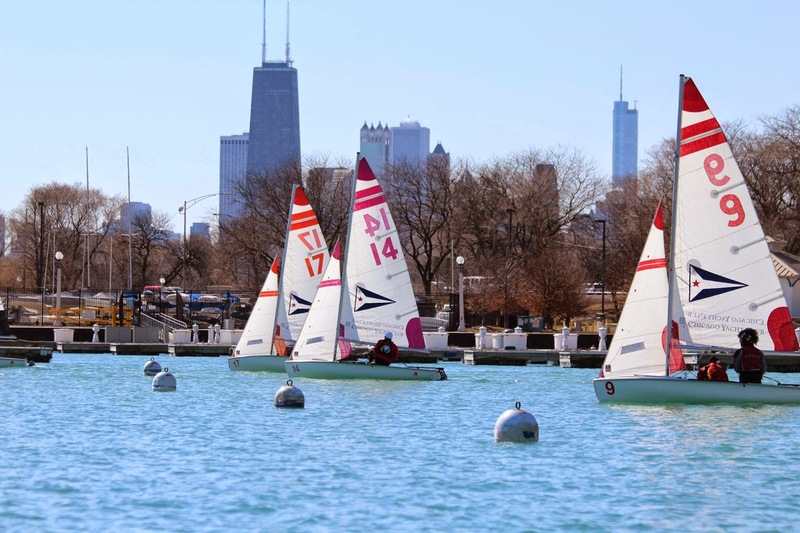 This school was an instant hit, and we added an indoor location at the Chicago Park District's Broadway Armory in spring 2012. 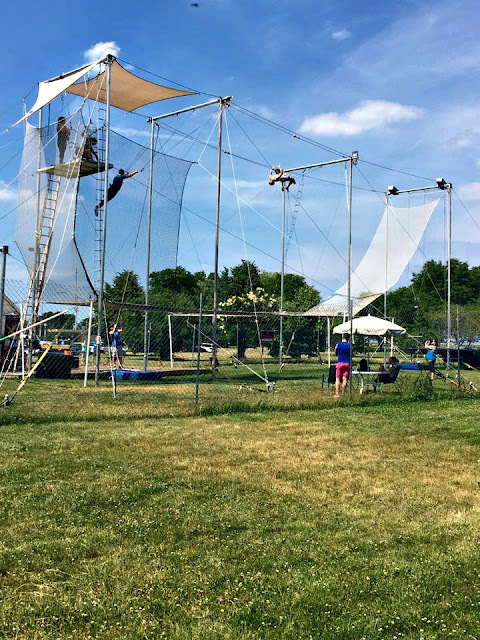 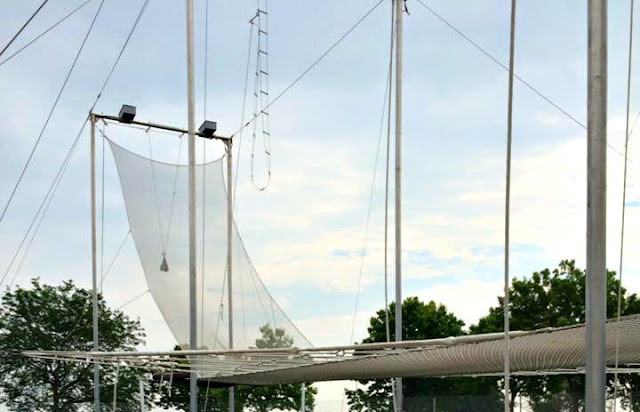 This school continues to grow its community under the leadership of General Manager Steve Hammes, who discovered that teaching flying trapeze is just as much fun as performing juggling in the circus. TSNY Chicago hosts a number of summer camps for kids in collaboration with the Chicago Park District. Bonnie Miller manages our retail office in Chicago and is also our National Front Office Operations Manager. 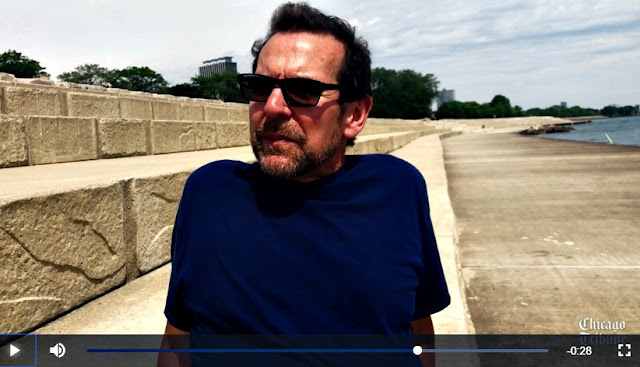 View some of the performance videos from their unofficial Facebook page! It was the Victorians (aristocrats of the 1800’s) who made Mackinac Island one of the nation's most favored summer resorts. In the post-Civil War industrial age and before automobiles, vacationers traveled by large lake excursion boats from Buffalo, Cleveland, Chicago and Detroit to the cooler climes of Mackinac Island. 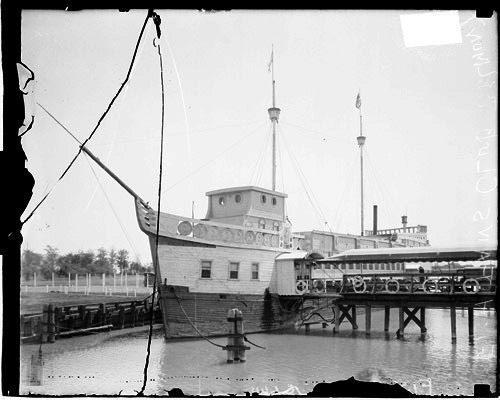 They danced to Strauss' waltzes, listened to Sousa's stirring marches, dined on whitefish and strolled along the broad decks. 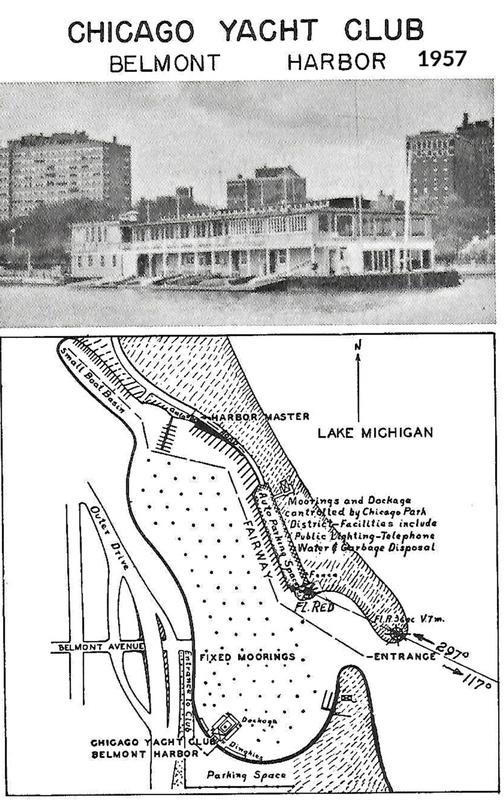 To accommodate overnight guests’ boat and railroad companies built summer hotels, such as the Grand Hotel in the late 19th century. 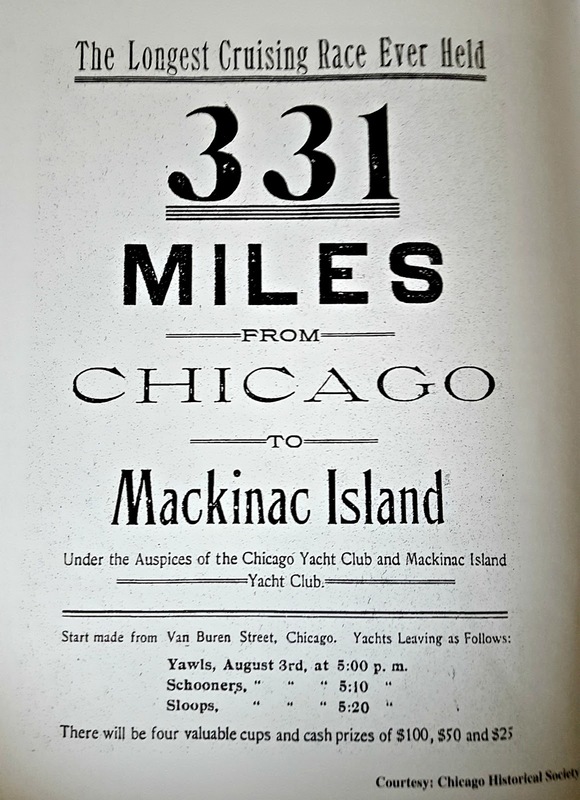 Victorians, like travelers everywhere, shopped for souvenirs, and Mackinac shops supplied them. 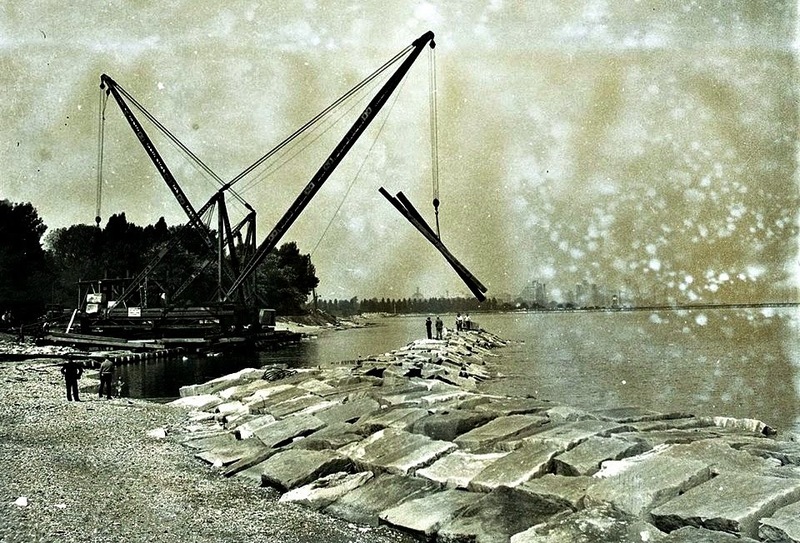 In the 1890's wealthy Midwestern industrialists who wanted to spent more than a few nights on Mackinac built their own summer cottages on the east and west bluffs. 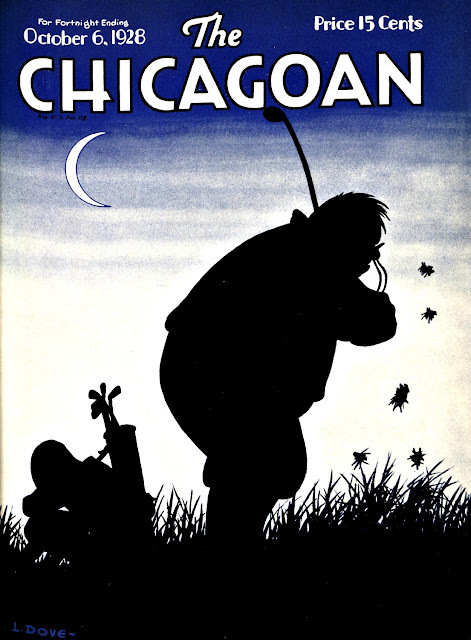 Soon a social life [would include] tennis, hiking, bicycling, examining the local natural wonders, and at the turn of the century, golf at on the new Wawashkamo Golf Course. 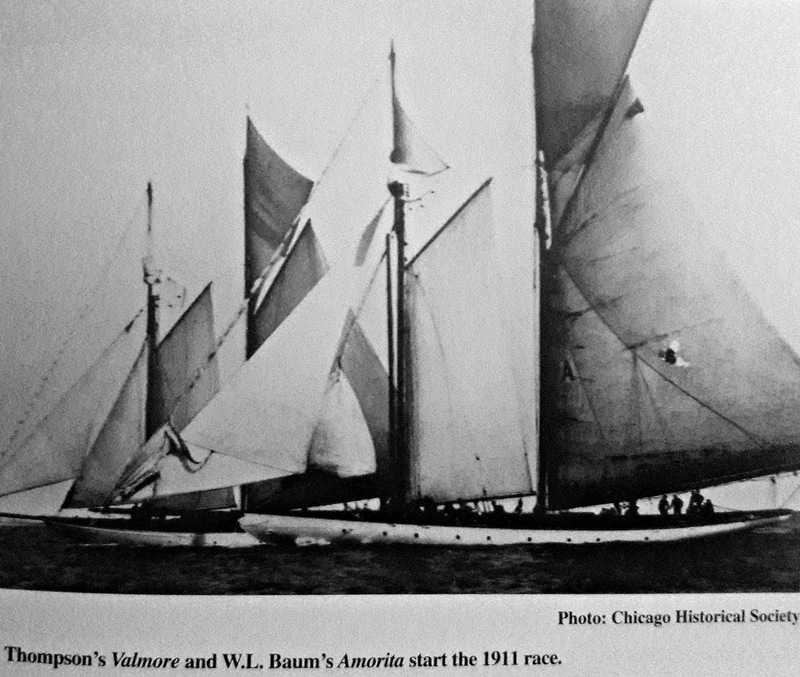 In 1898 the first race had only five participants. One of the crafts was a schooner owned and operated by Ben and John McConnell who both owned homes on Hawthorne Place. 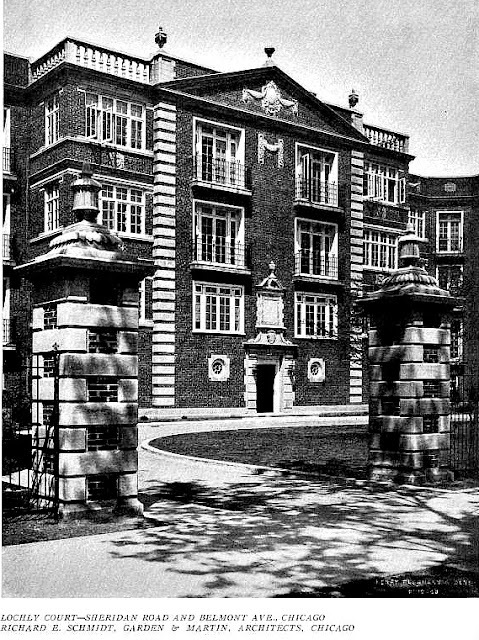 Their mansions still exist today. the owners Ben and John McConnell lived on Hawthorne Place during this time. 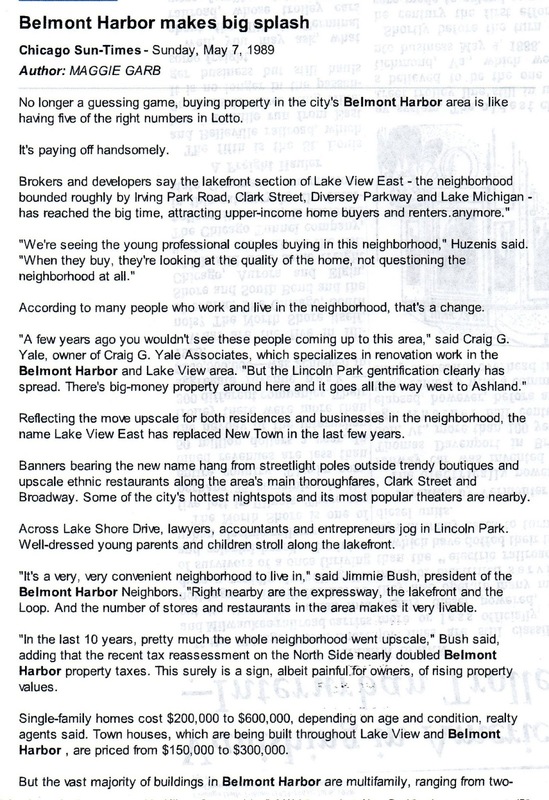 Their mansions remain as of 2016. 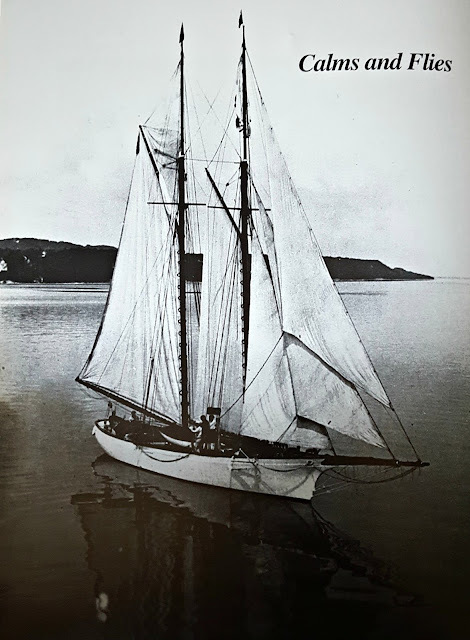 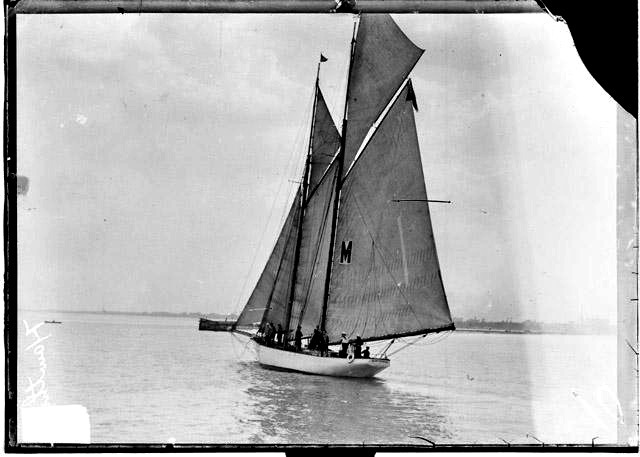 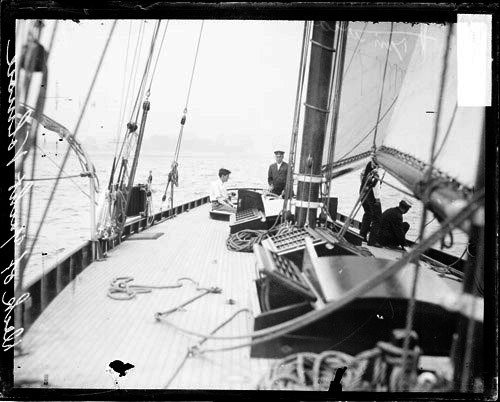 1905 First female skipper entered her schooner called the Lady Eileen. 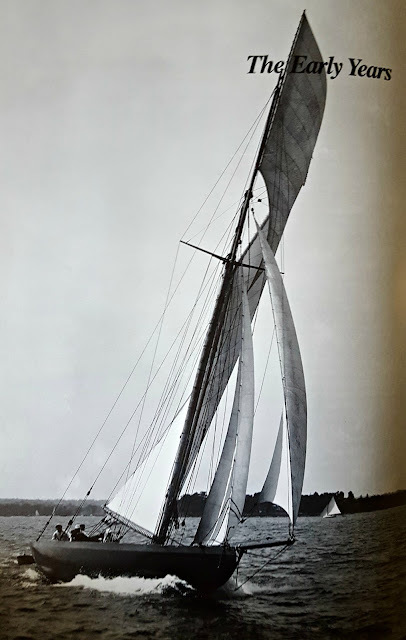 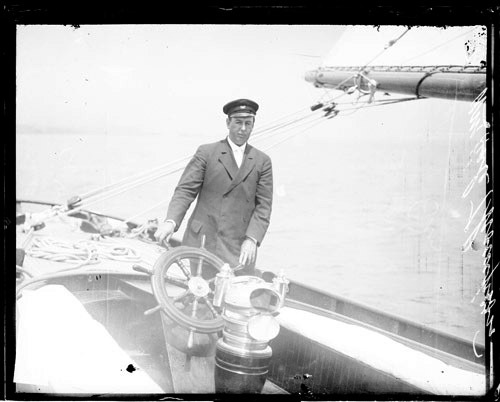 1908 The era of the large schooners begins when Bill Thompson of Chicago, later to be known as Mayor Big Bill Thompson enters his schooner, The Valmore. 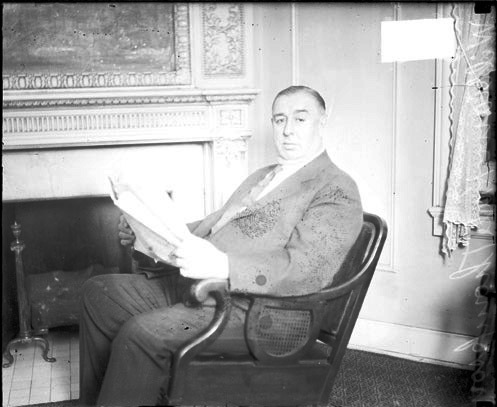 He would win in 1909 & 1910 as well. 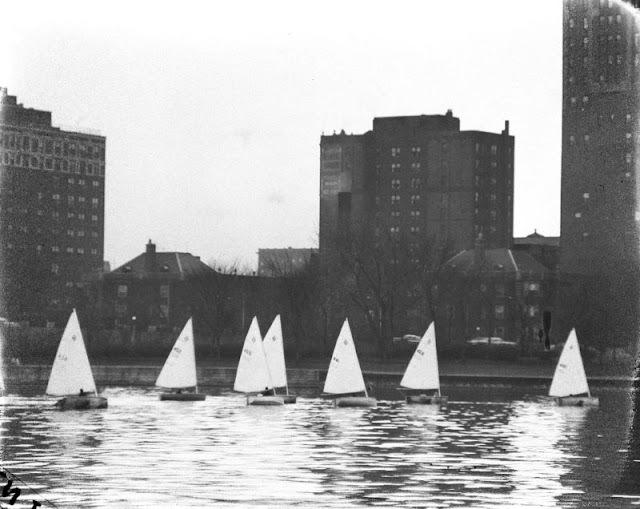 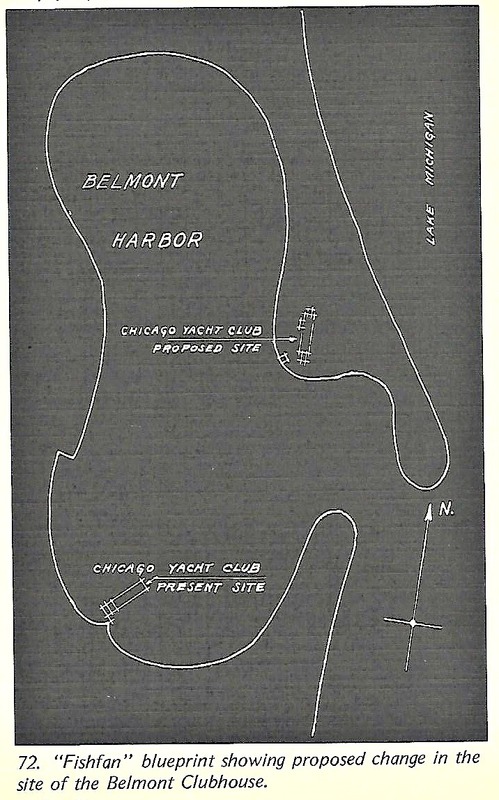 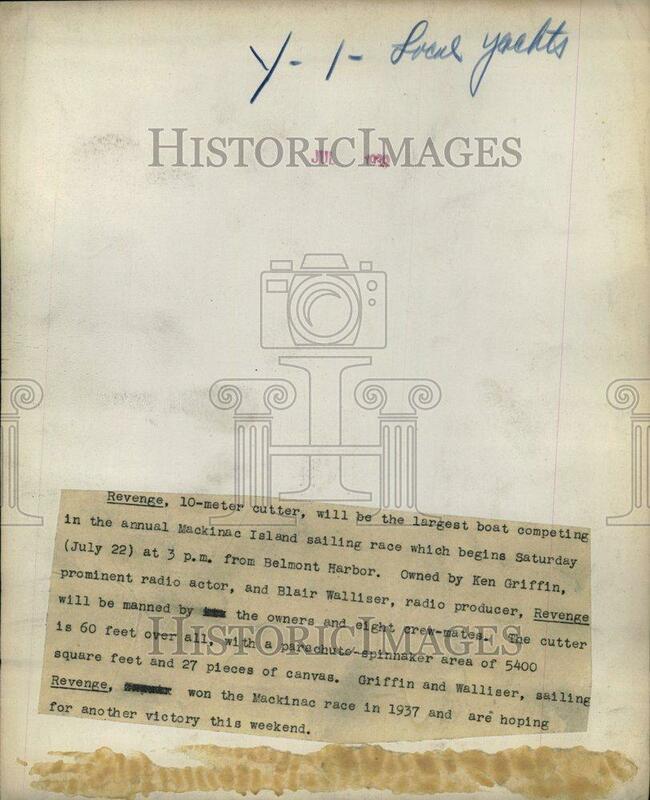 1920 Lincoln Park Yacht Club including Belmont Harbor Station joined Chicago Yacht Club. Also, that year Belmont Harbor Station is starting point in race. 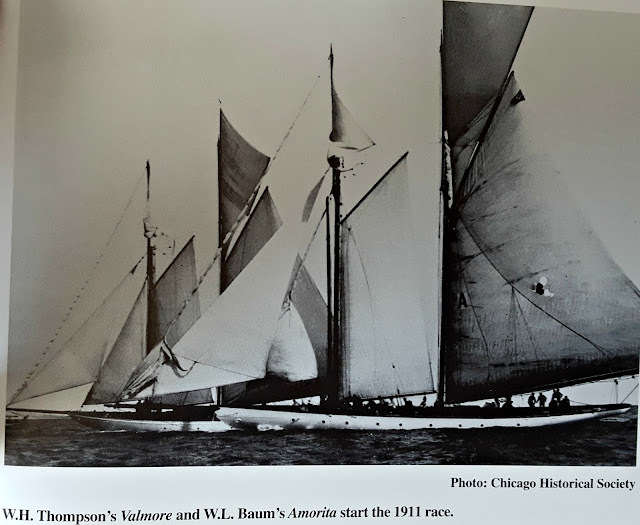 1925 One of the challenging races to date. 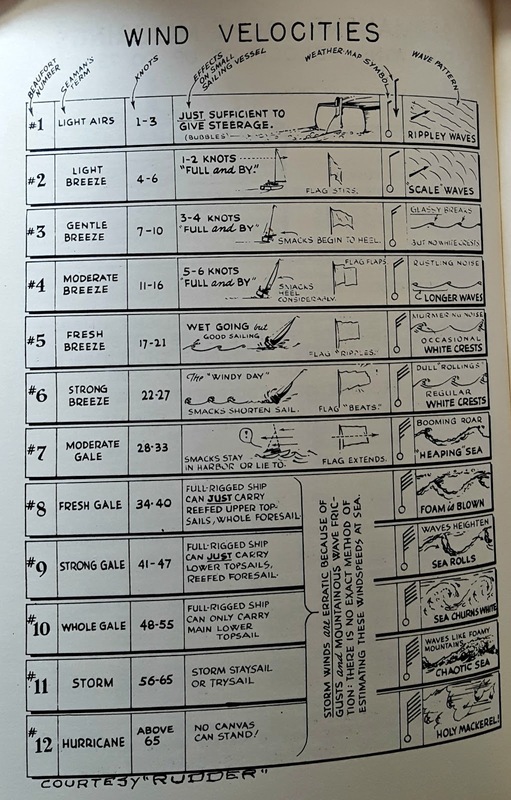 Only 8 out of the 21 entries finished. 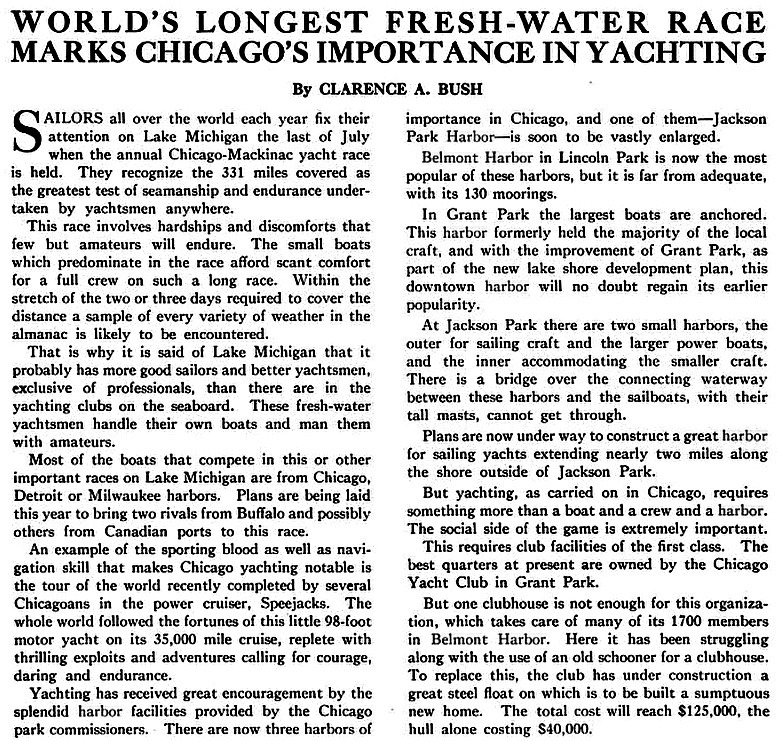 forty-three yachts while after the war in 1946 fifty-seven yachts participated the year. 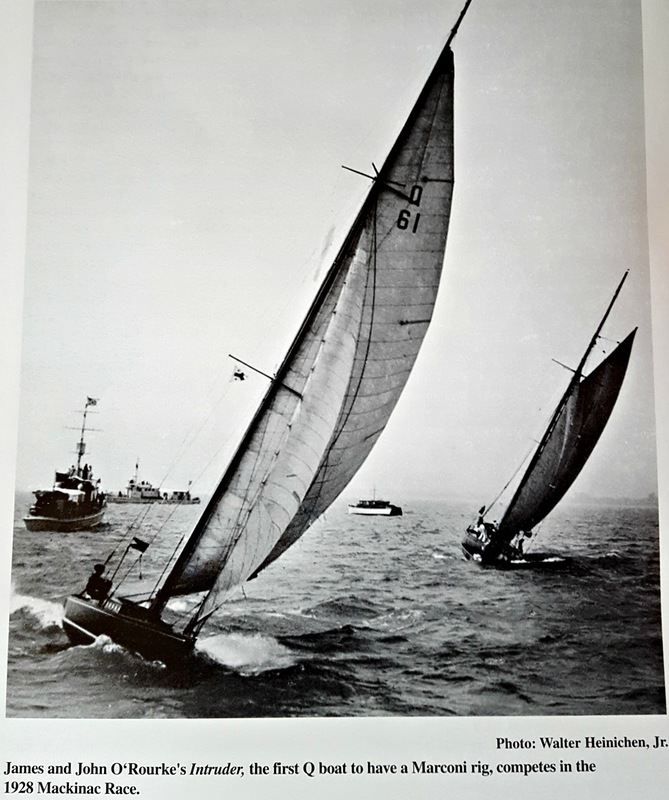 1955 The most time consuming race took almost 78 hours. 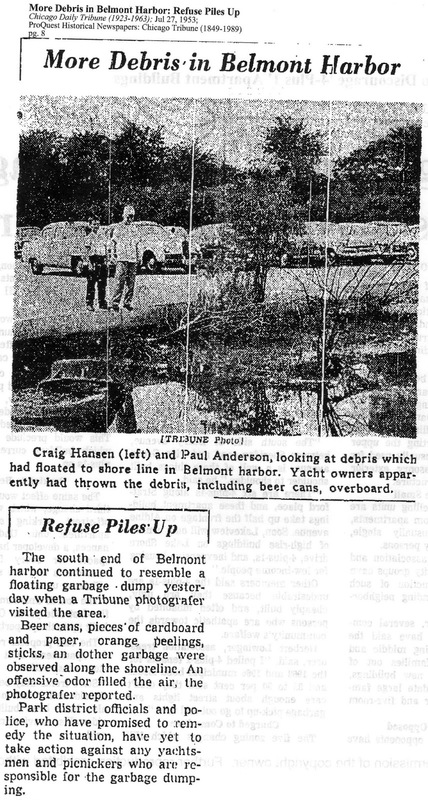 1970 Ted Turner and his American Eagle encounters gales exceeded 60 mph. Turner calls the lake a ‘mill pond’. 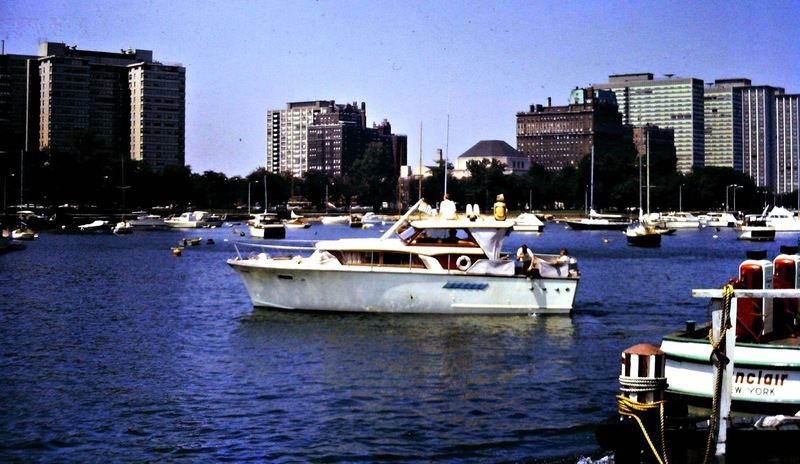 2000 Sixty boats were equipped with GPS devices. 2008 The 100th anniversary of the race to Mackinac Island. 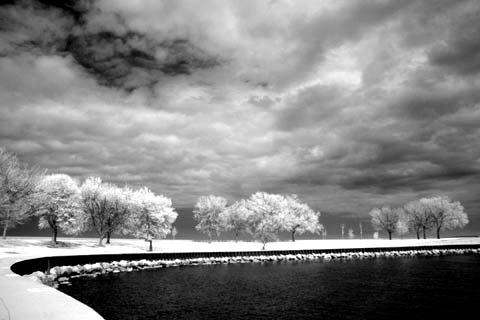 2011 A storm to remember via YouTube. 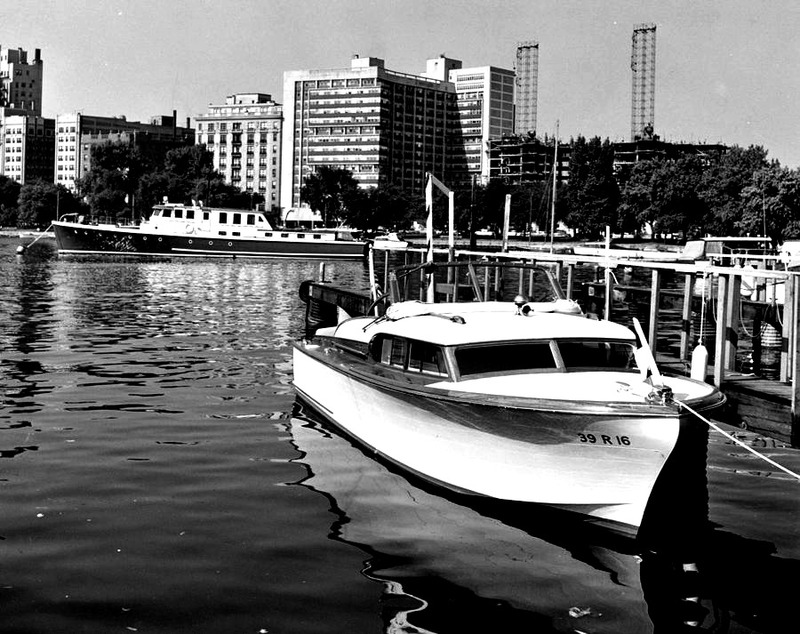 2013 View a more placid ride to the island vial YouTube. 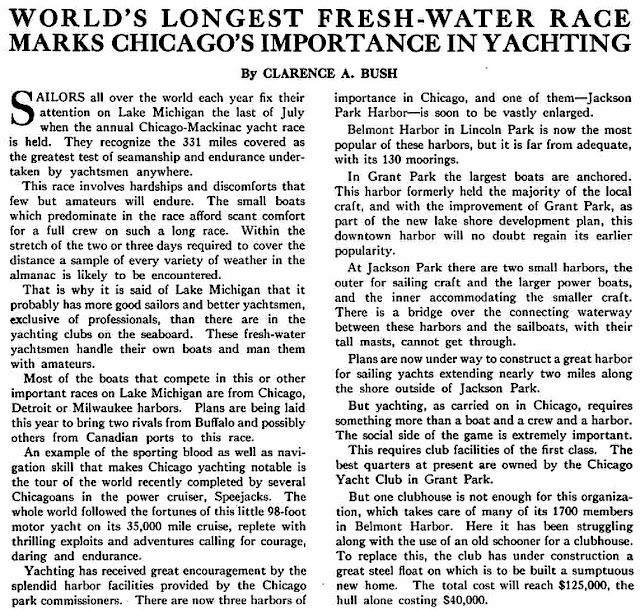 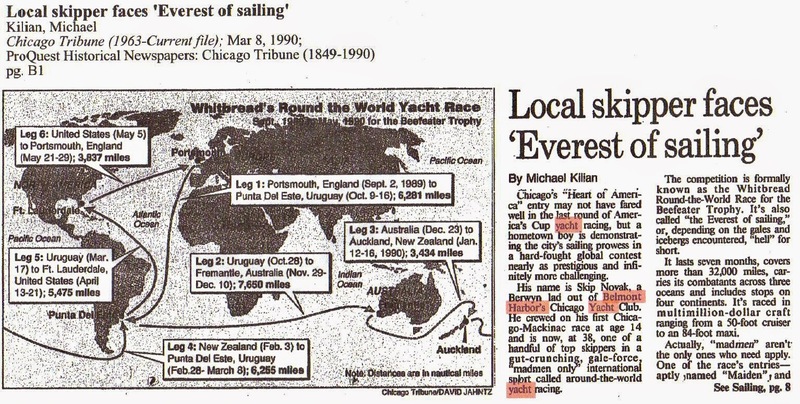 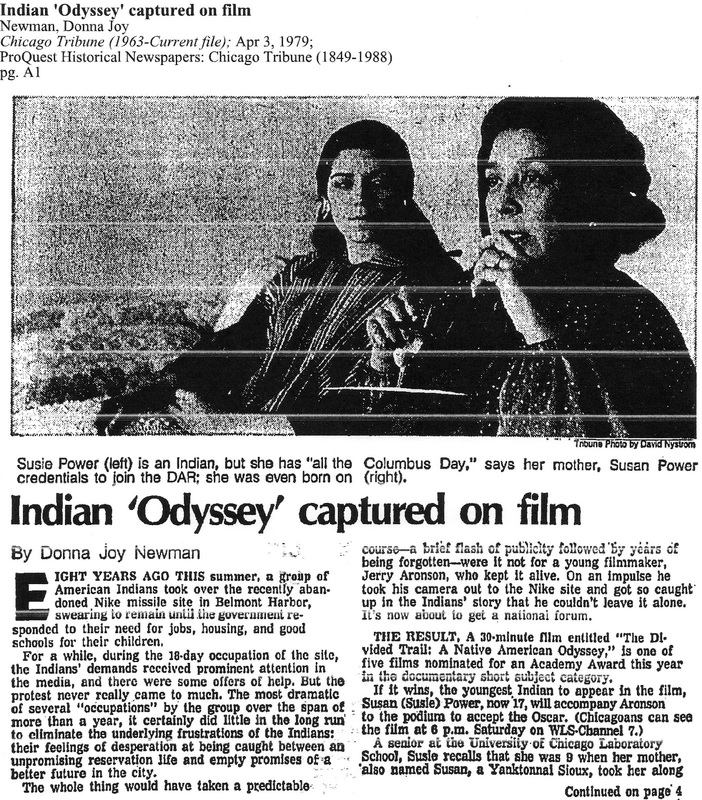 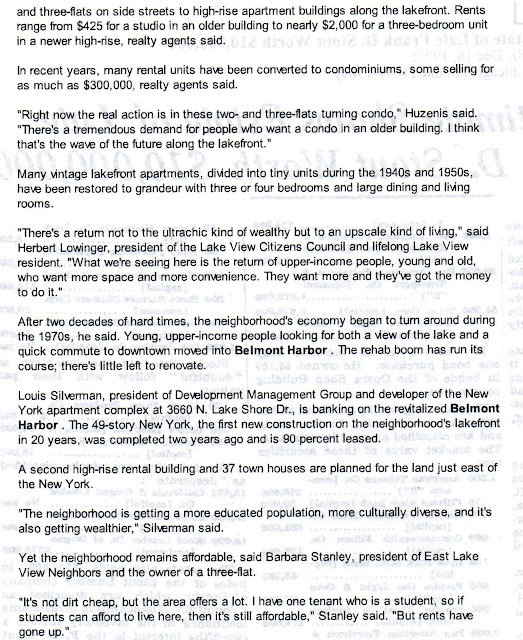 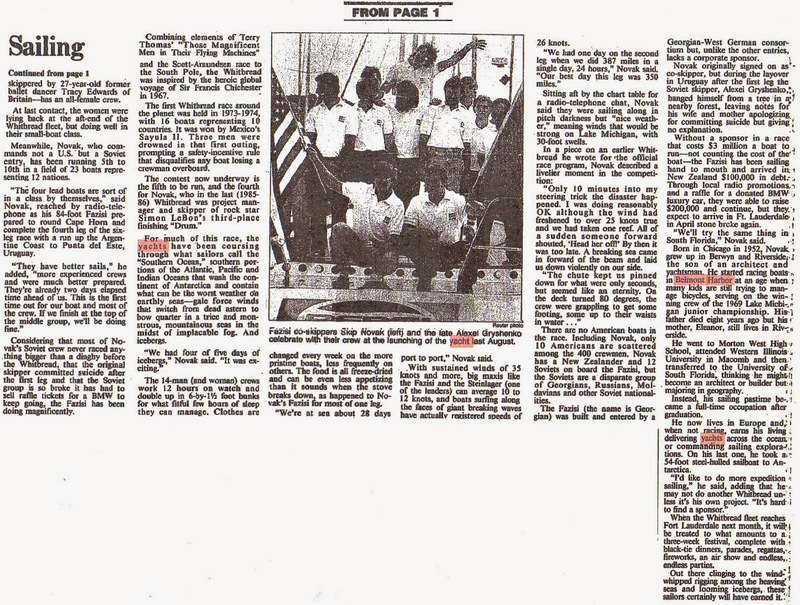 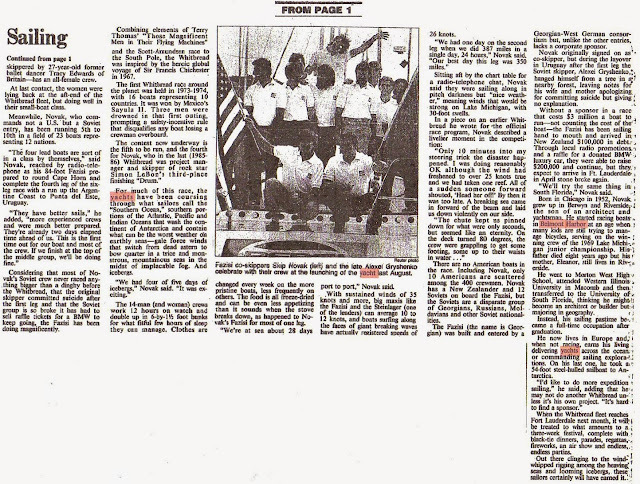 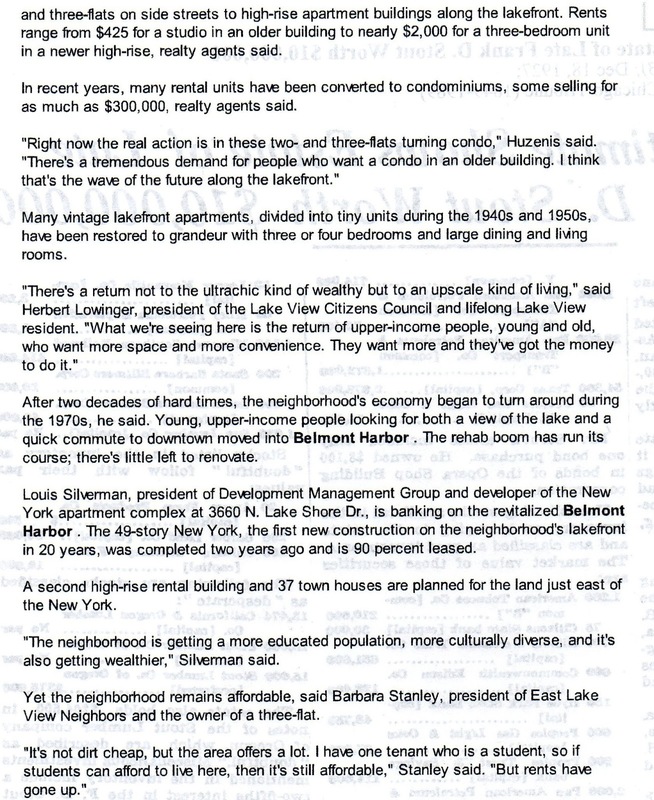 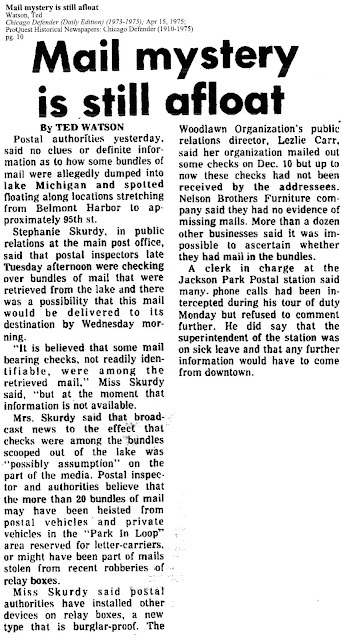 This is a sample of the many articles on the race located in the Chicago Library online newspaper section. 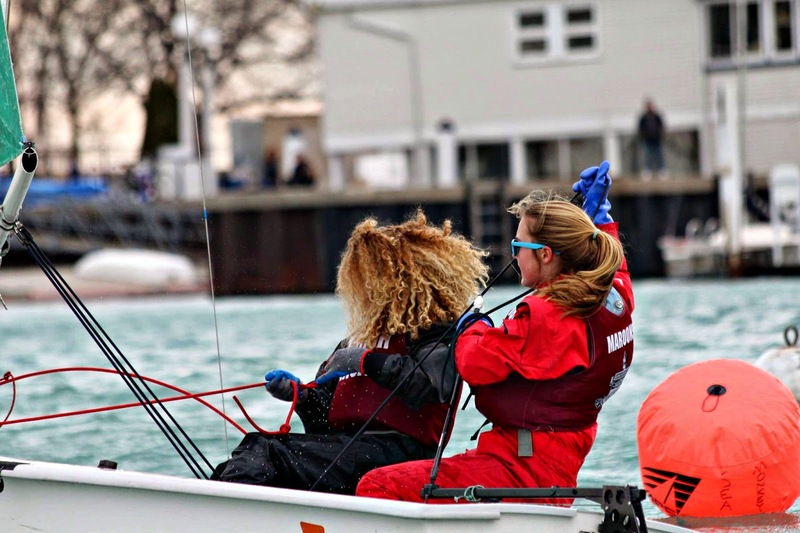 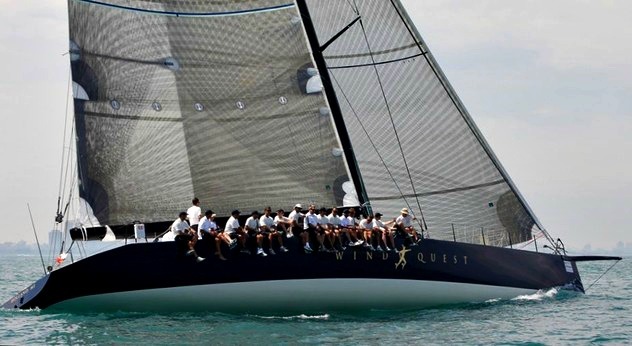 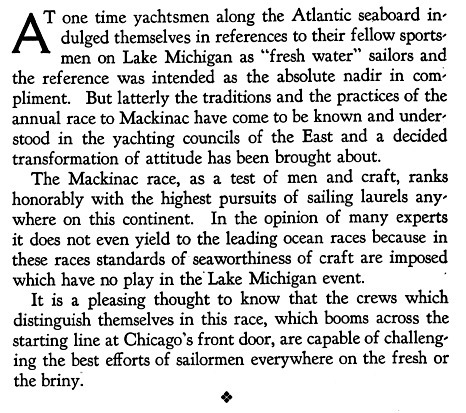 Just type the keywords Belmont Harbor and Mackinac for articles exclusively for our harbor and the race from it. 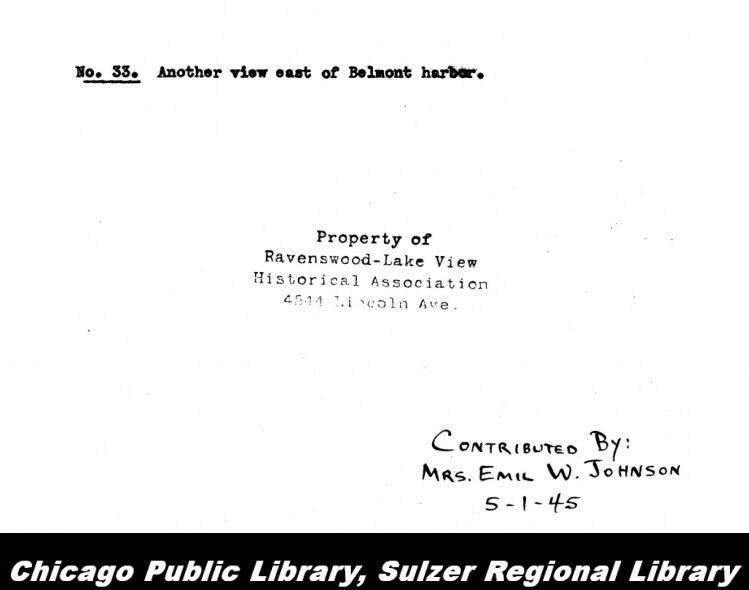 The researcher will need a library card number and zip code to enter the database of articles. 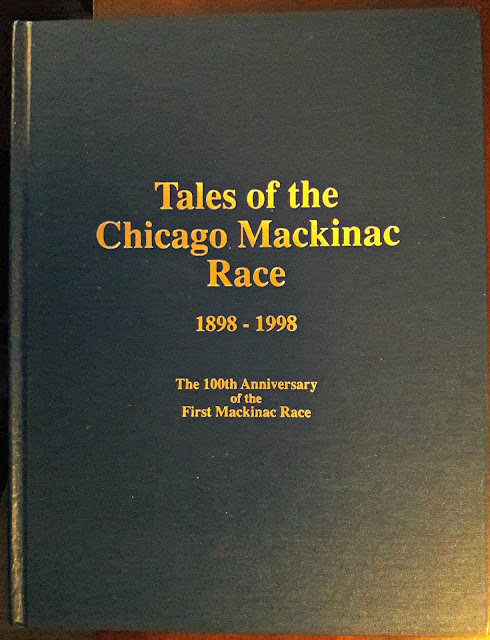 Read the more on the historical timeline of events of this race. 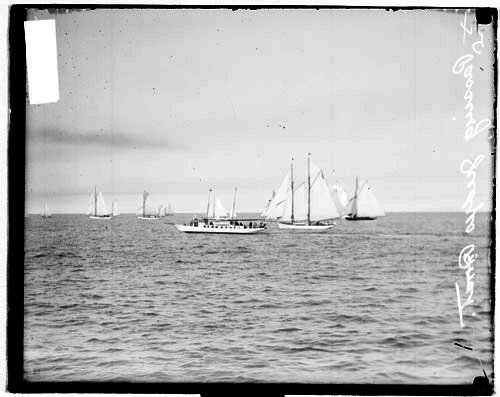 To review the results of the last race and the winners of that last race with this link. 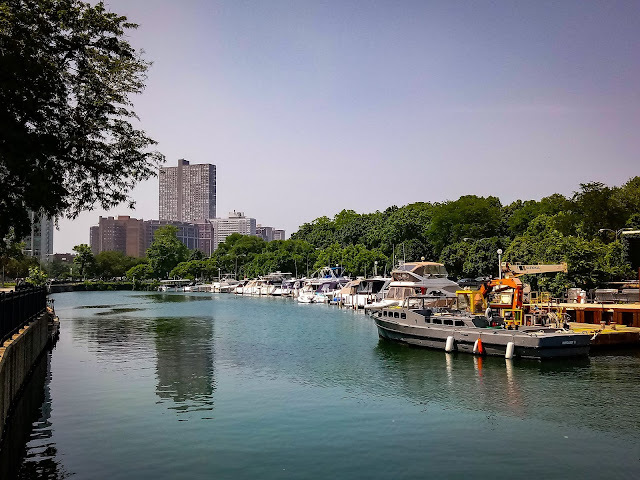 View a 44 minute WTTW journey via YouTube. 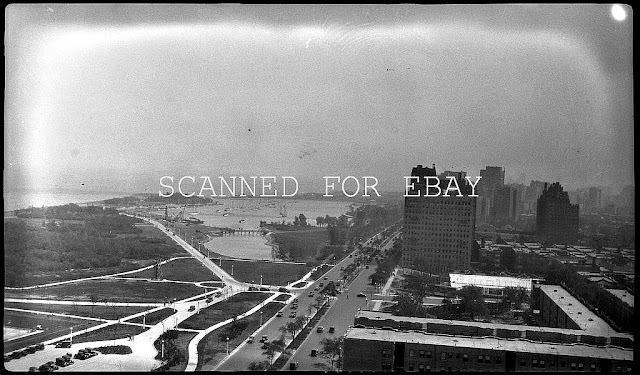 Also, view more current photography via Flickr.